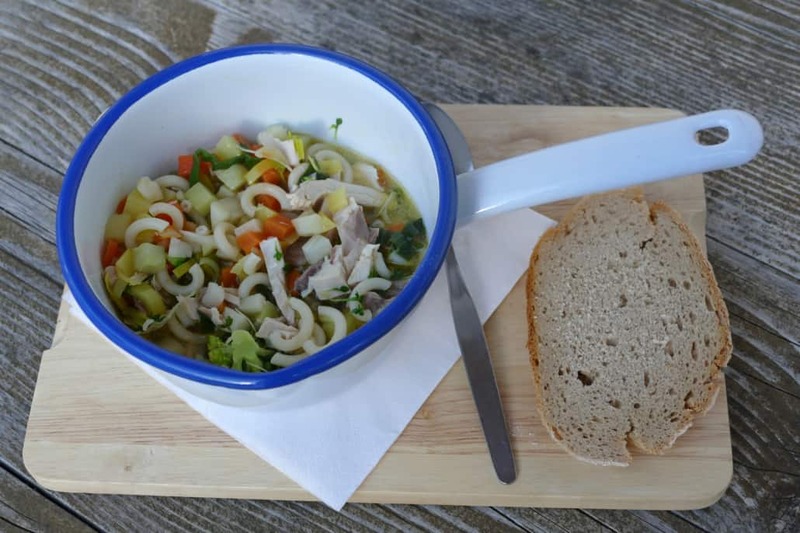 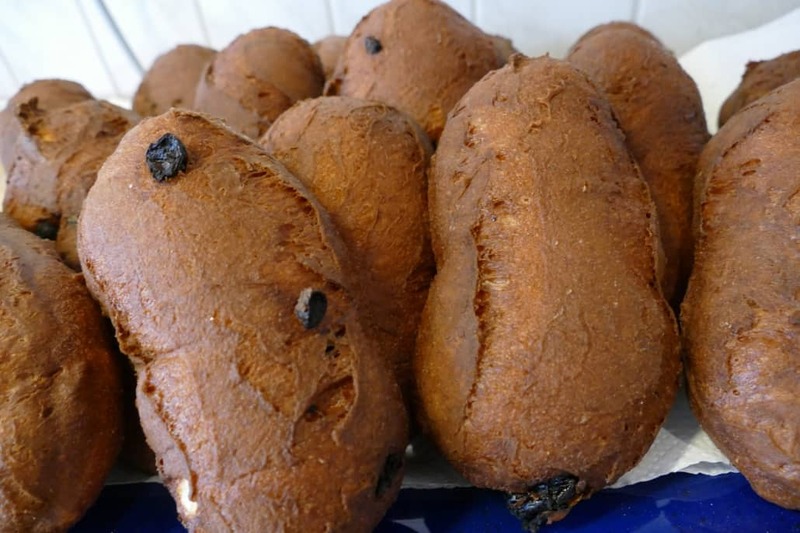 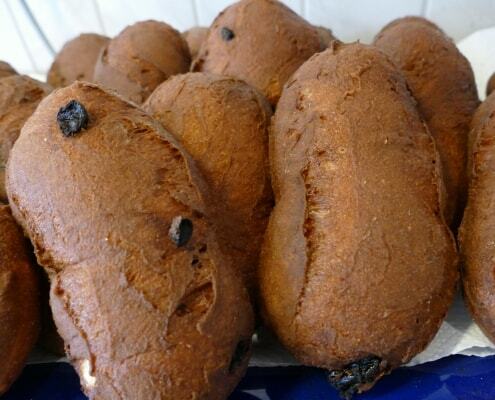 Original Schlierseer Striezl nach dem Rezept von da Schlierseer Oma – die Besten!!! 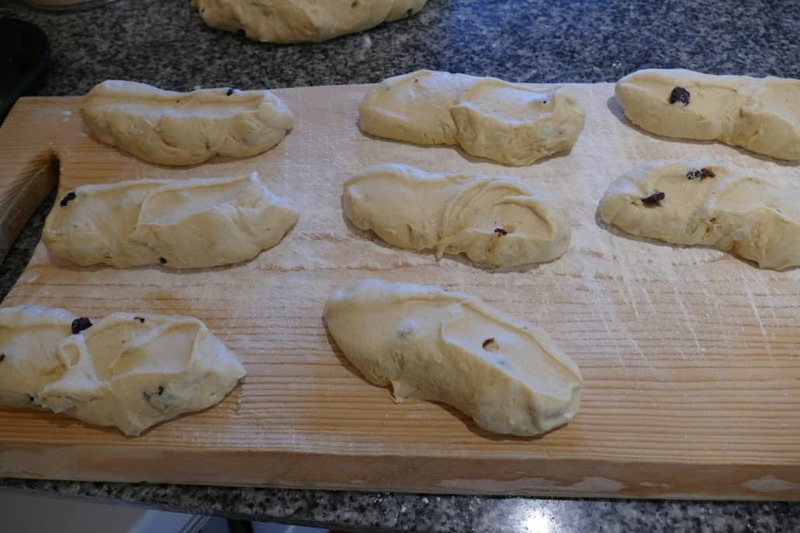 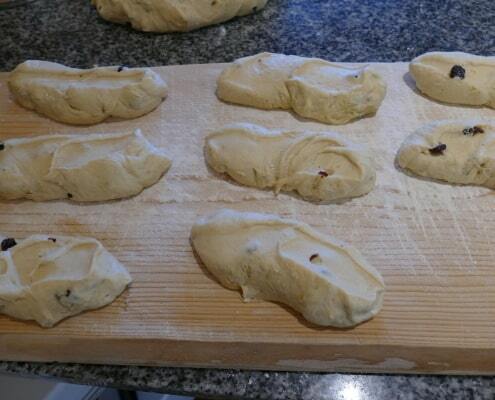 Eigentlich kann man die Striezl des ganze Jahr backen und genießen. 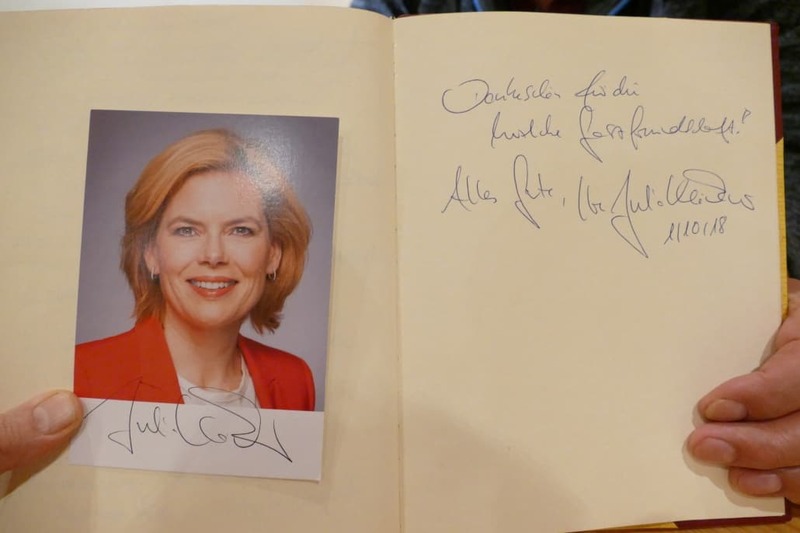 Eine Spezialität, die viel zu schade wäre, um sie nur an bestimmten Tagen zu genießen. 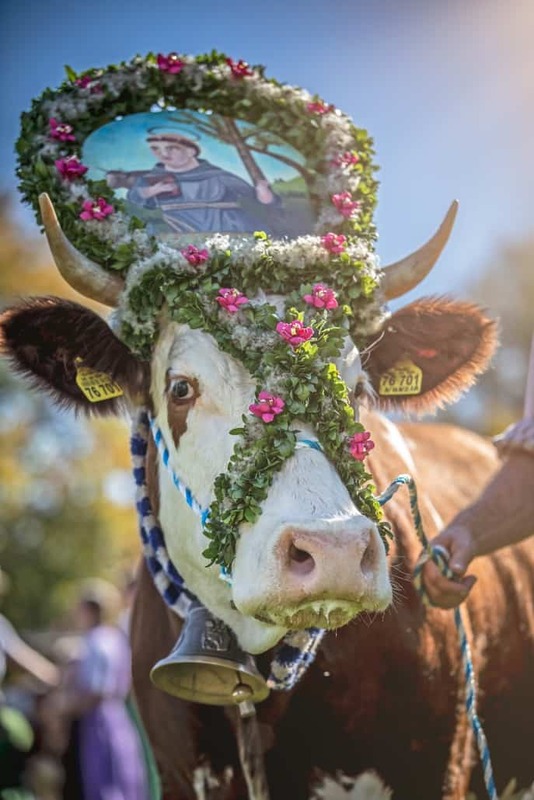 Aber ganz besonders dürfen sie nicht fehlen an Fasching, Kirchweih und natürlich während der Almzeit im Sommer. 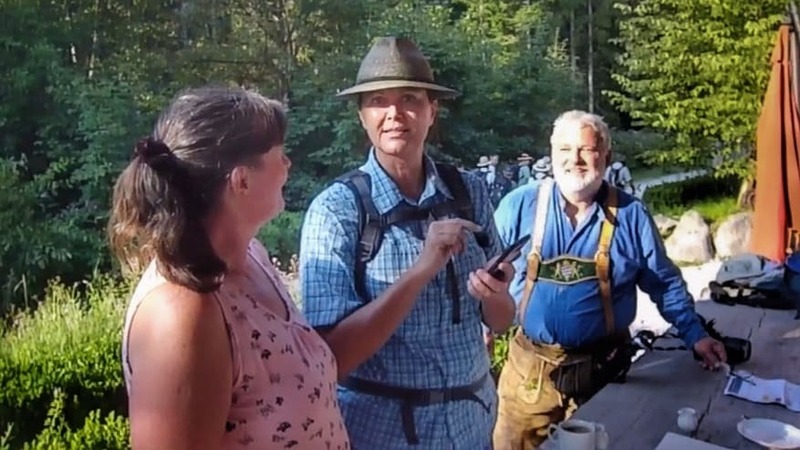 Das zimmerwarme Dinkelmehl in eine Schüssel sieben, in der Mitte eine Mulde machen für den Vorteig. 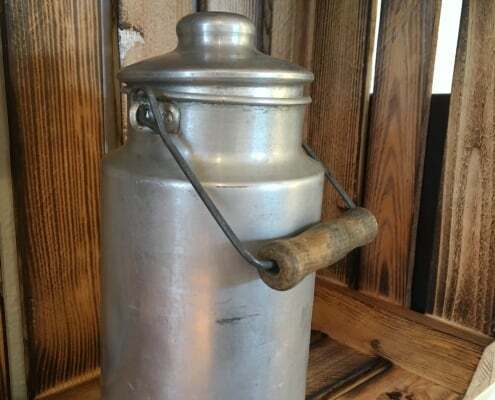 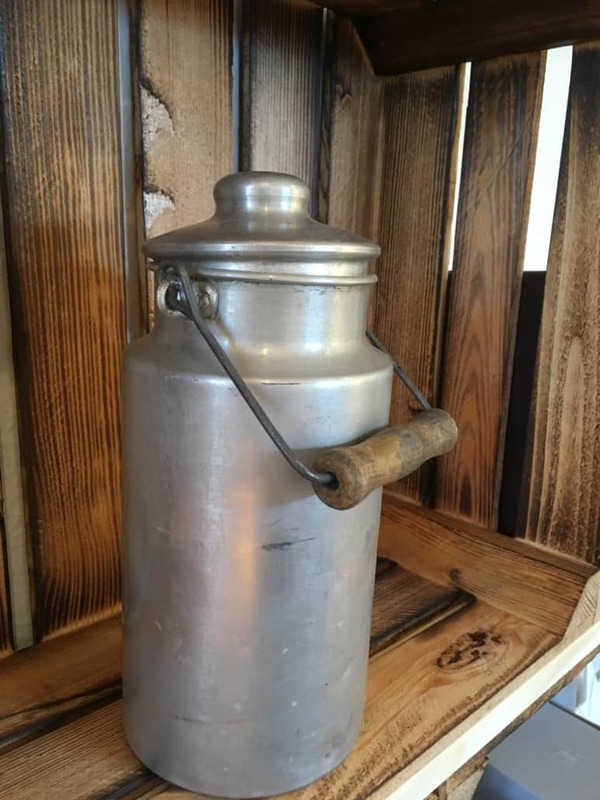 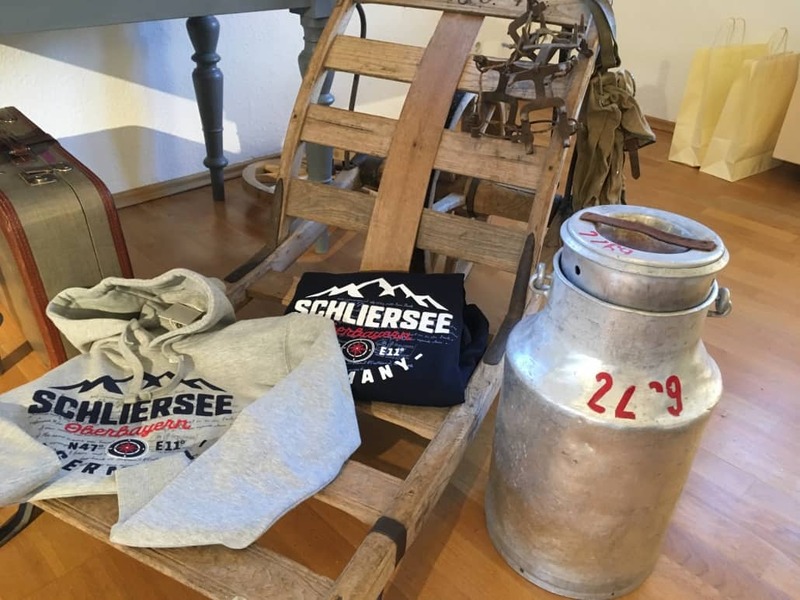 Die frische Hefe mit etwas lauwarmer Milch zu einem kleinen Vorteig anrühren und ca. 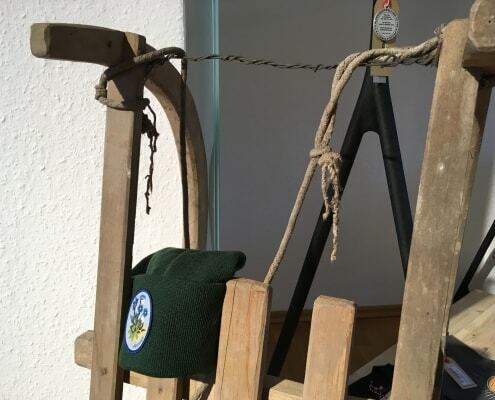 20 Minuten gehen lassen. 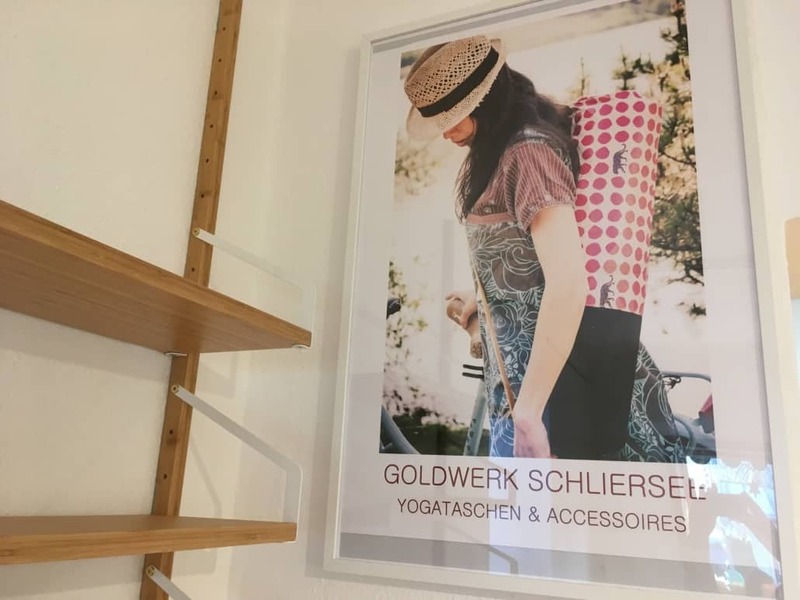 Die restlichen Zutaten, bitte alle Zimmerwarm, in die Teigschüssel geben und ca. 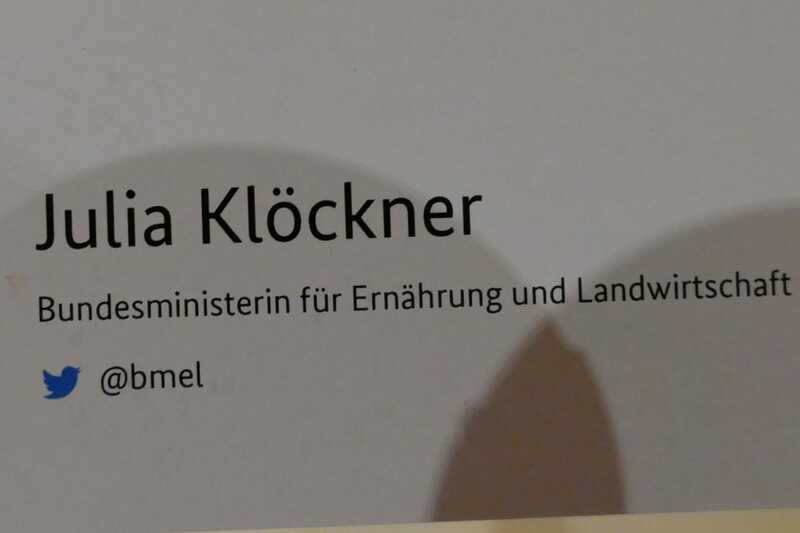 acht Minuten gleichmäßig kneten, damit viel Luft in den Teig kommt. 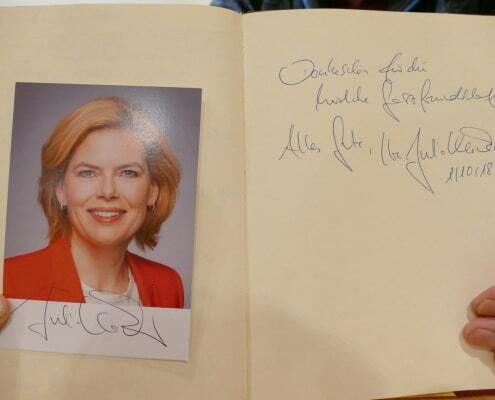 Anschließend ca. 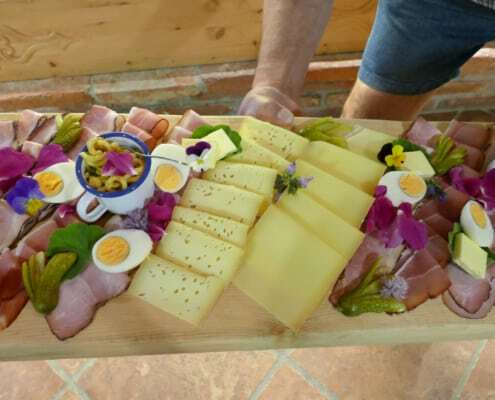 30 Minuten nochmal gehen lassen, dabei mit einem Küchentuch zudecken. 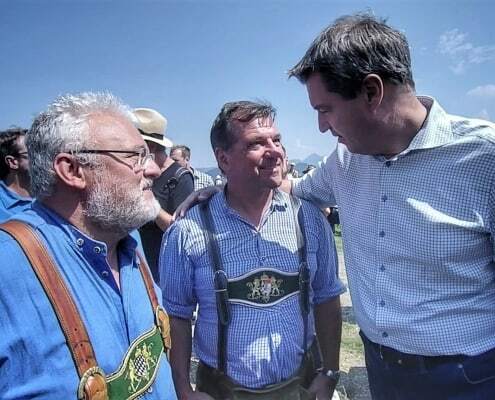 Auf einer Arbeitsfläche den Teig geben und zu einem langen Strang ziehen. 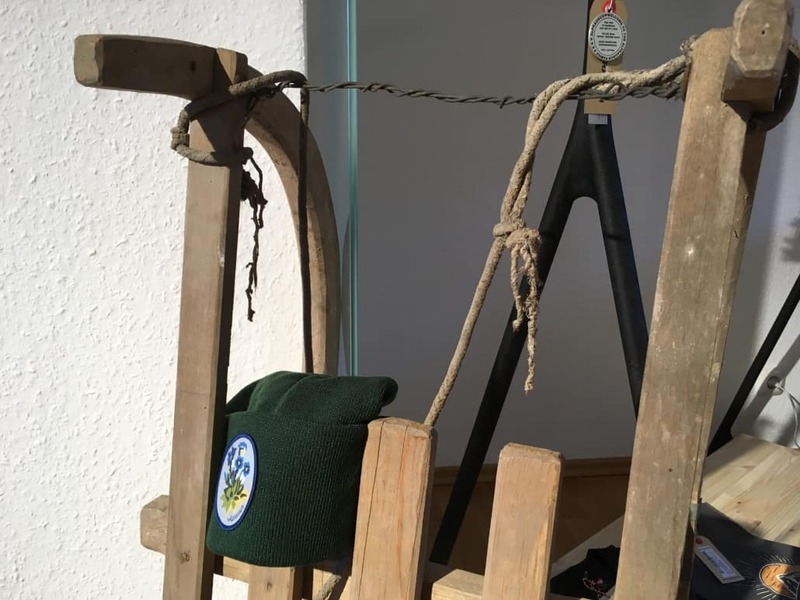 Mit der Teigkarte kleine Striezel abstechen und auf ein Brett legen, zudecken und ca. 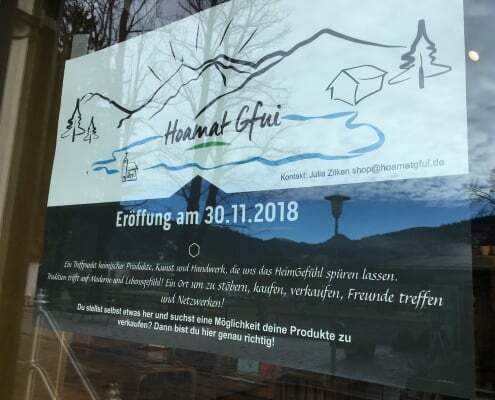 30 Minuten gehen lassen. 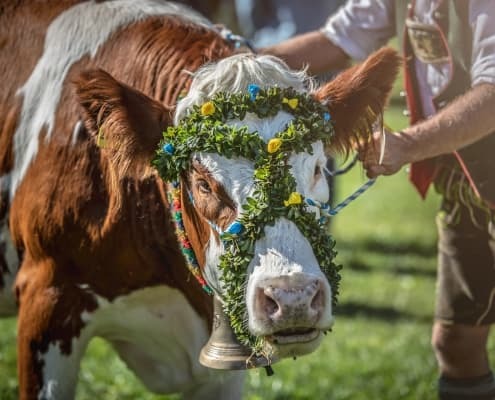 Inzwischen die Fettpfanne vorbereiten mit gutem Butterschmalz. 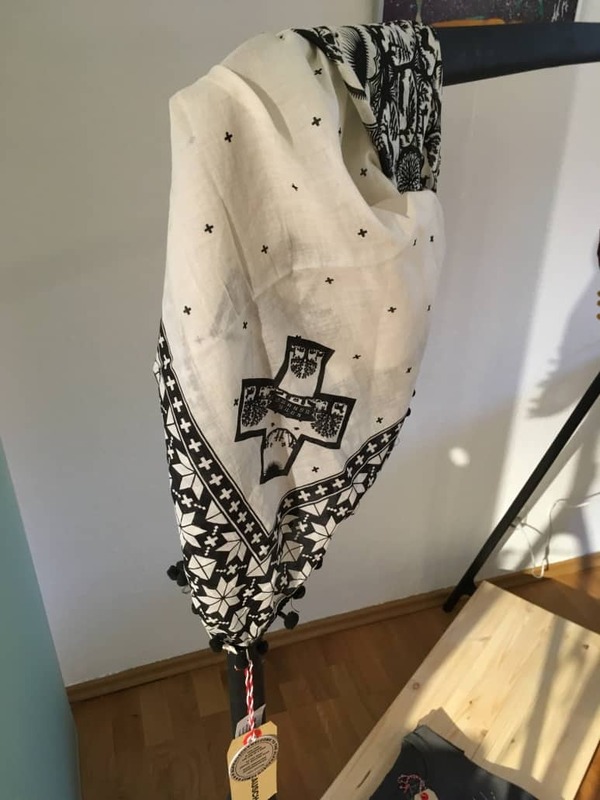 Jetzt werden die Teiglinge vorsichtig in heißes Fett gegeben, die Pfanne wird mit einem Deckel zugedeckt. 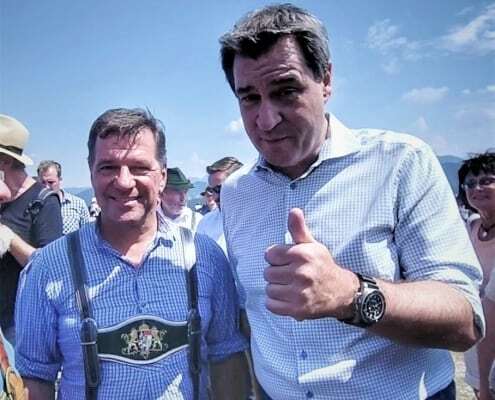 Wenn sie schon a bissal bräunlich schimmern, Deckel abnehmen und die Striezel im Fett umdrehen und fertigbacken. 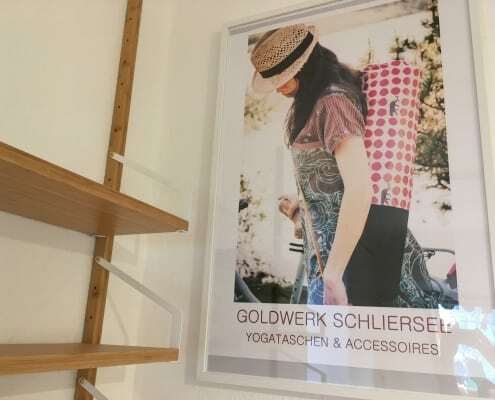 Mit einem Seihlöffel aus der Pfanne nehmen und auf einem Tuch abtropfen lassen. 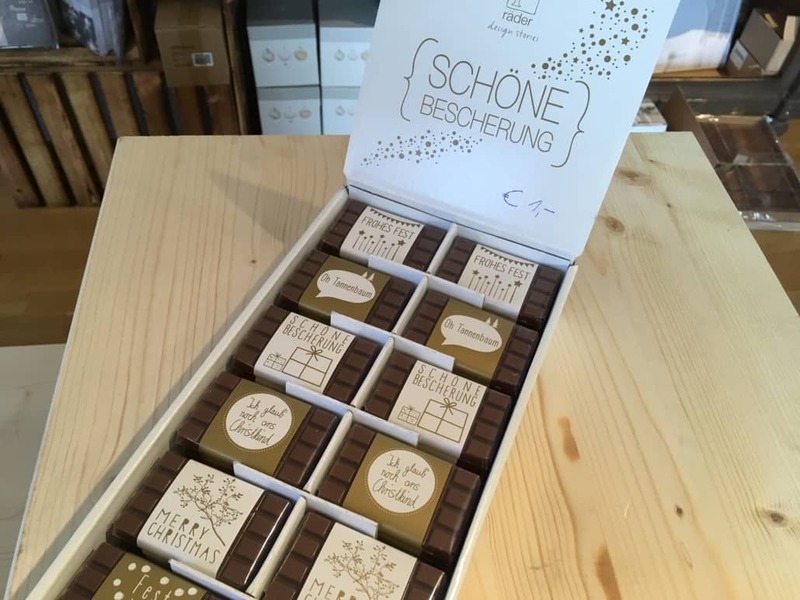 Mit Puderzucker bestäuben und genießen. 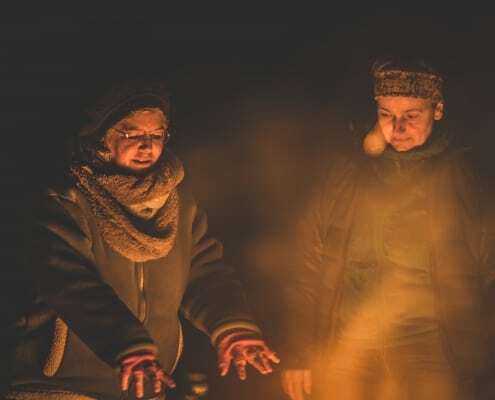 Between the 21st of December and the 6th of January, in what is known here in Bavaria as Rauhnächte (smoke nights), it is believed that at this time the veil between this world and the hereafter is at its thinnest. 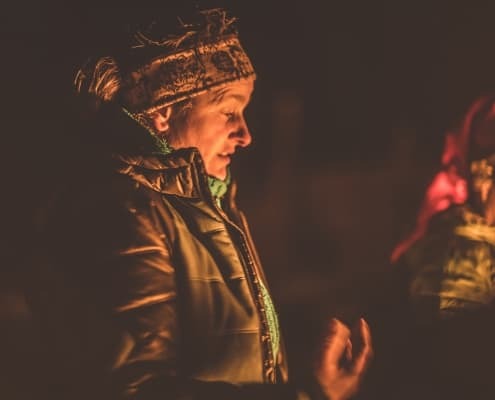 This is a time for change, purification and reflection. 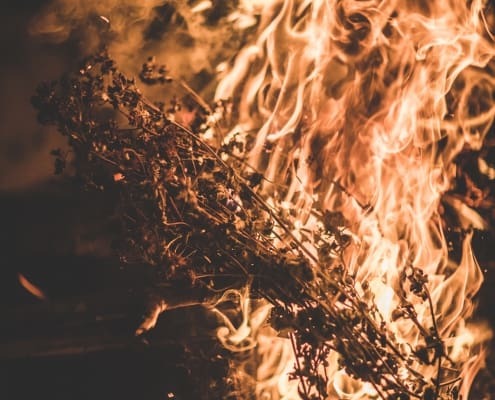 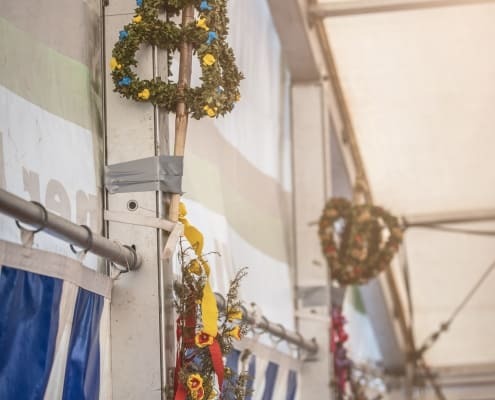 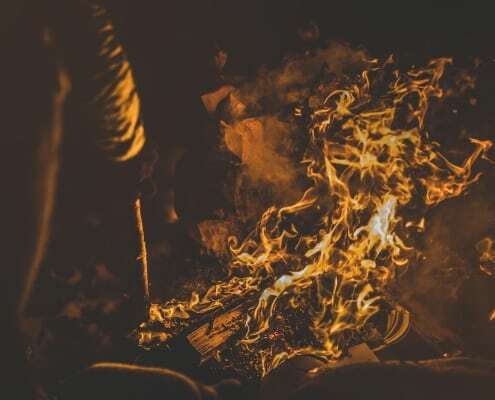 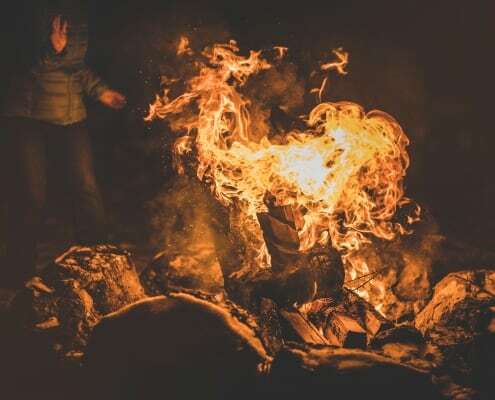 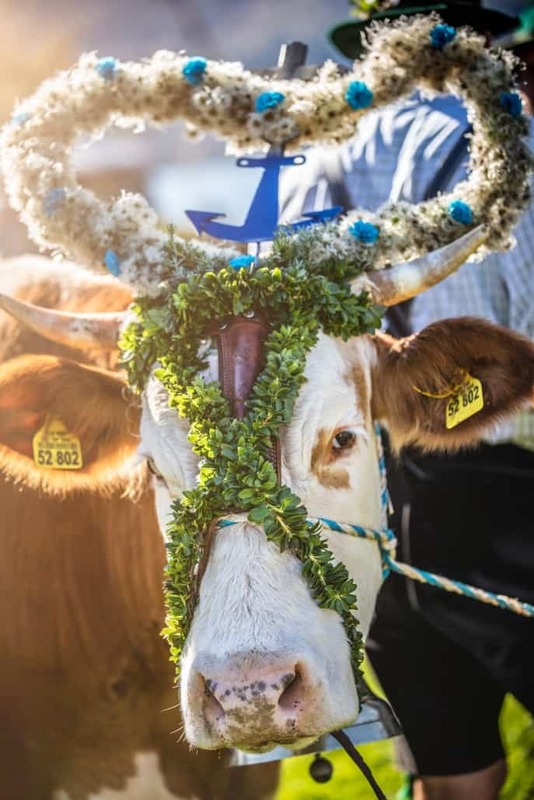 It is believed that at this time, through the ritual of “räuchern” or incense burning, you could affect positive change in the new year while protecting your family, farm and livestock. 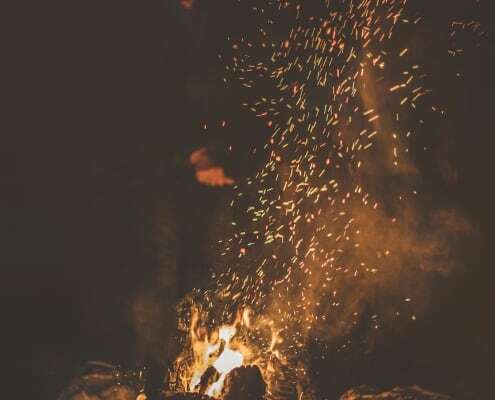 This might all seem very mystical but these old beliefs are now being found to have real evidence in science in our modern times. 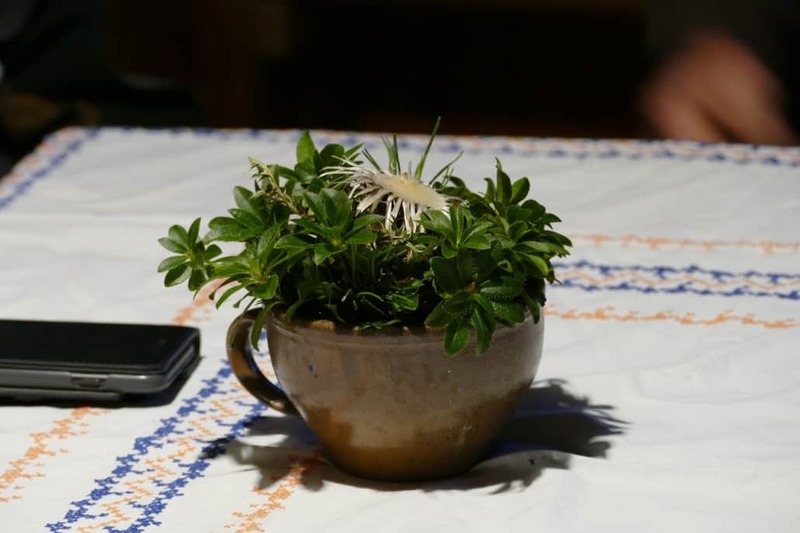 Many of these plants have antimicrobial and antibacterial properties. 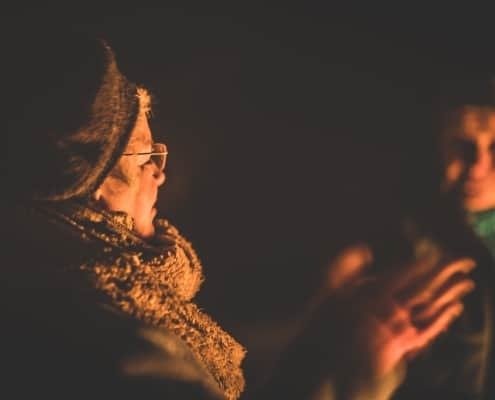 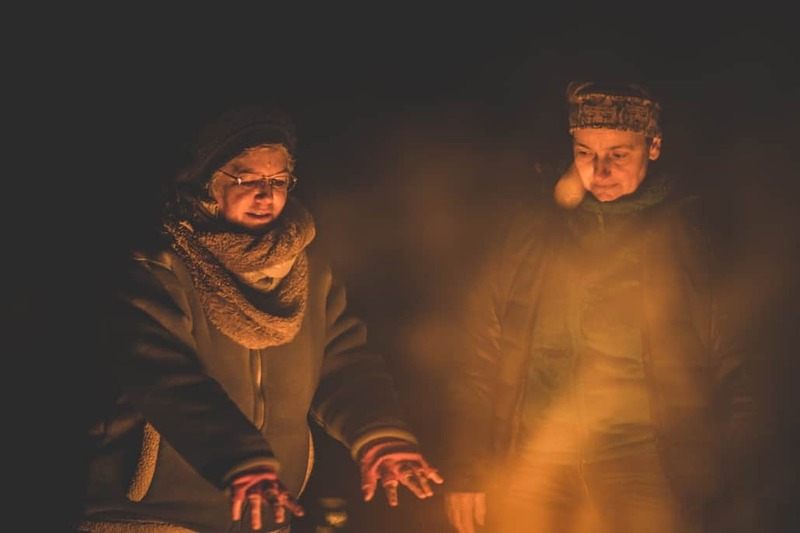 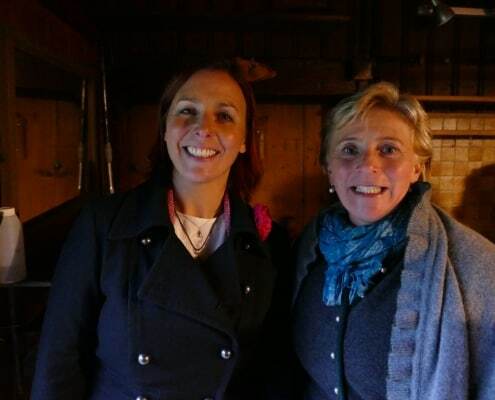 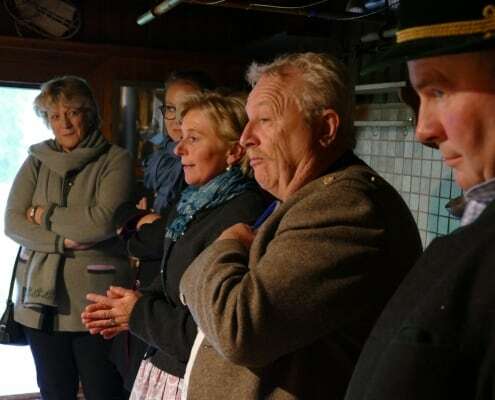 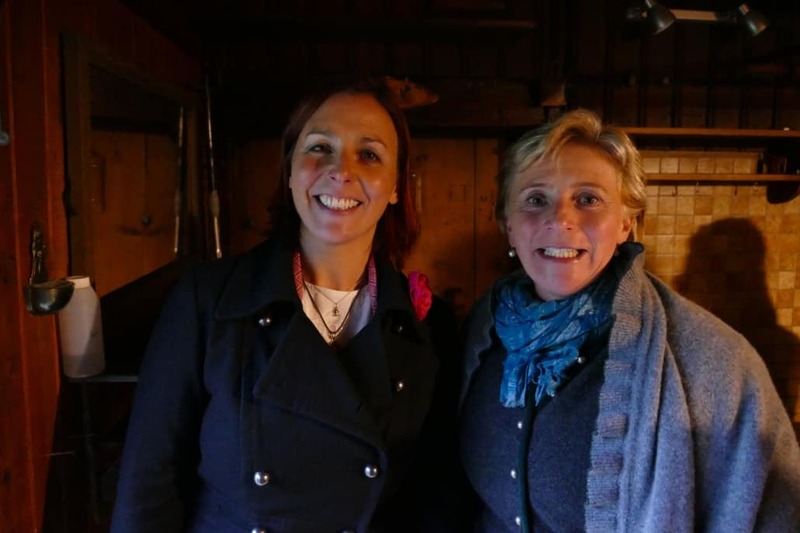 Recently, on a very cold dark night in November, my colleague Ulrike McCarthy and I, were invited to learn about these traditions at one of our local farms. 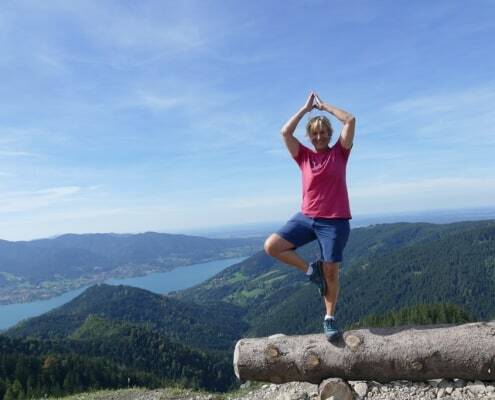 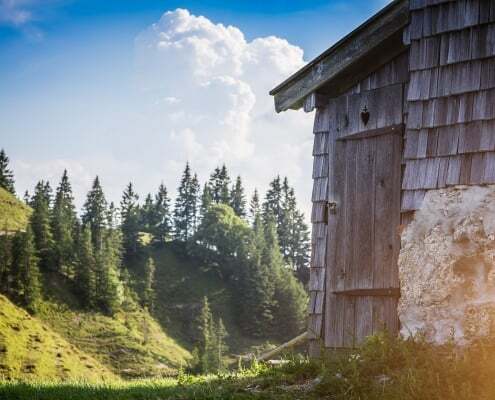 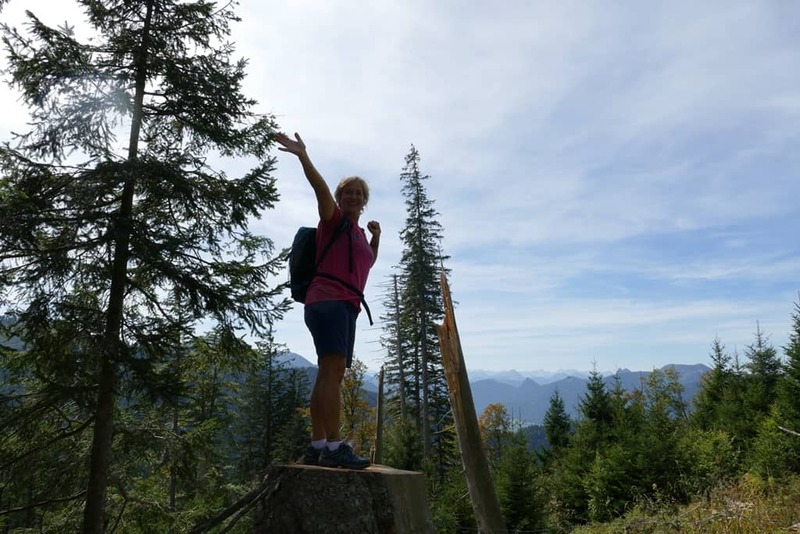 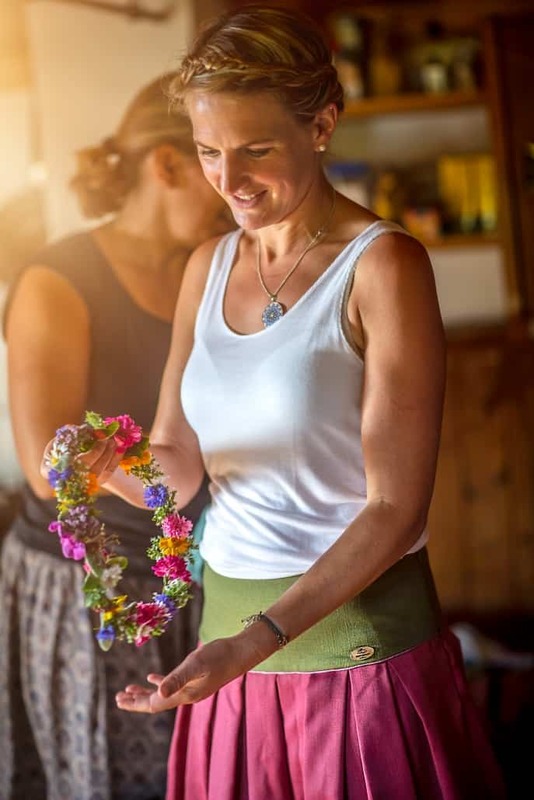 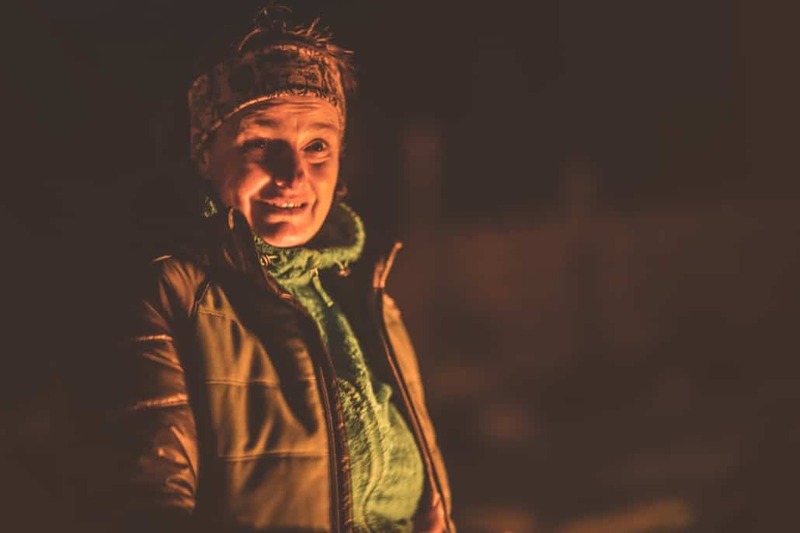 Our spiritual guide, Angelika Prem, also a writer for Schliersee magazine, has been teaching and performing these ancient rituals for more than 15 years. 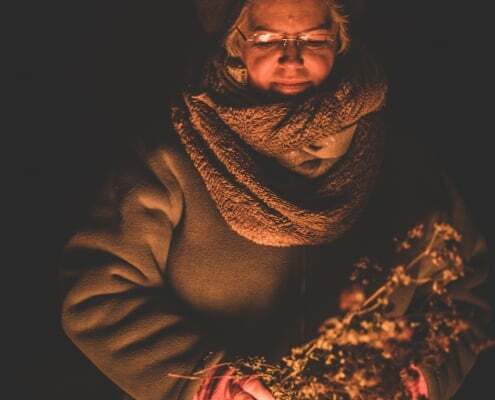 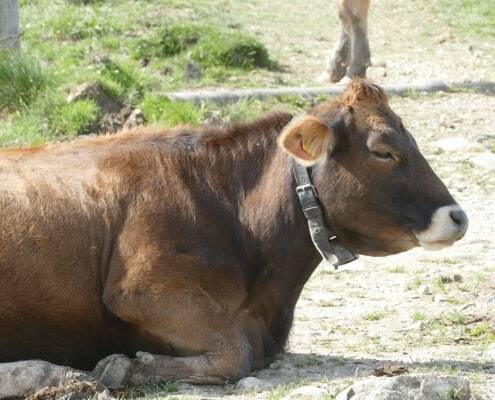 You can say she has been involved in them much longer as it was all just a very normal part of the seasonal calendar for her family farm. 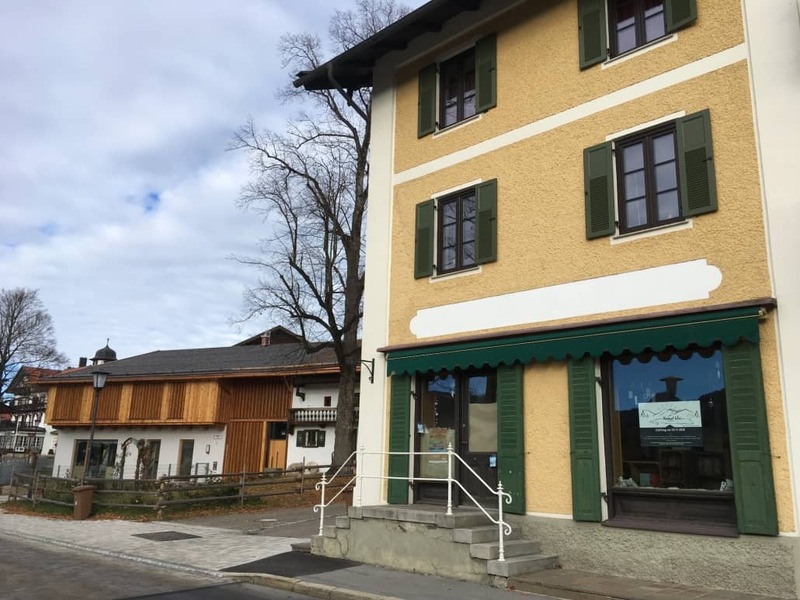 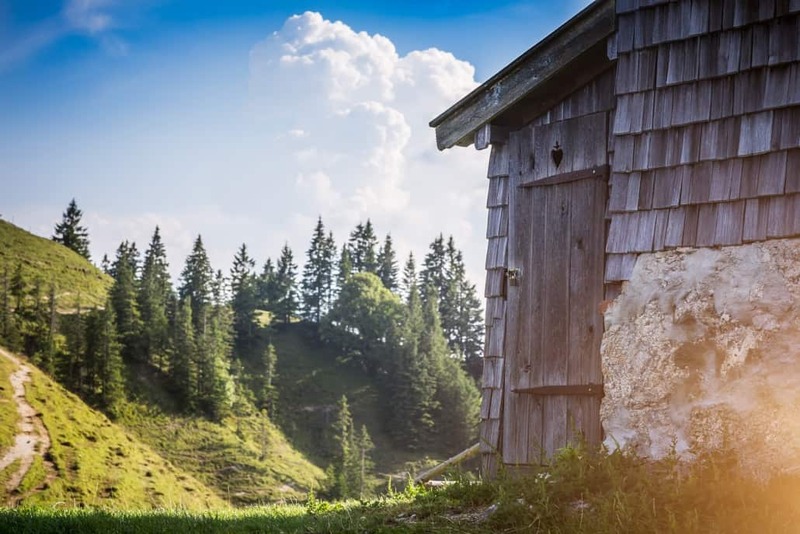 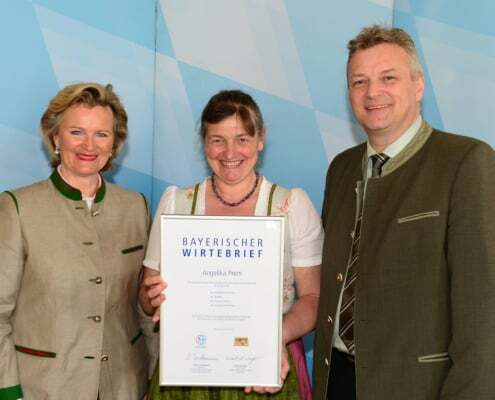 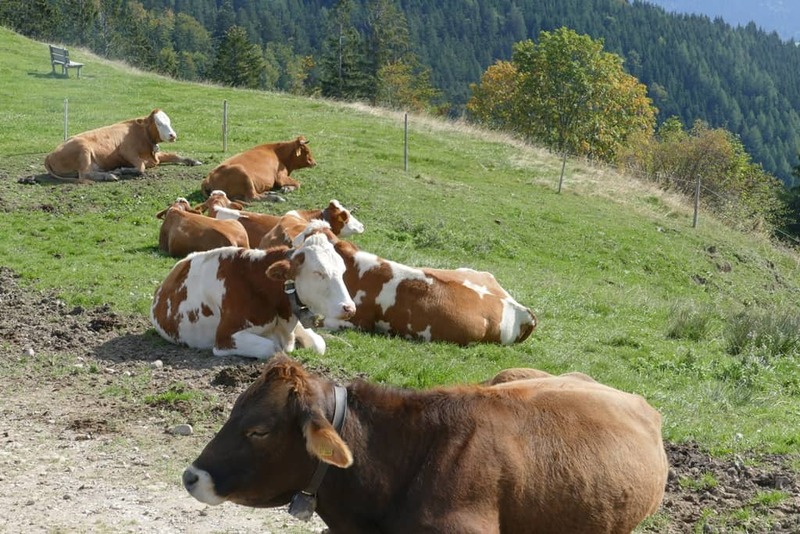 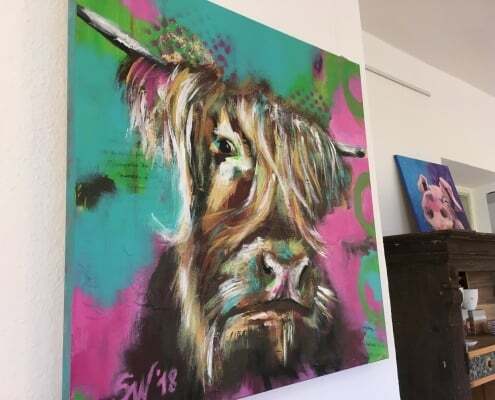 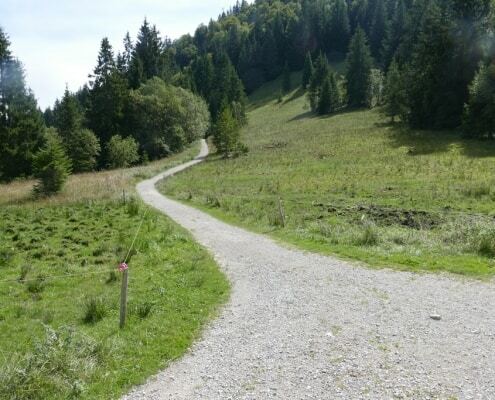 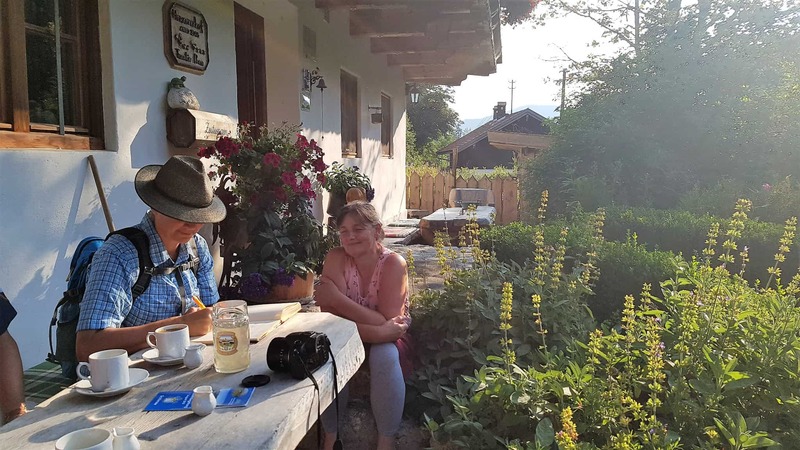 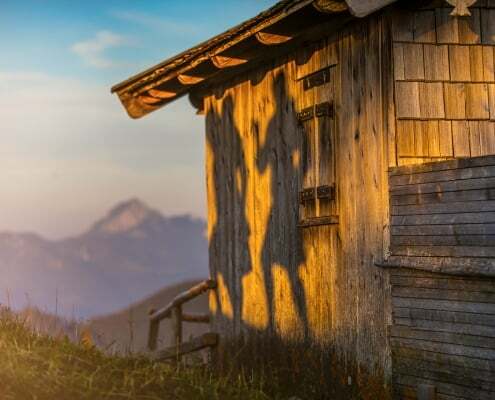 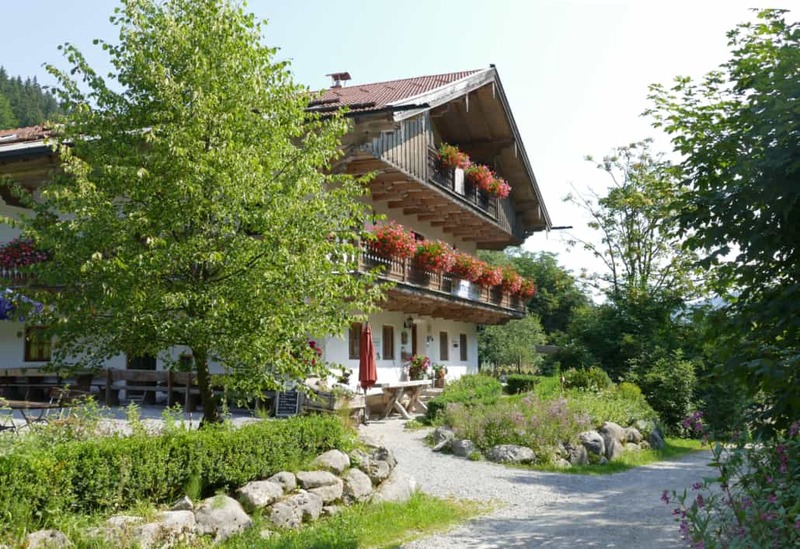 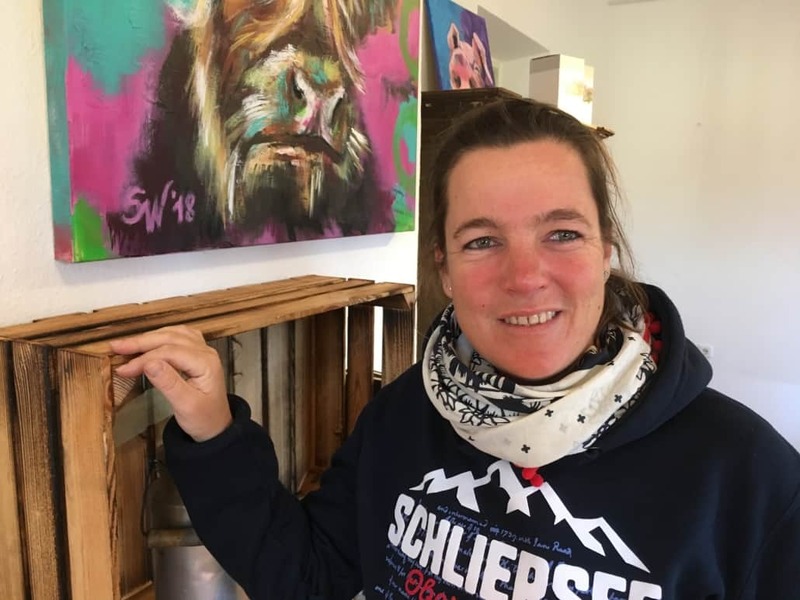 What she didn’t learn at her mother’s hearth, she learned by taking courses and reading extensibly on the subject and now offers courses and seminars at her farm, Hennerehof, right here in Schliersee. 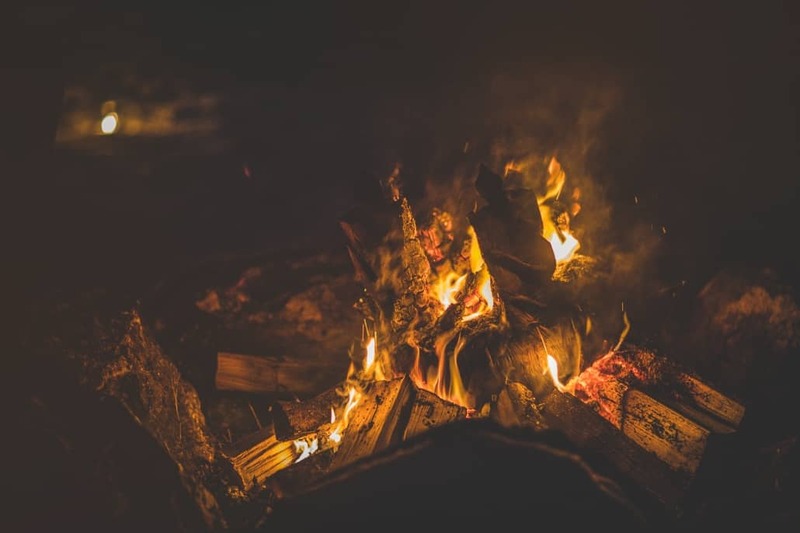 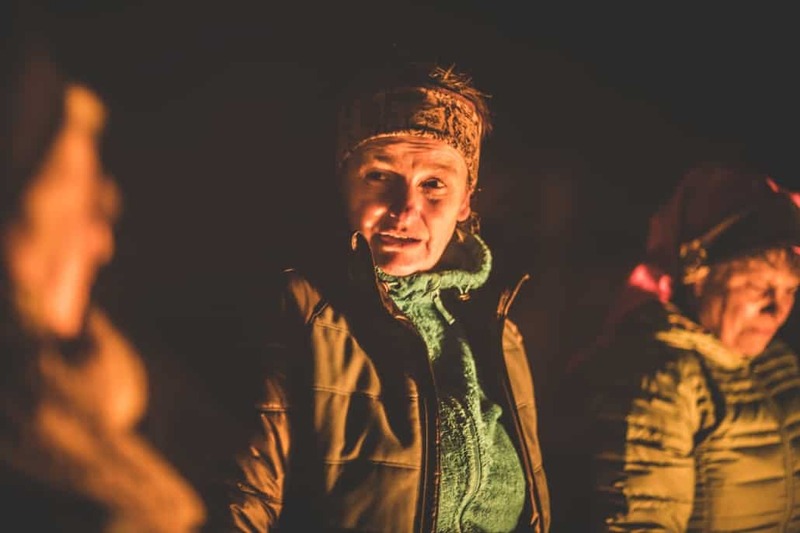 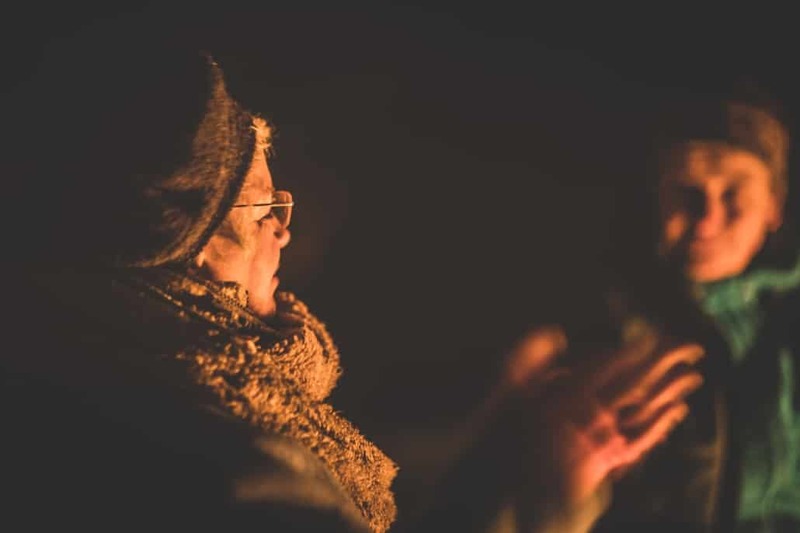 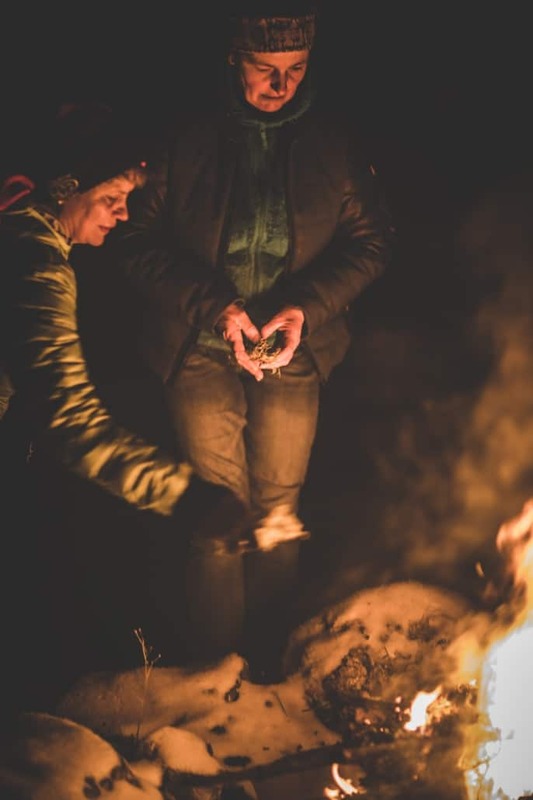 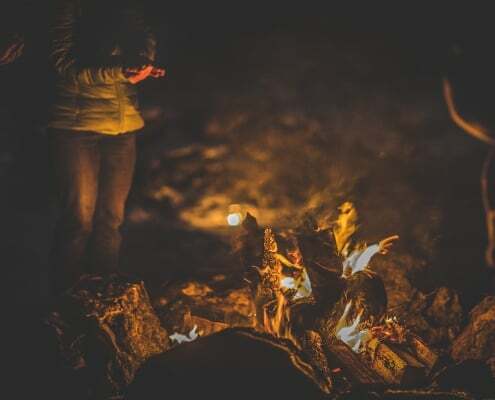 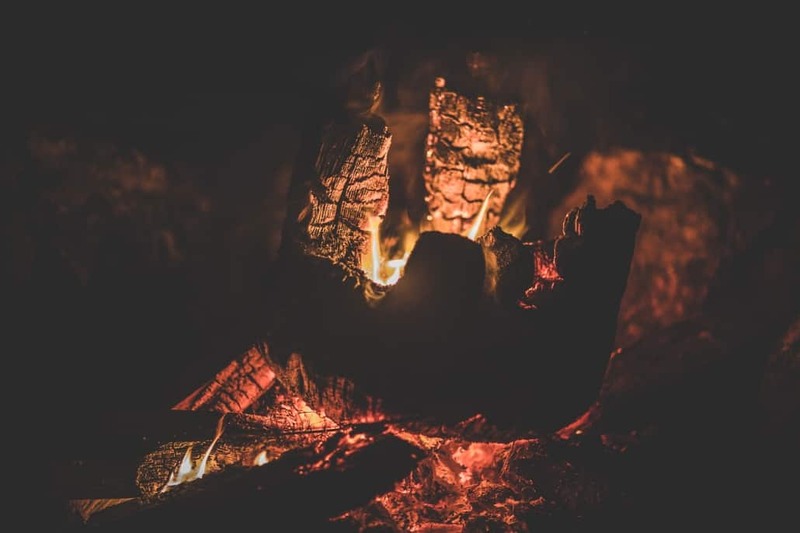 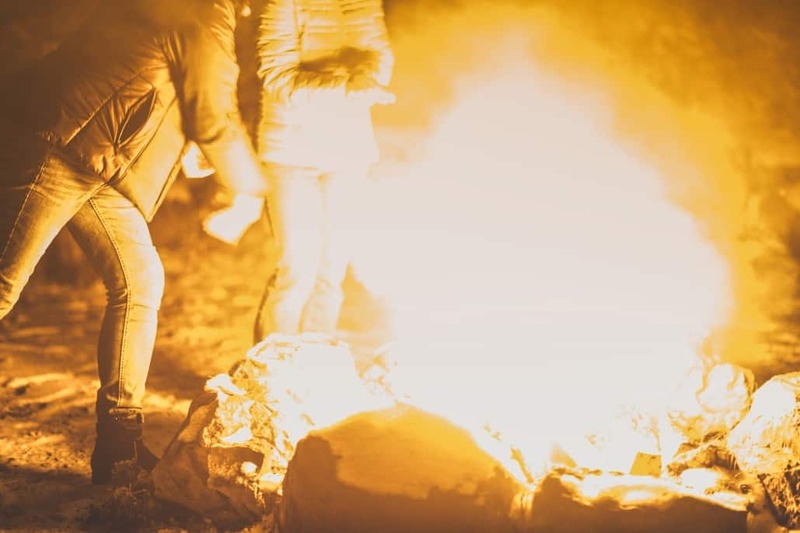 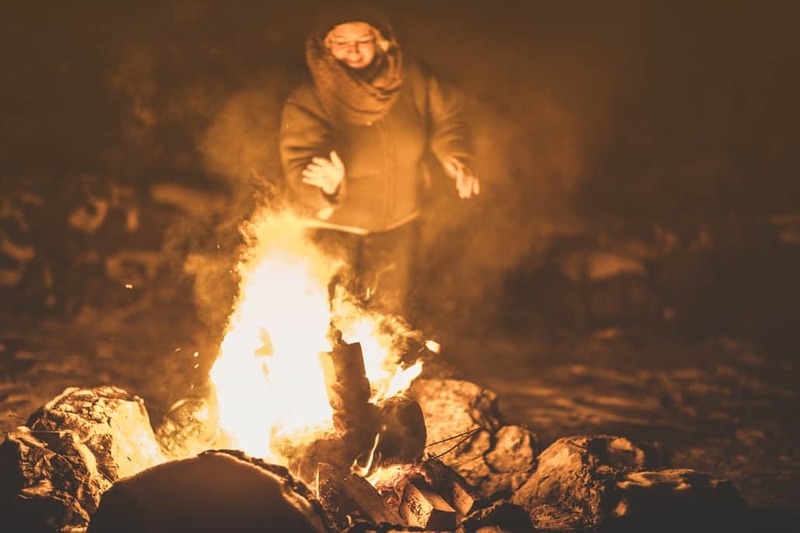 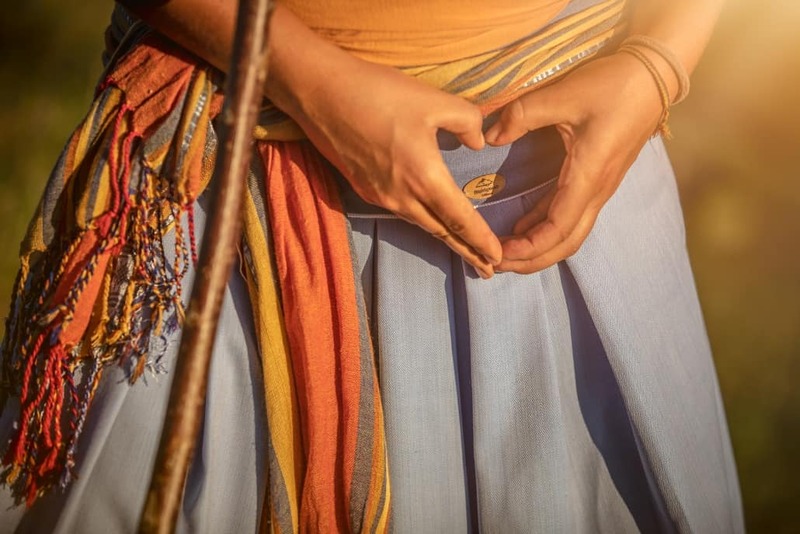 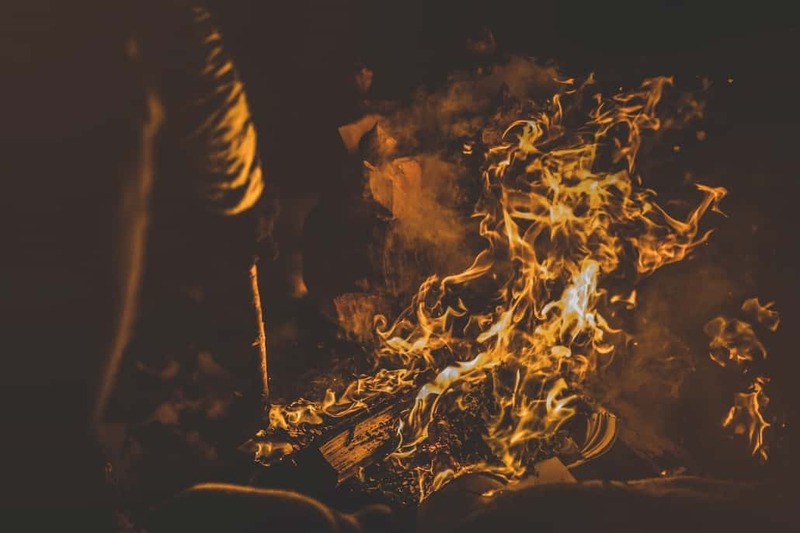 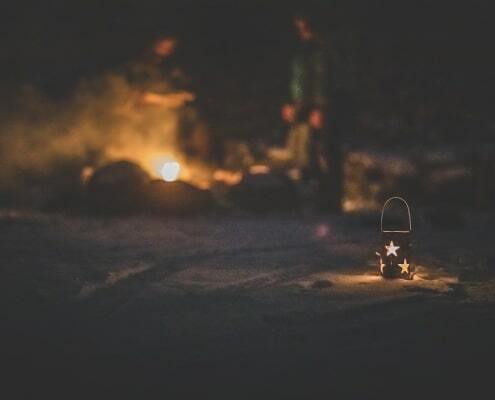 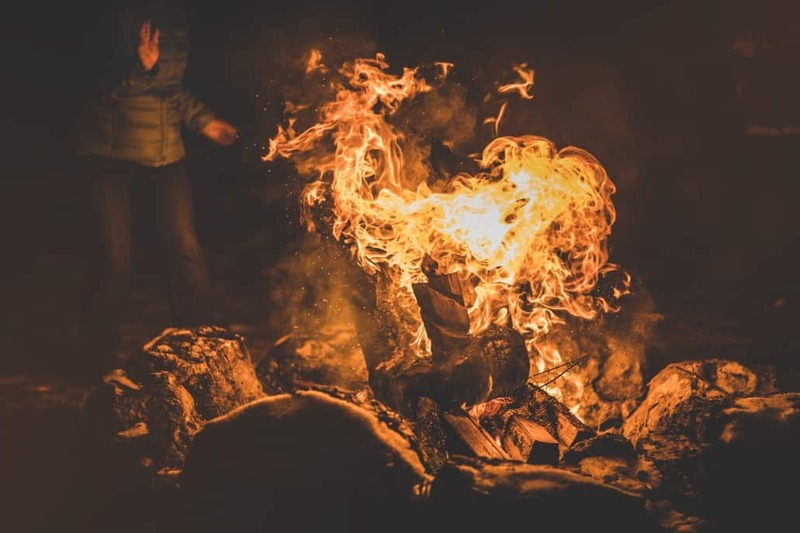 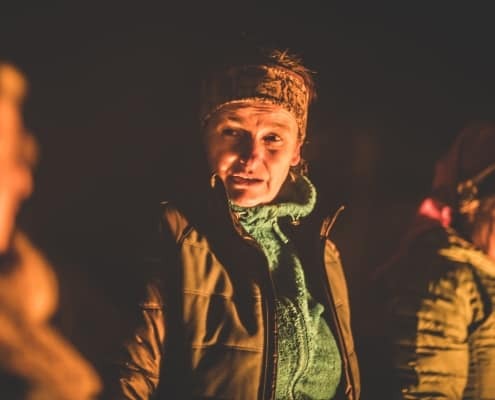 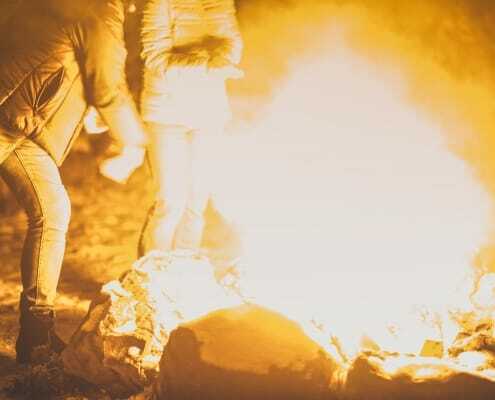 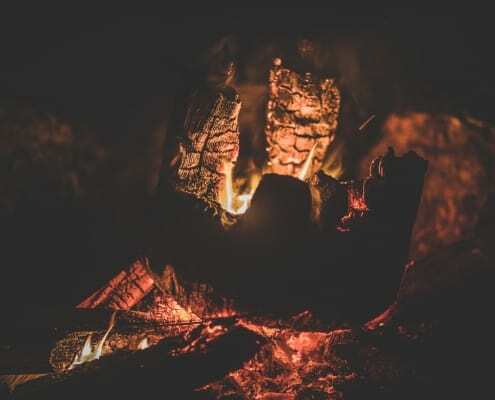 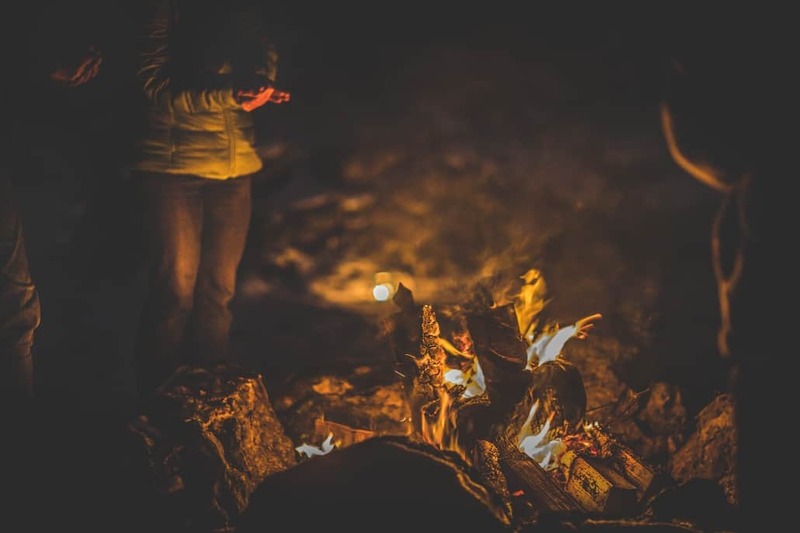 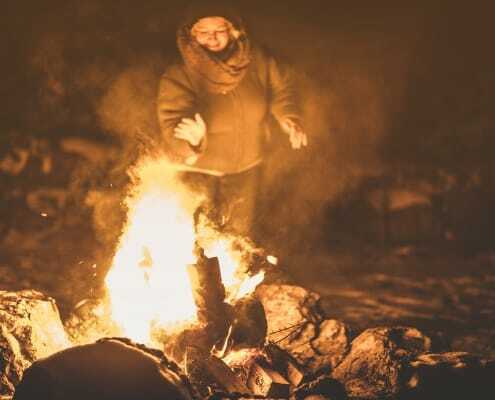 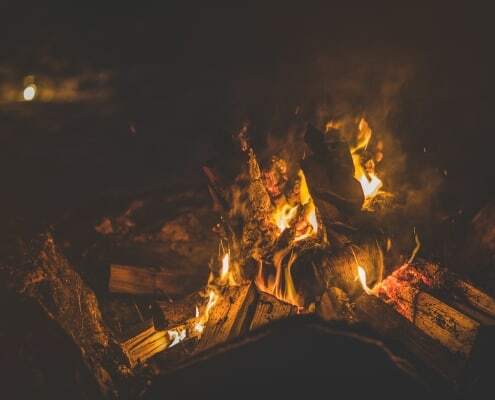 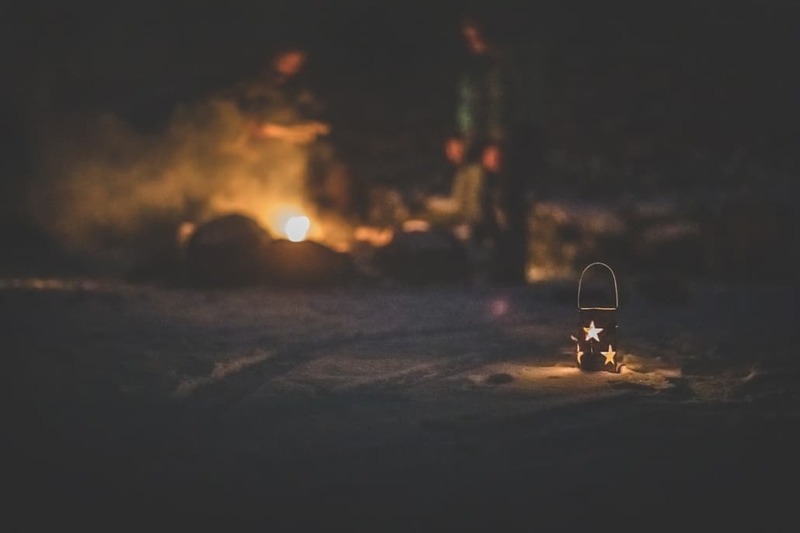 When we first arrived, before we gathered together around the roaring fire, Angelika used a “Räucherbündel or Räucherzigarre” to clean our energy and prepare us for this ritual. 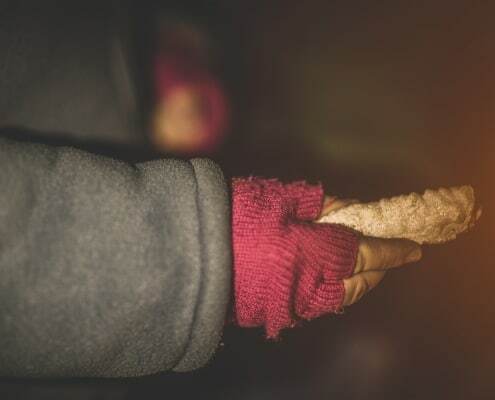 In the US we call this a smudging stick. 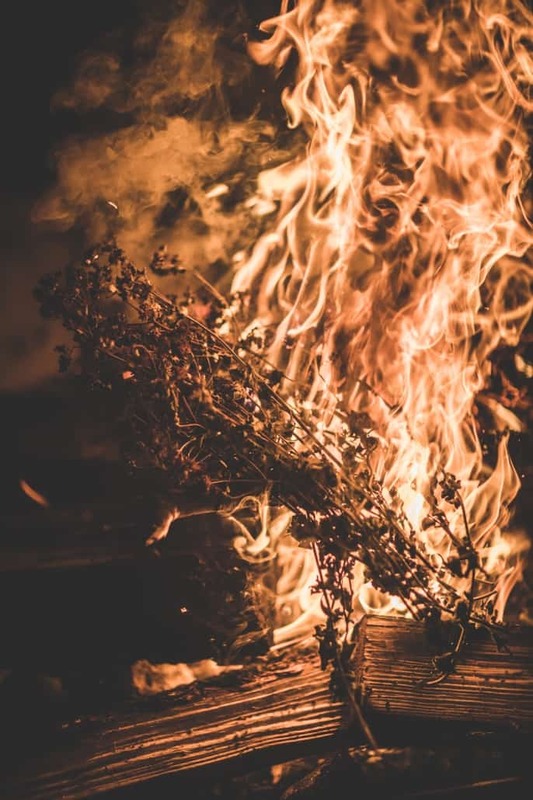 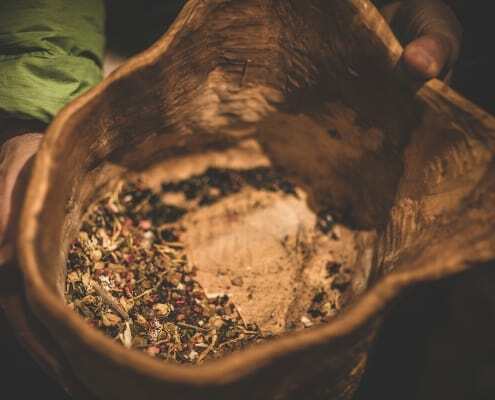 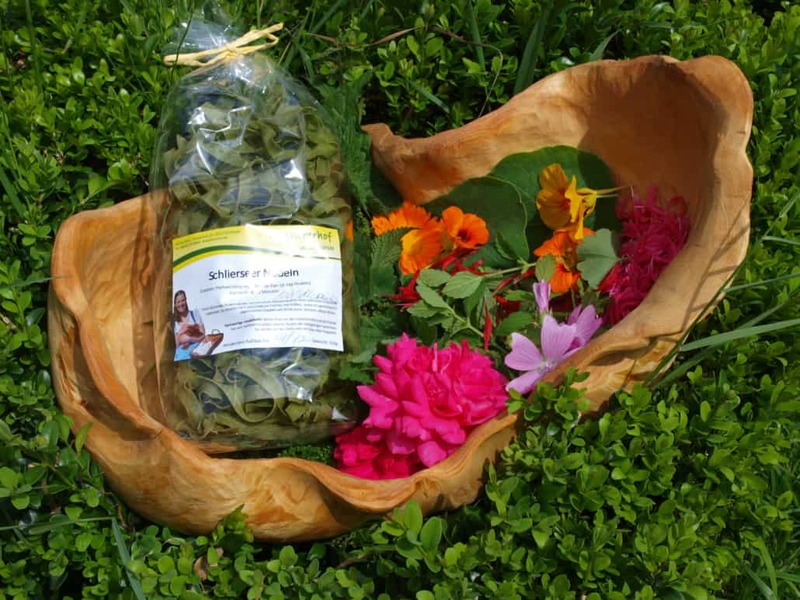 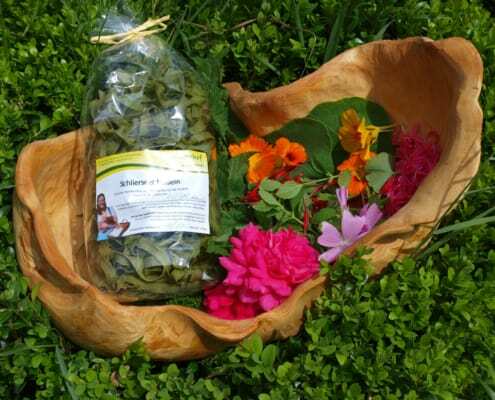 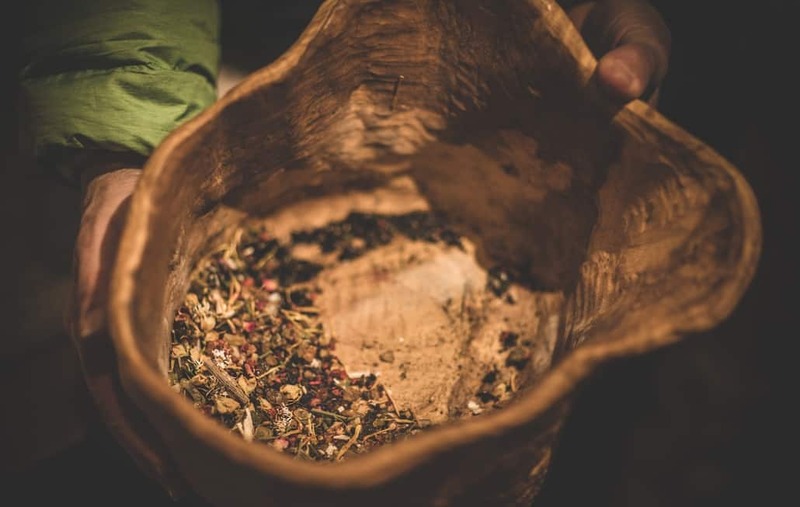 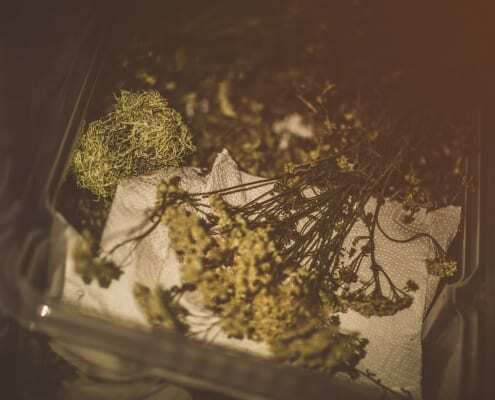 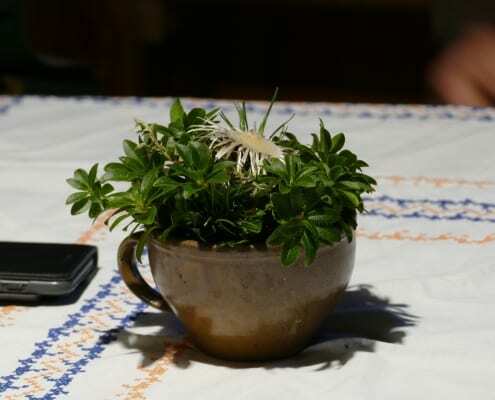 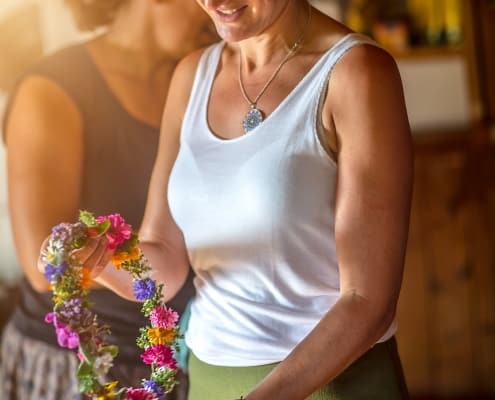 The plants for the purpose of making smudging sticks and other smoking rituals, are traditionally gathered on the 15th of August the official holiday of the Assumption of Mary. 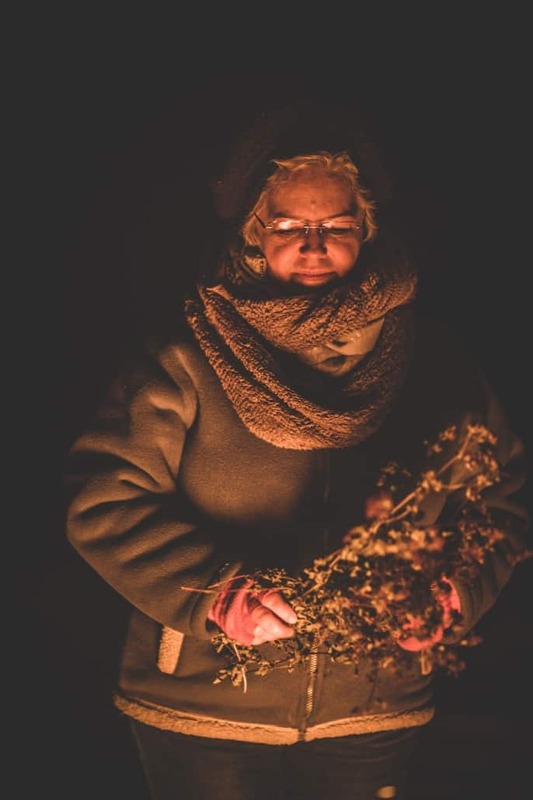 Once “clean” Angelika began to hand us various items she had gathered for ceremonial purposes from the forest around her farm. 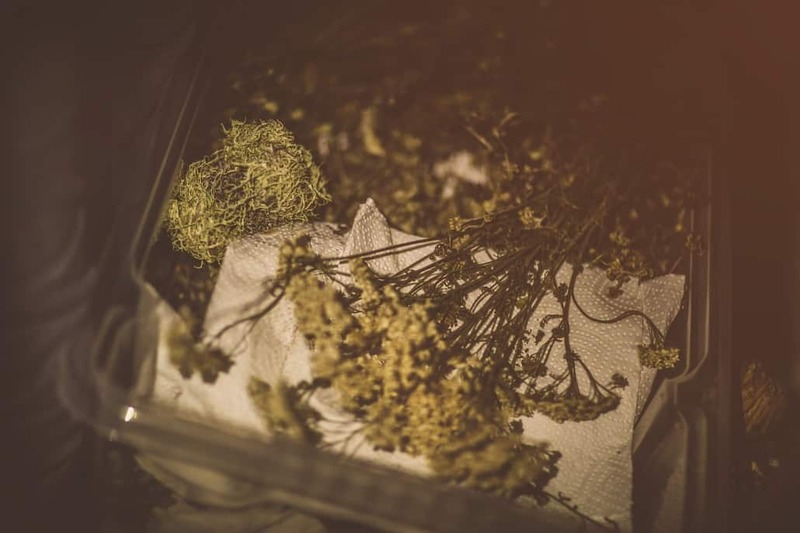 Hardened tree resin, dry bunches of various plants and even hand written notes. 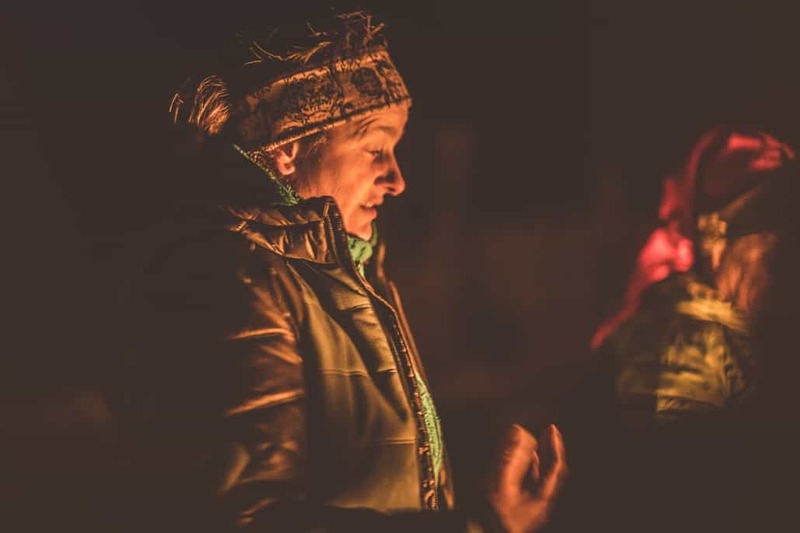 All were given out at different times in the ceremony and we were encouraged to dig deep in our emotions and cast the difficult or negative thoughts into the flames, along with the plants and powders. 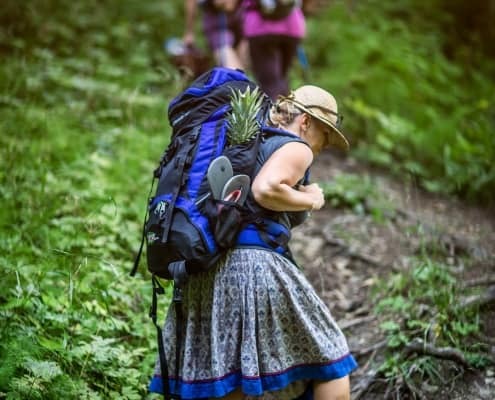 “This is a great time to unpack your baggage” she repeated often to us. 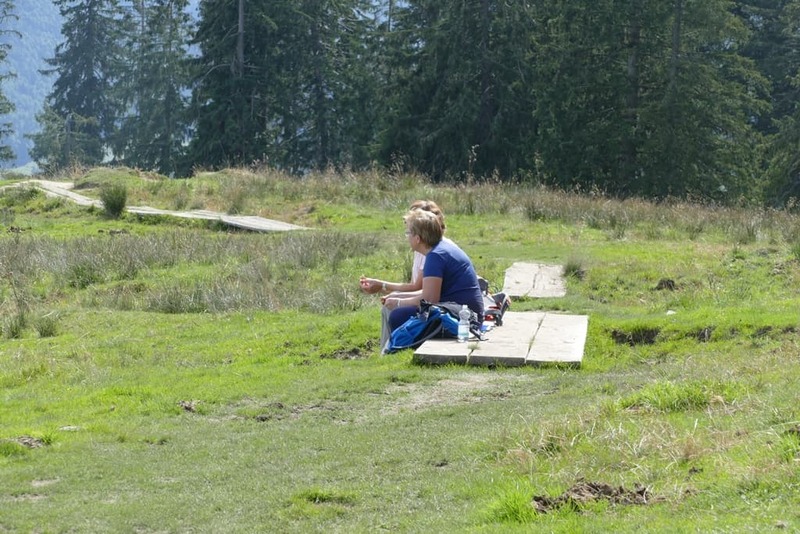 I have to admit I had a hard time deciding which bag to unload as it sure has been a challenging year. 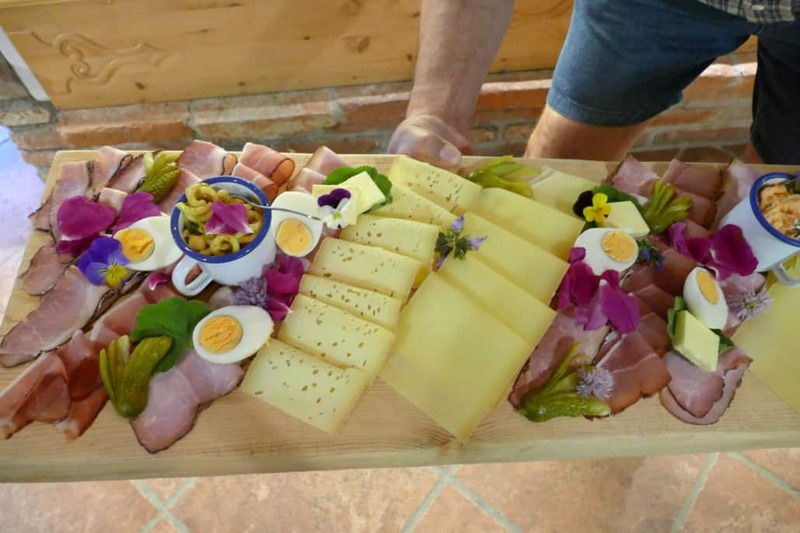 When we could stand the blustering cold no longer, we went into the cozy alpine farmhouse of Hennerehof. 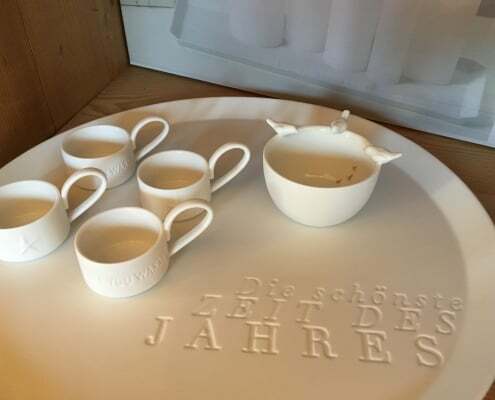 Once inside we sipped steaming mugs of tea and snacked on homemade pumpkin soup and cookies. 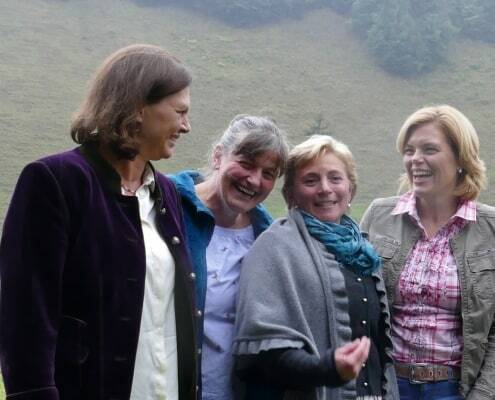 The energy of gathering with such knowledgable women was very intoxicating. 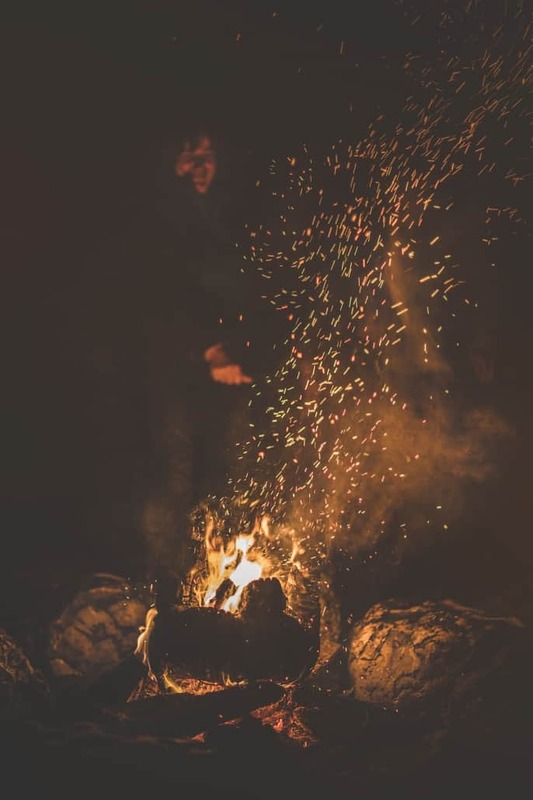 Could that magical moment be a result of the exotic scent of mystical vapors from the various incense we were learning their uses? 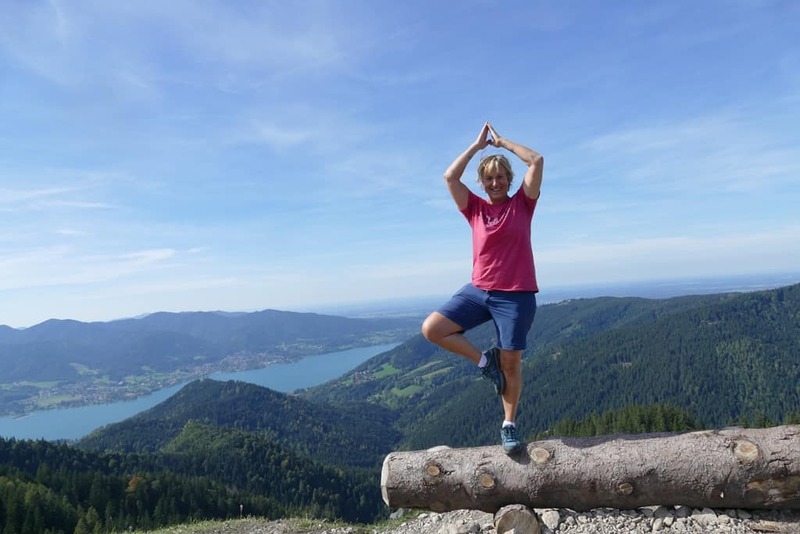 I do not know the answer, but I have to highly recommend coming to Schliersee and taking a few of Angelika’s seminars. 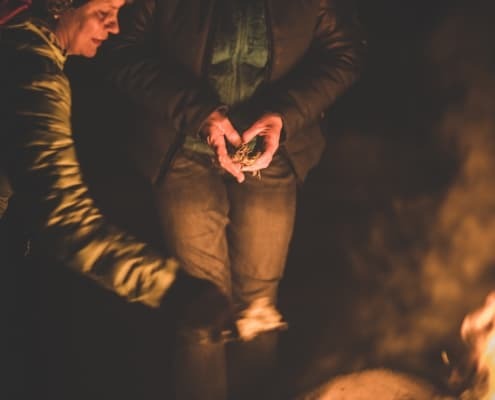 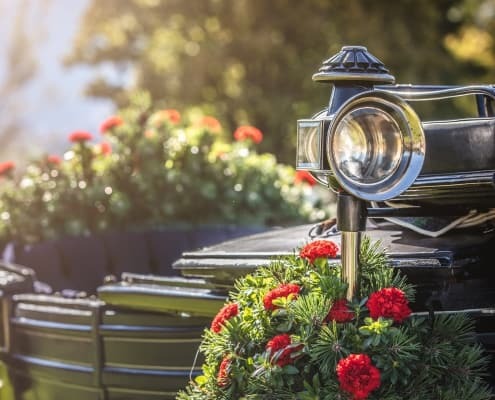 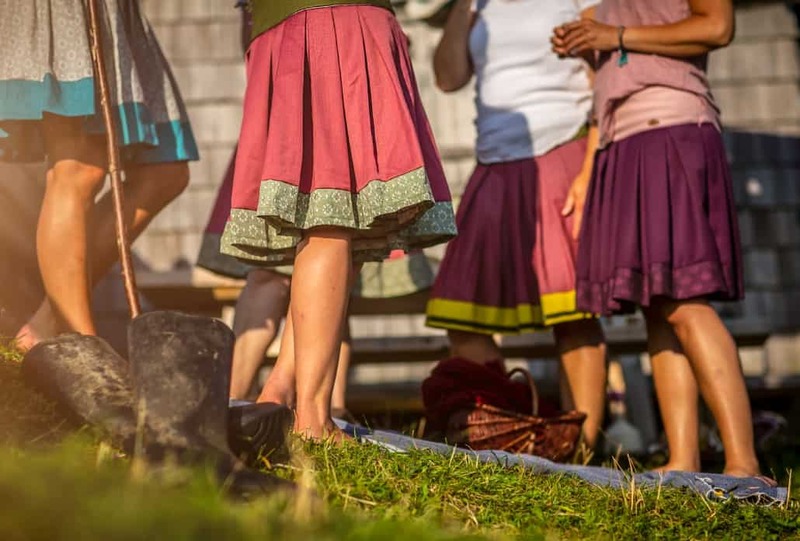 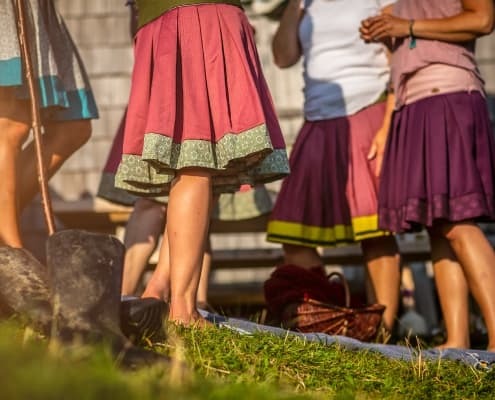 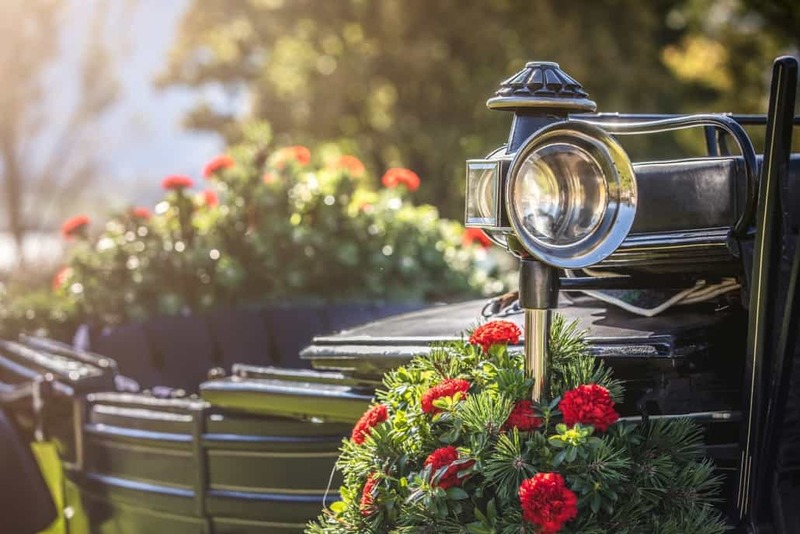 It will most definitely reignite your connection with the traditions of the old ways. 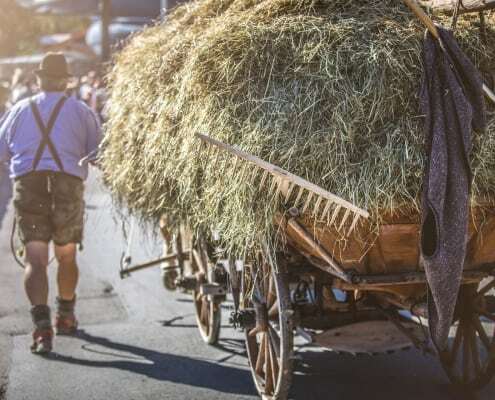 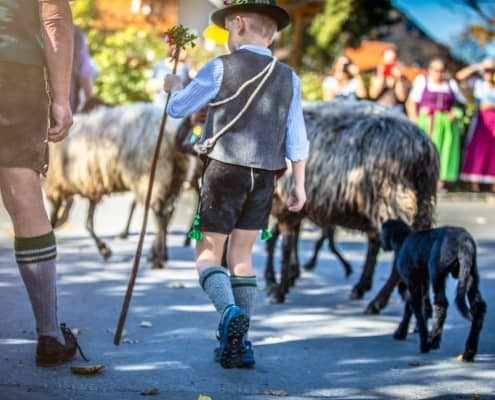 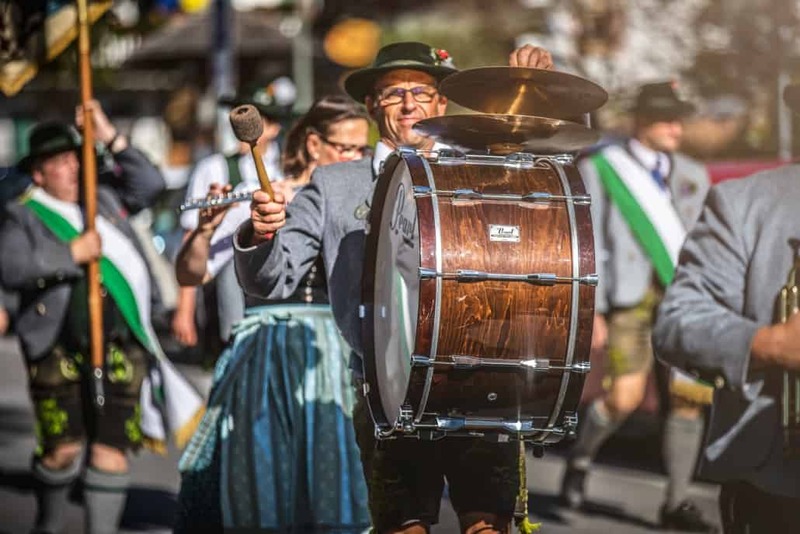 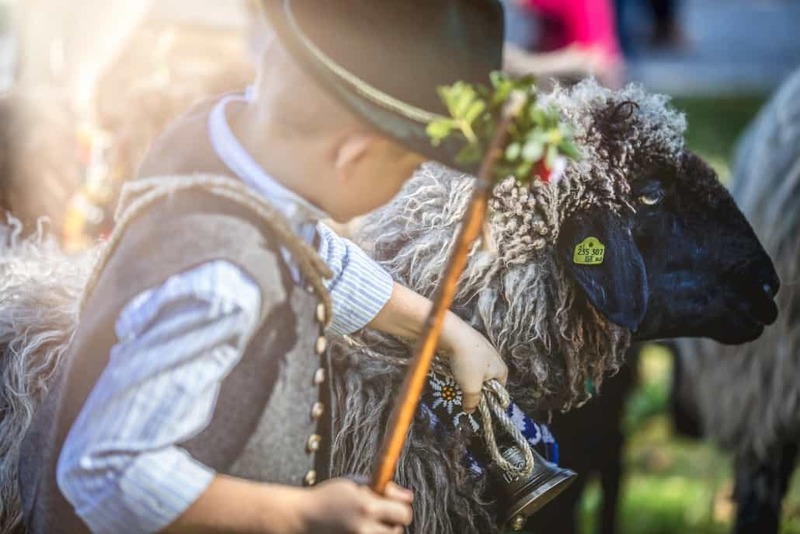 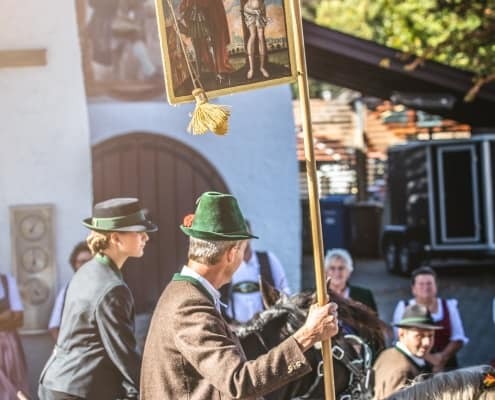 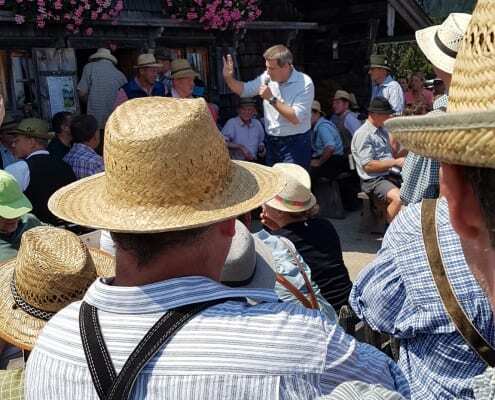 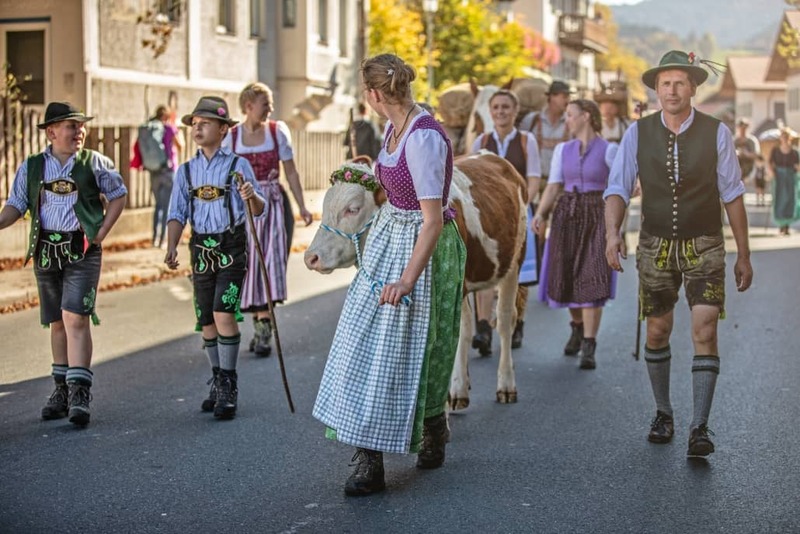 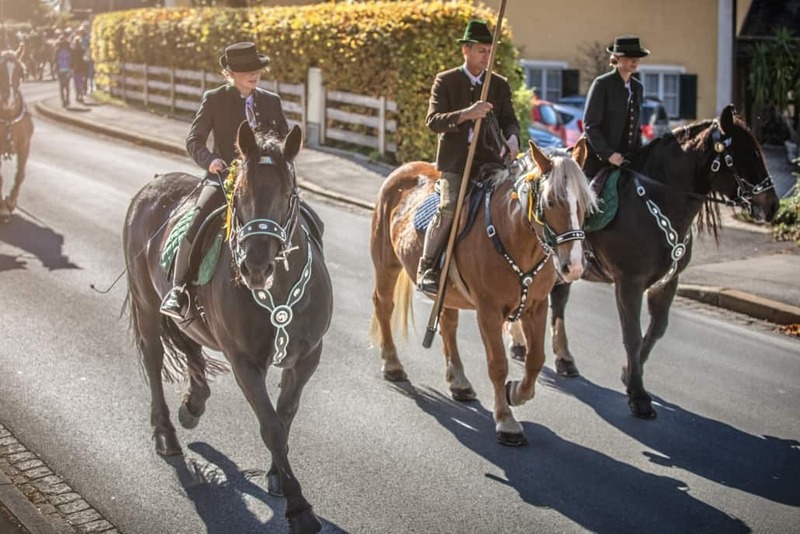 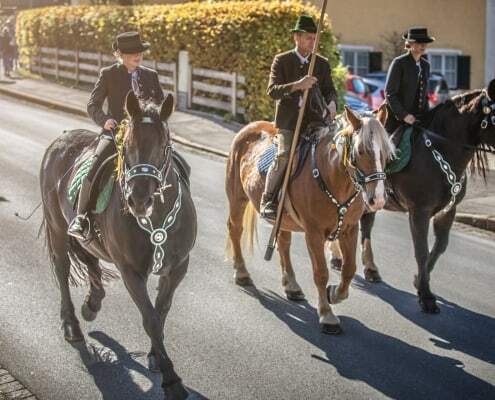 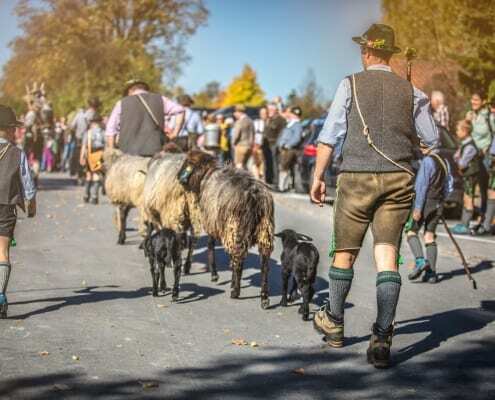 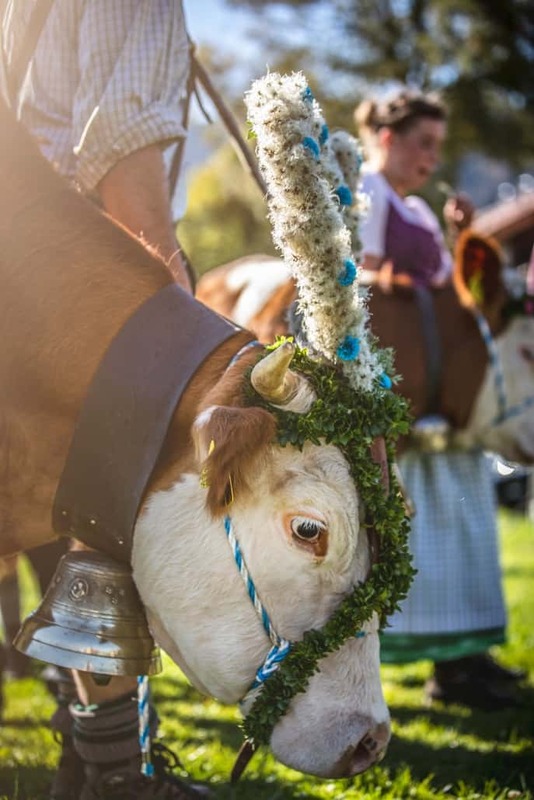 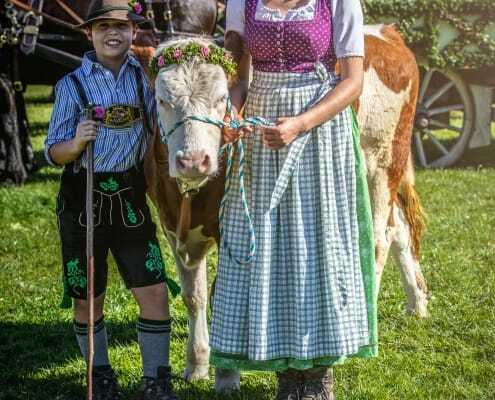 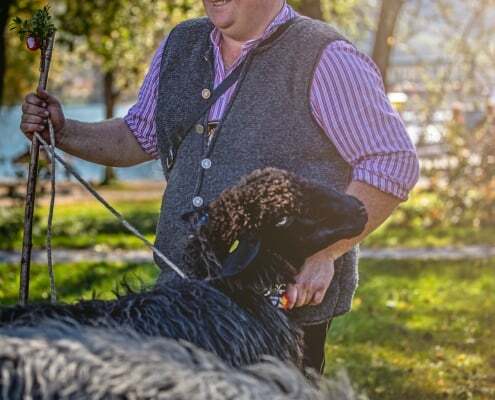 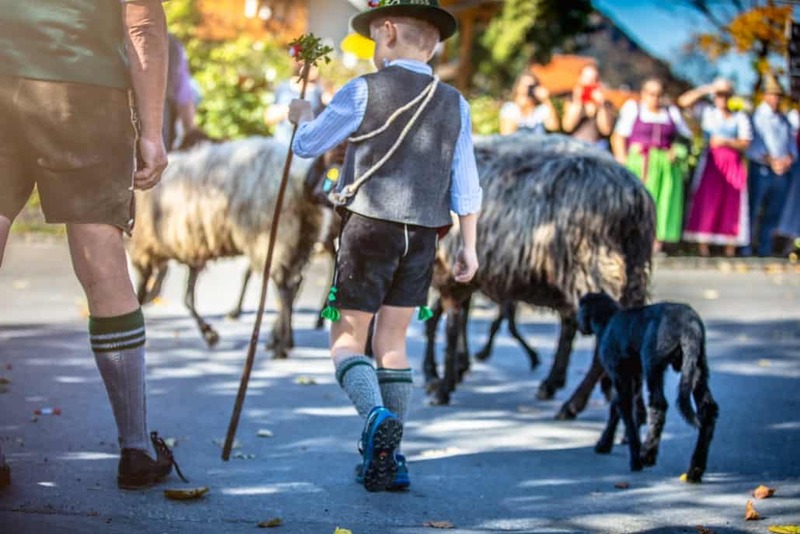 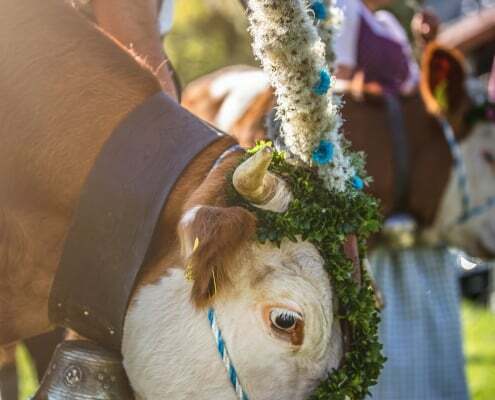 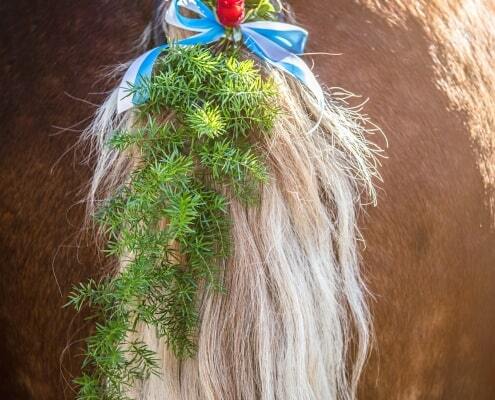 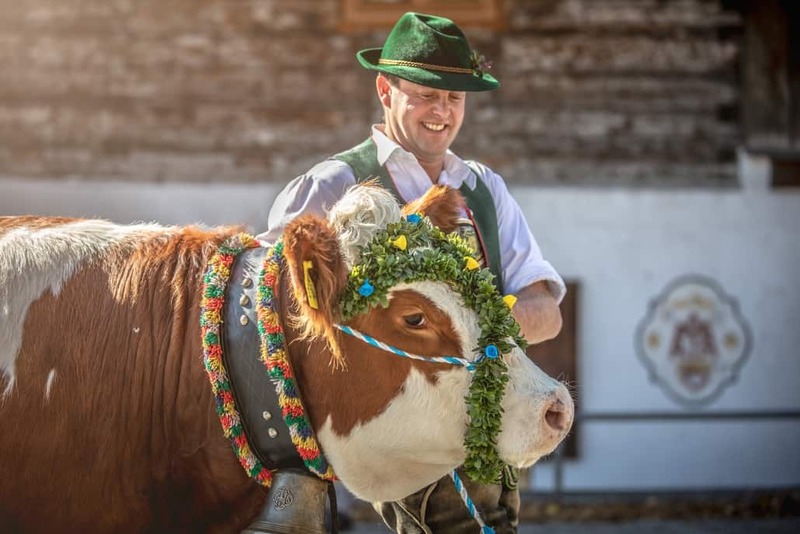 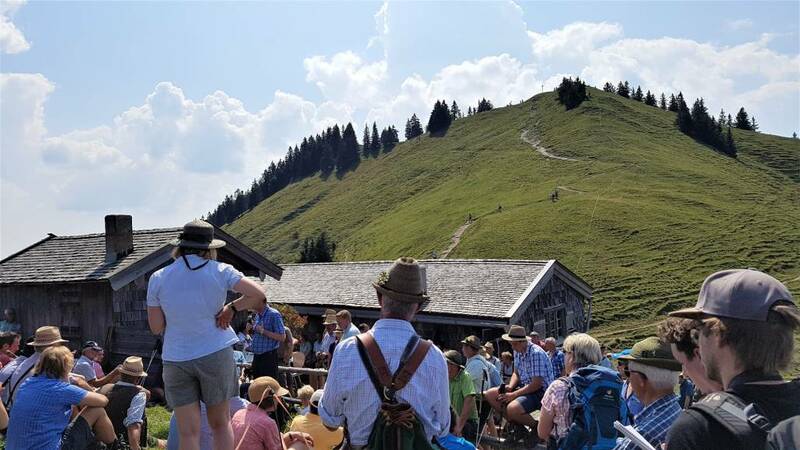 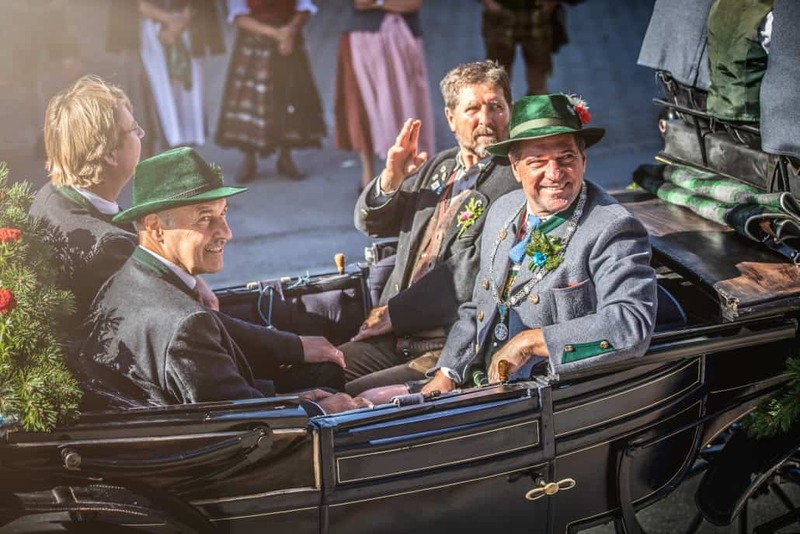 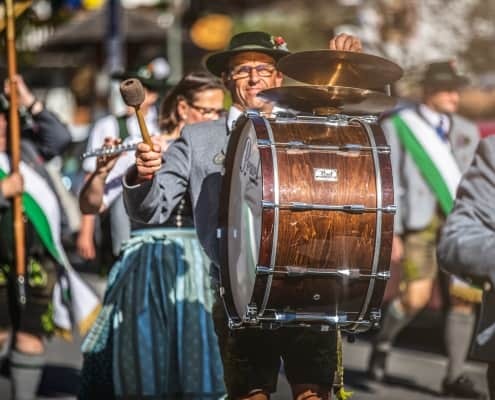 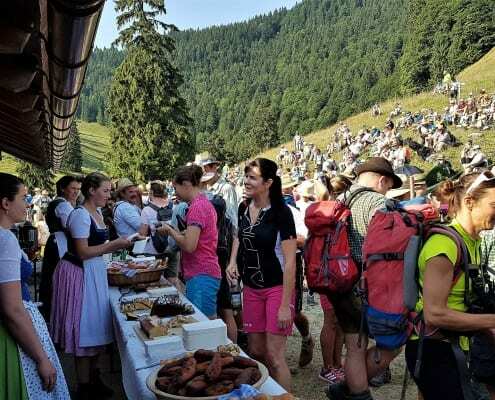 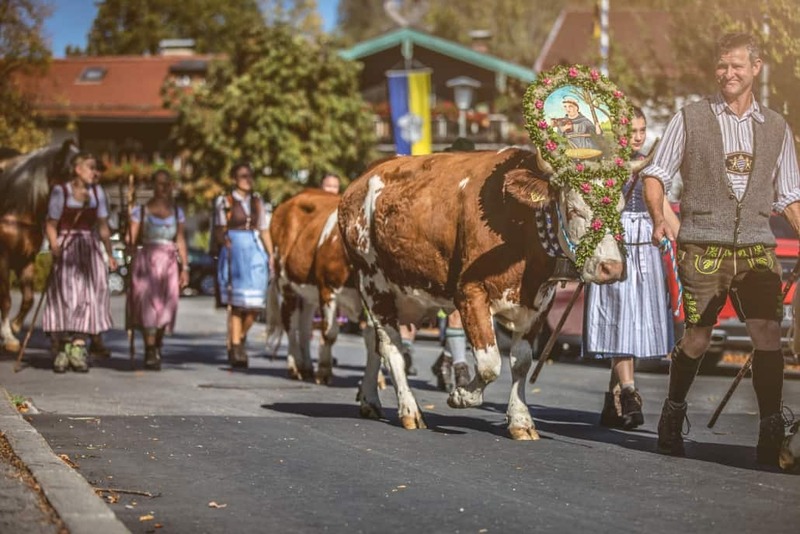 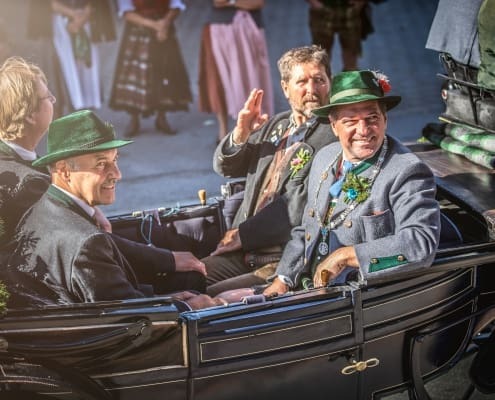 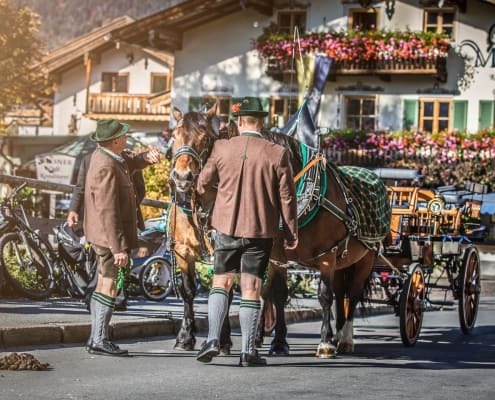 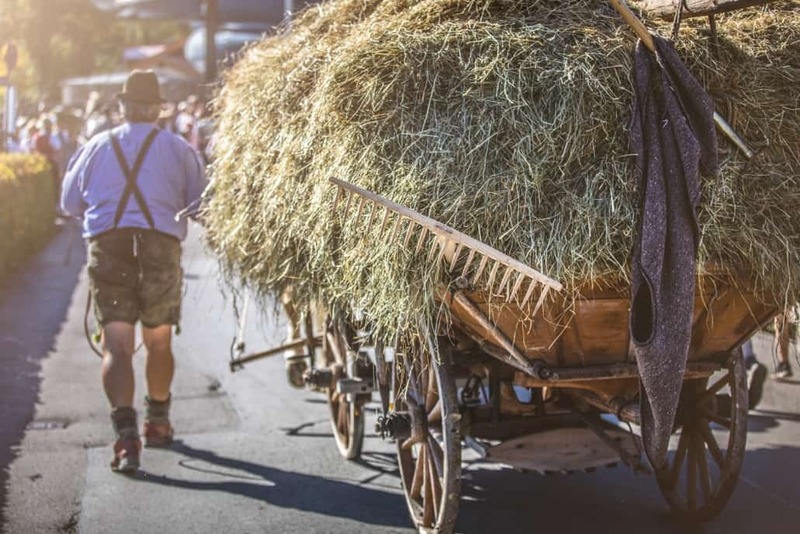 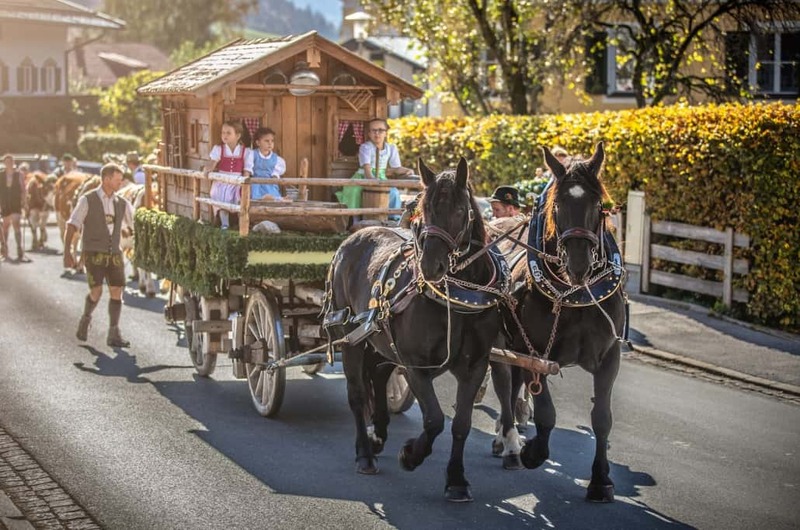 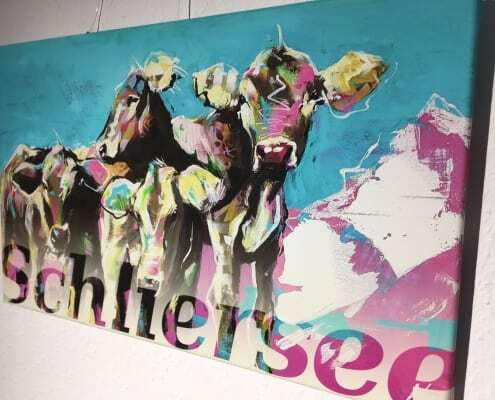 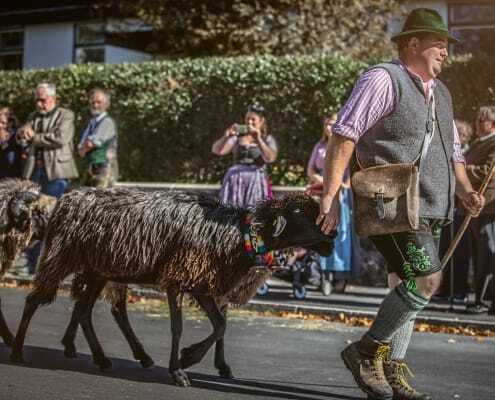 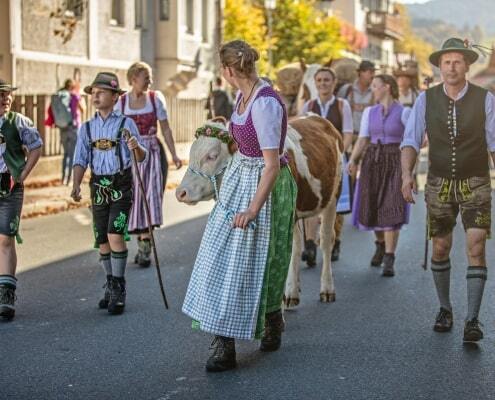 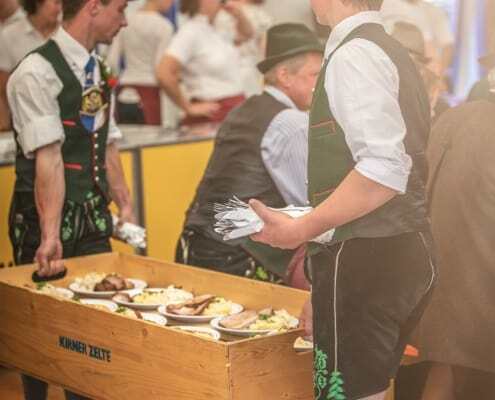 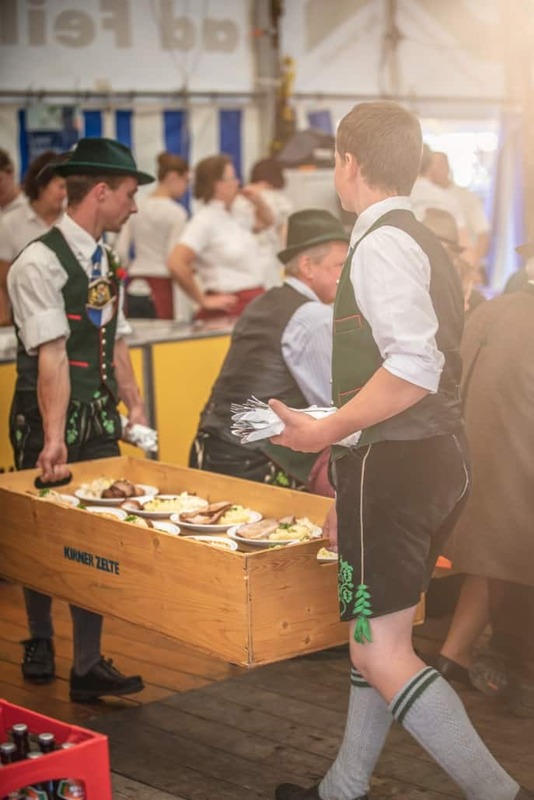 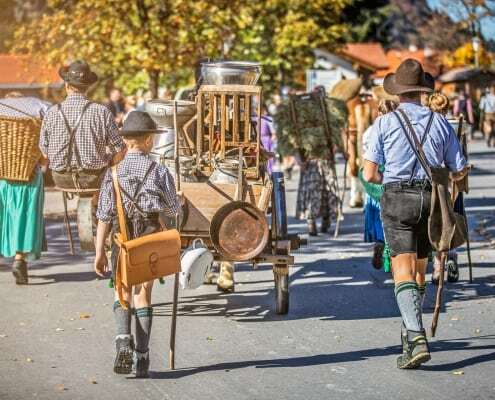 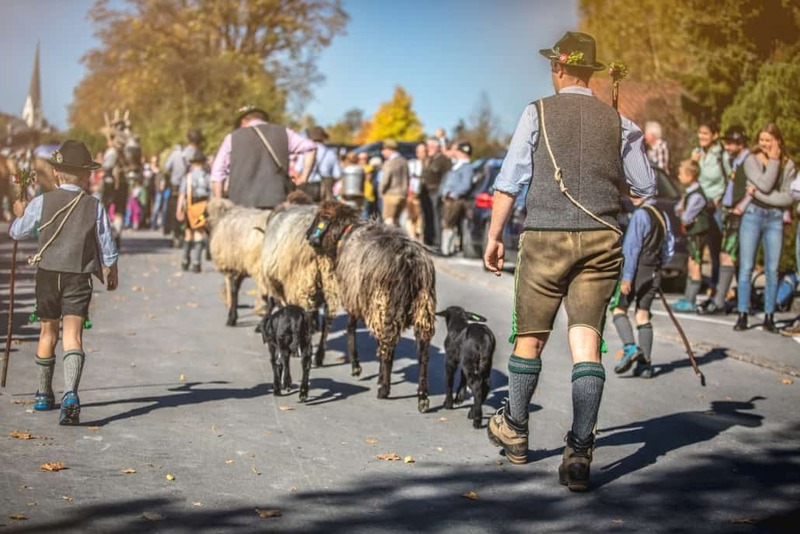 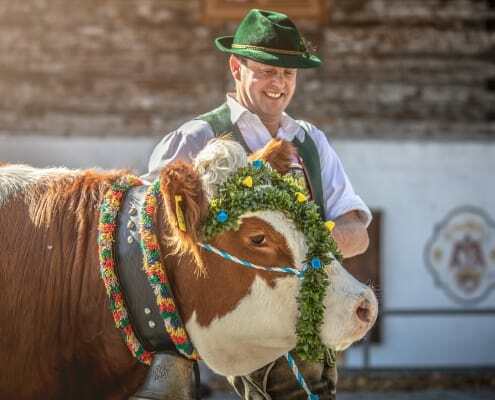 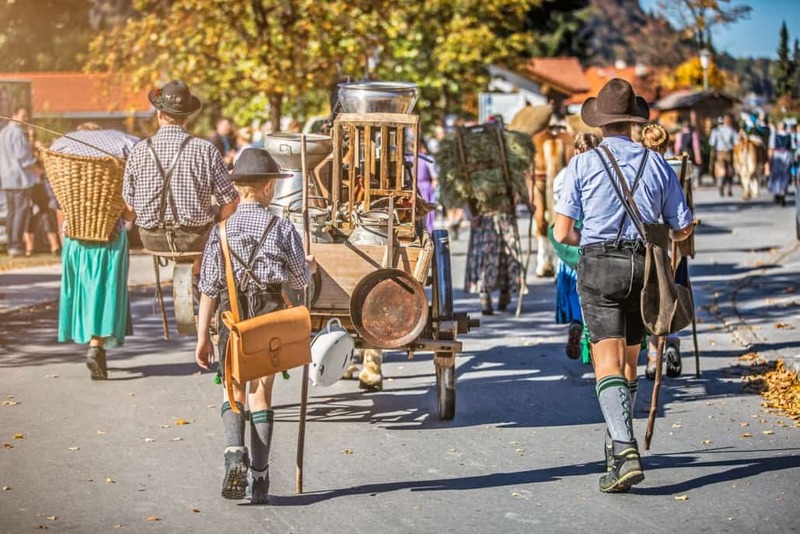 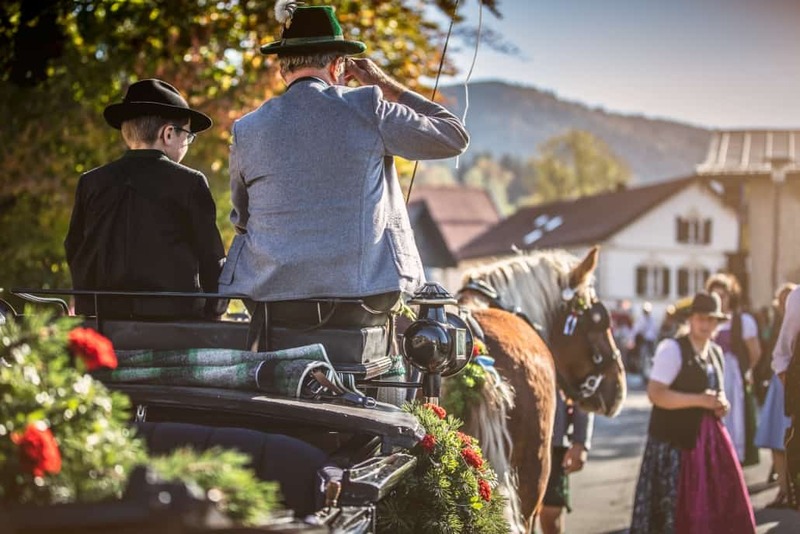 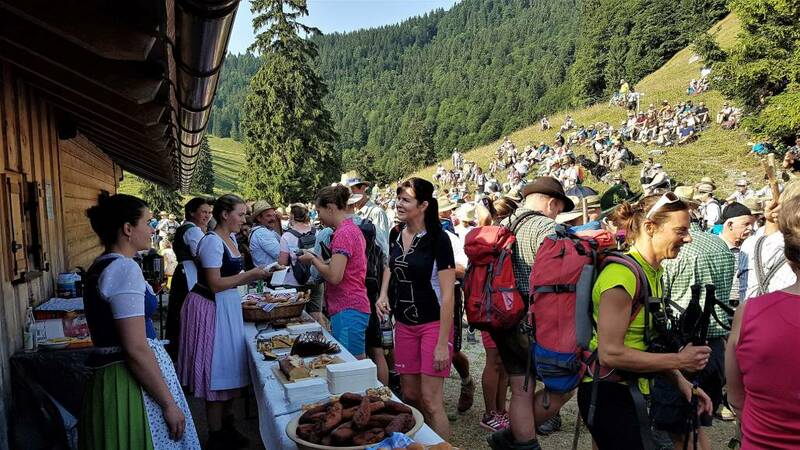 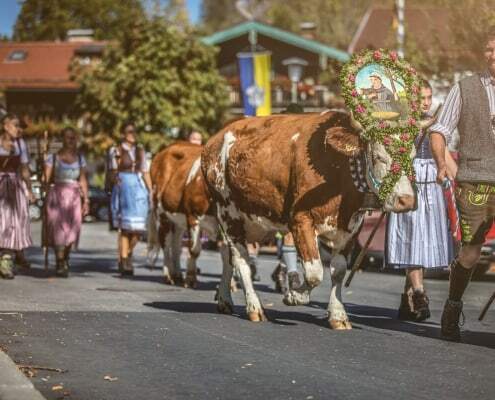 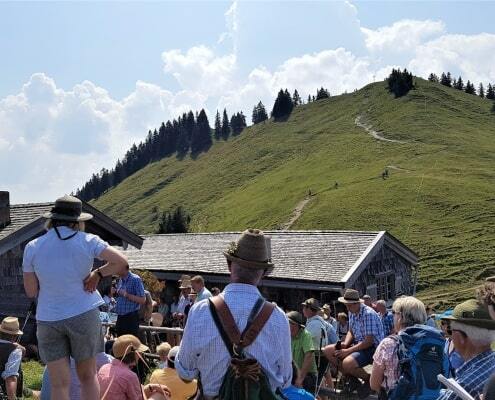 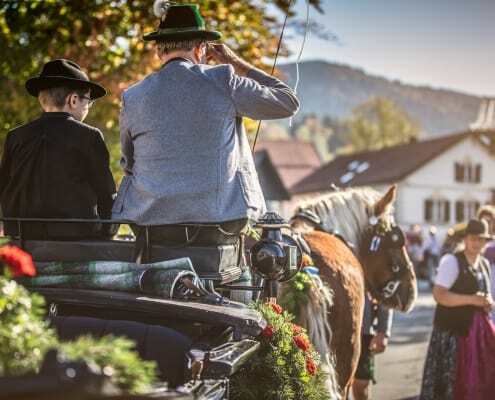 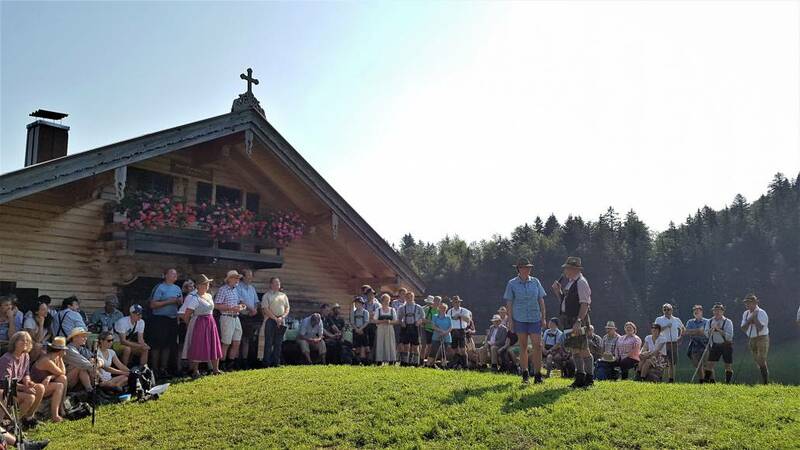 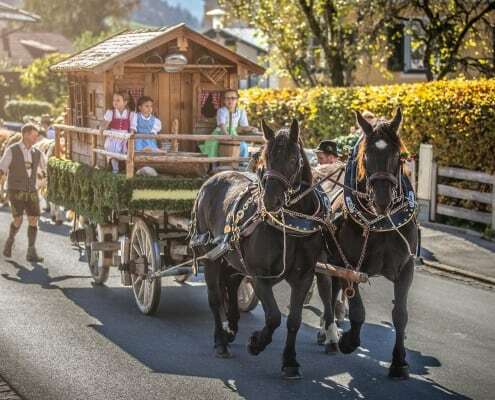 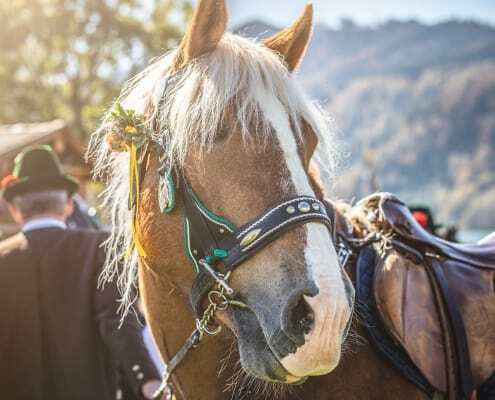 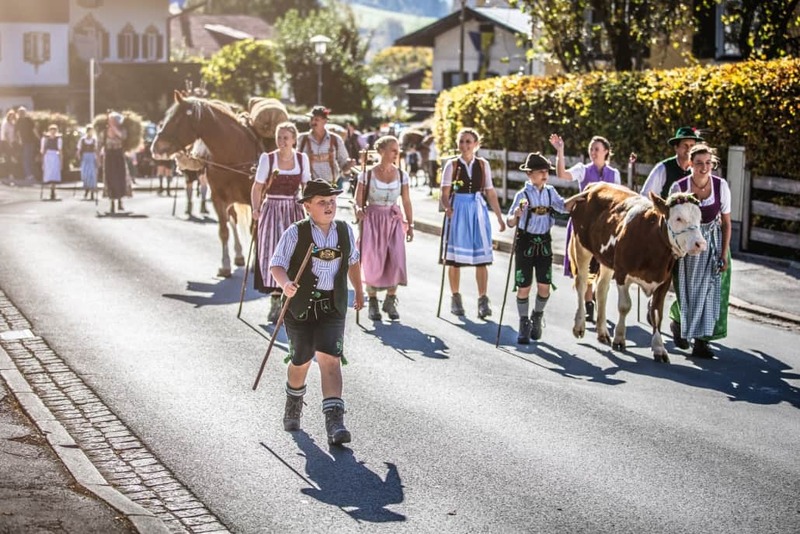 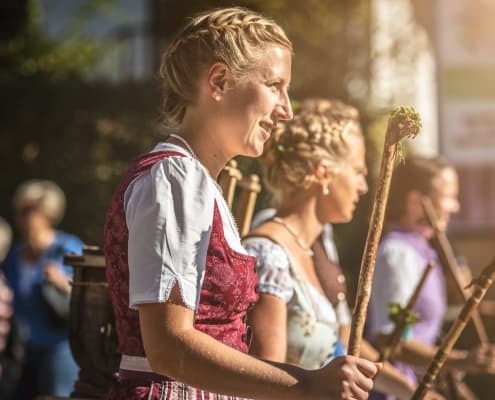 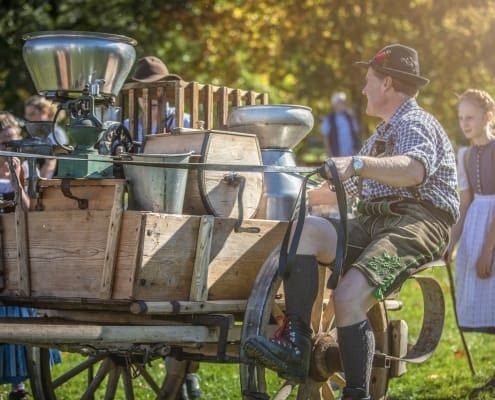 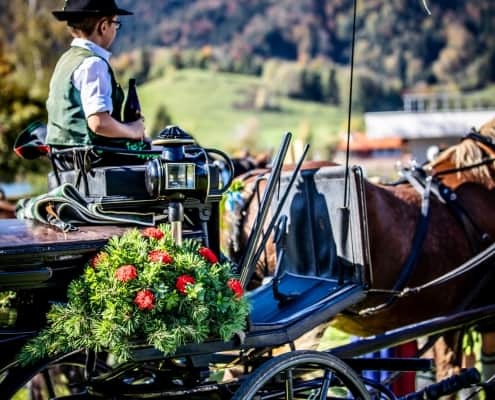 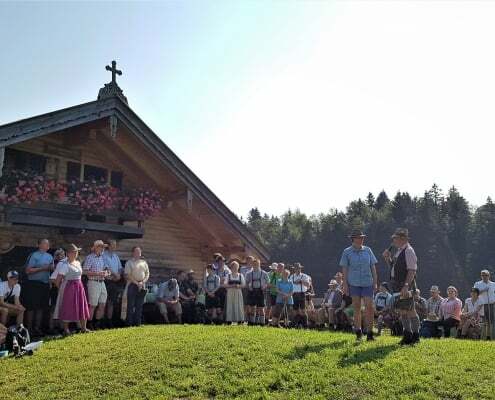 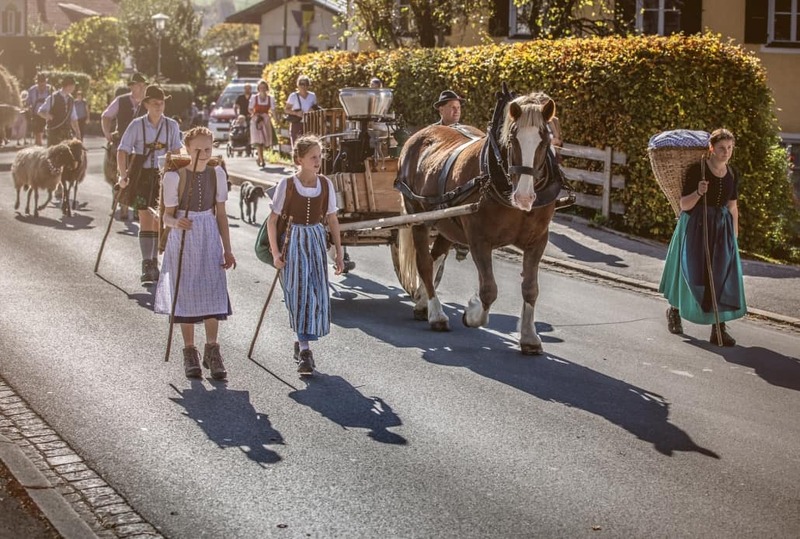 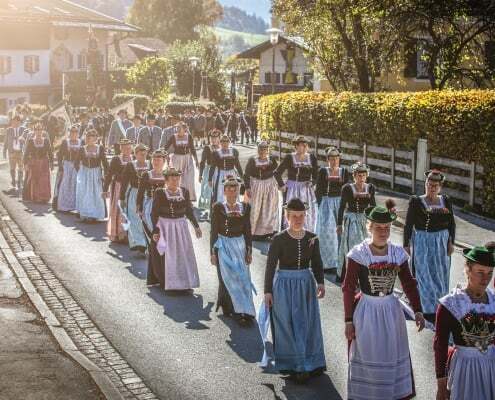 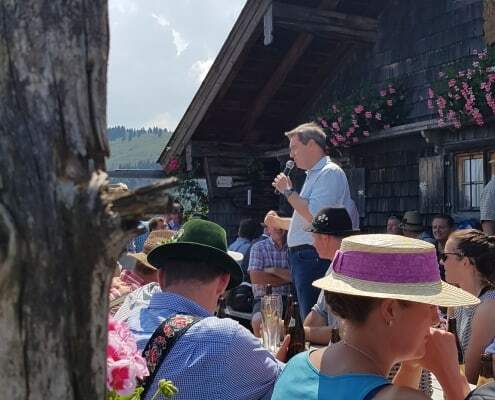 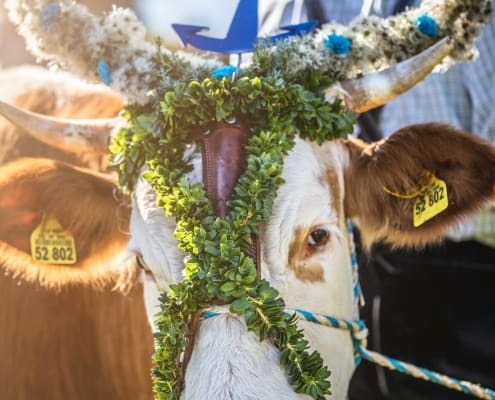 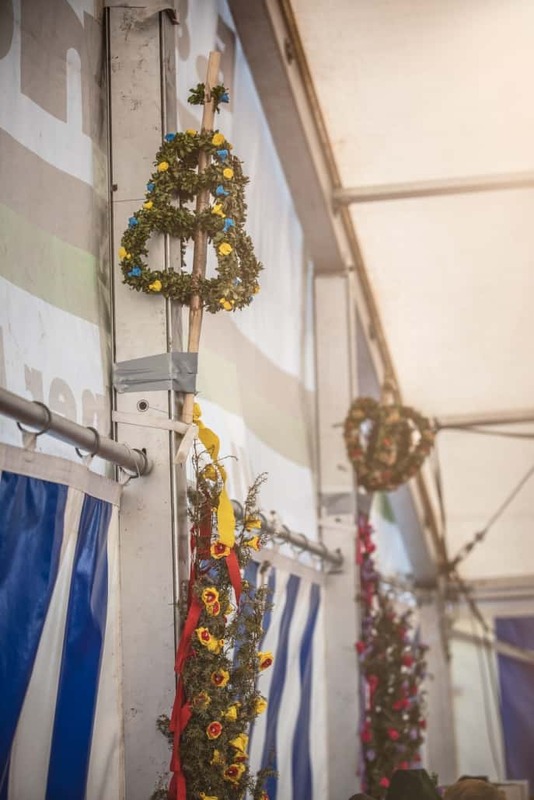 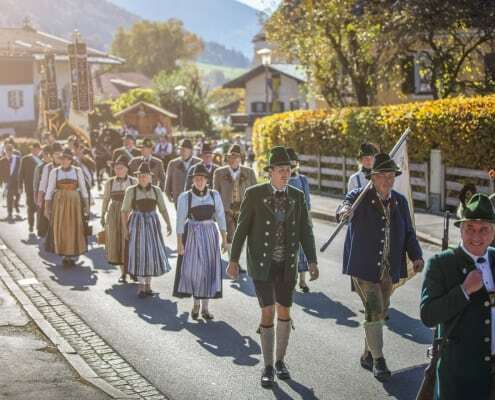 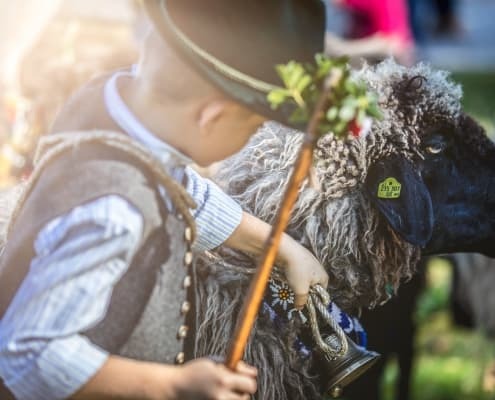 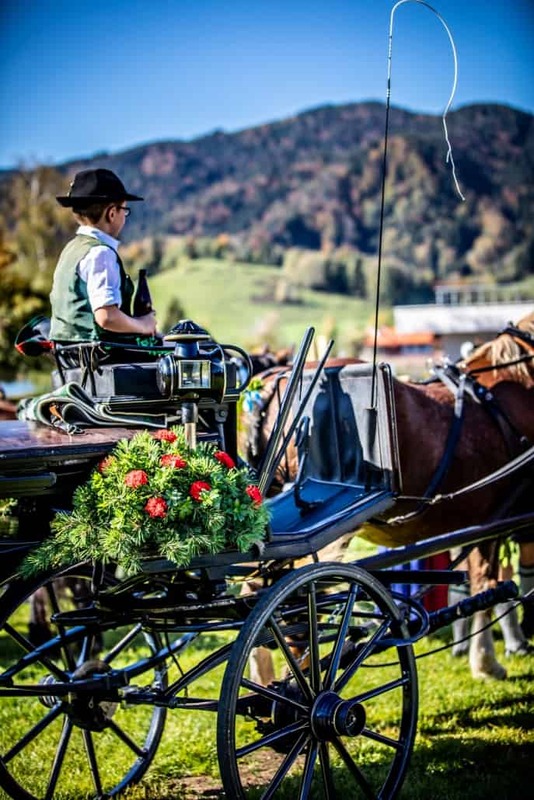 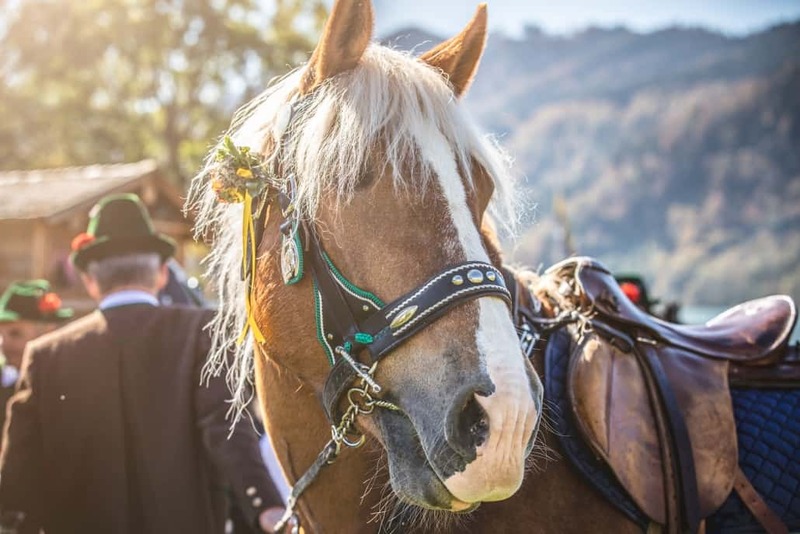 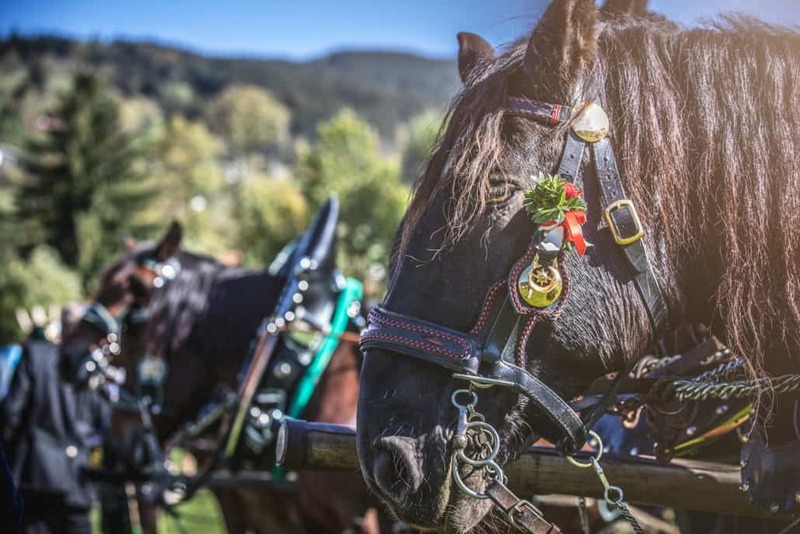 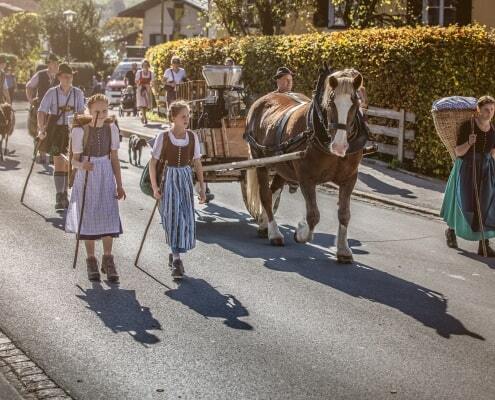 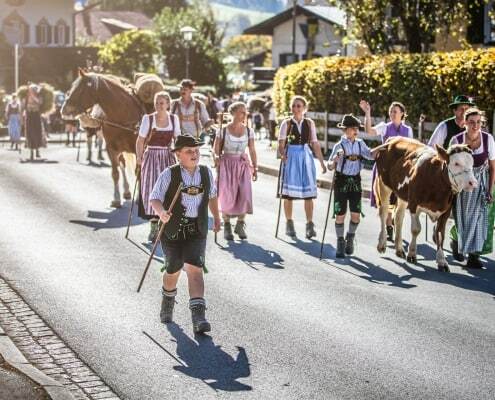 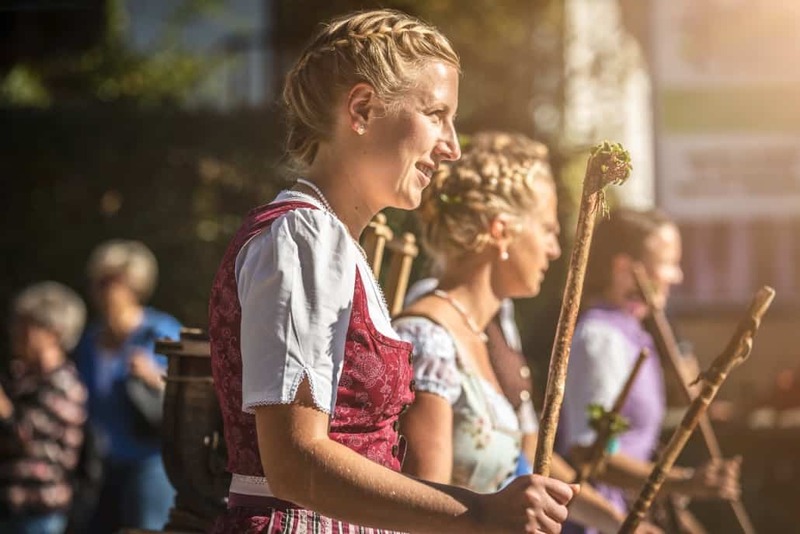 Last weekend, the farmers of Schliersee and of Oberbayern joined together to celebrate Almbauerntag. 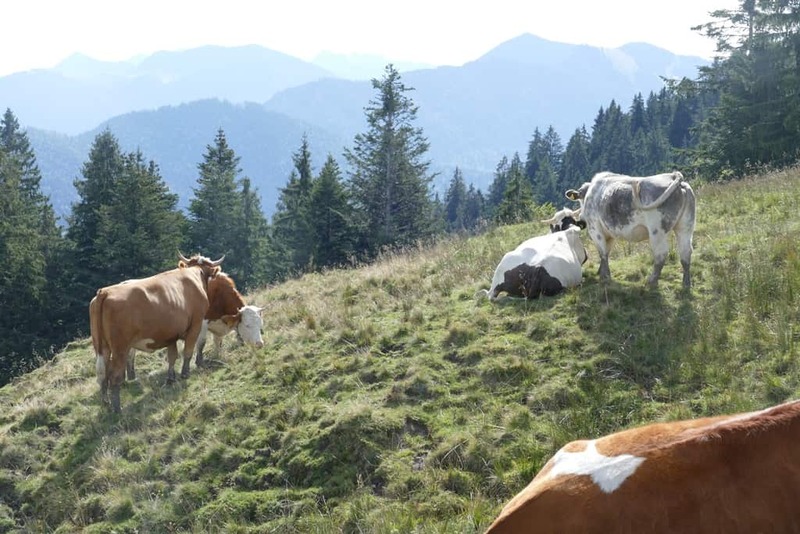 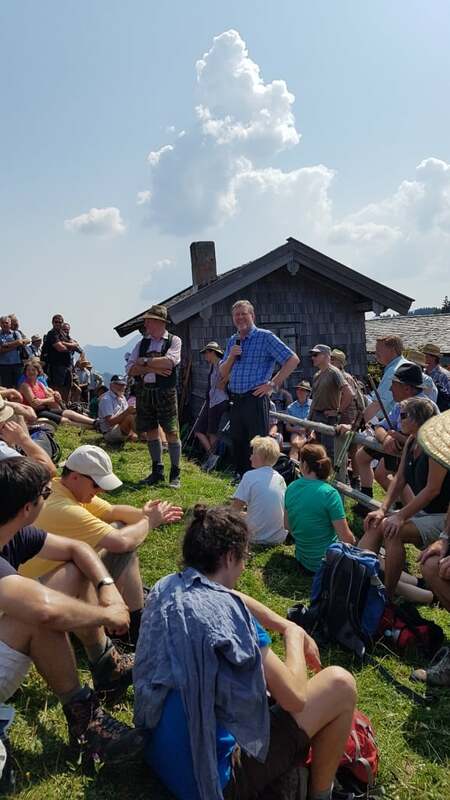 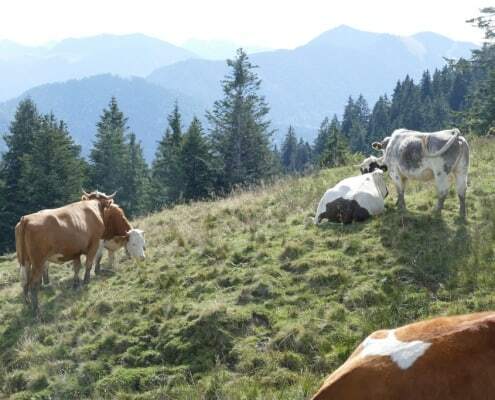 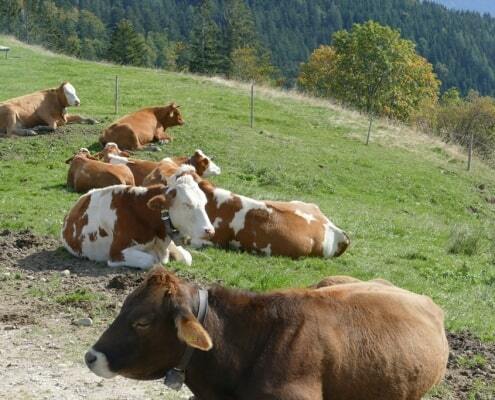 This year the council of farmers, who work the high pastures, gathered at one of our local Alms to discuss alpine farming issue both social and political. 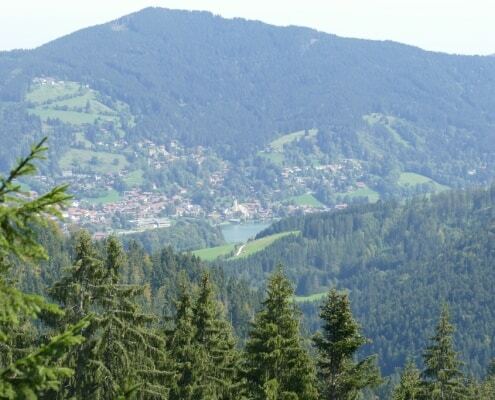 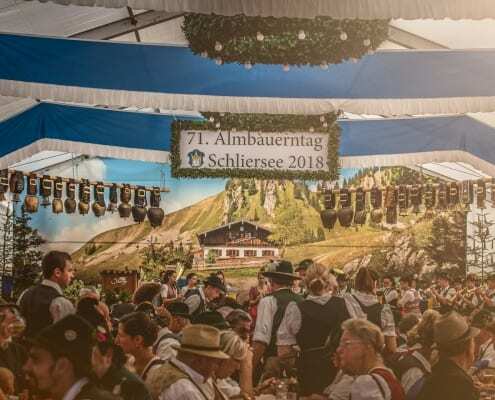 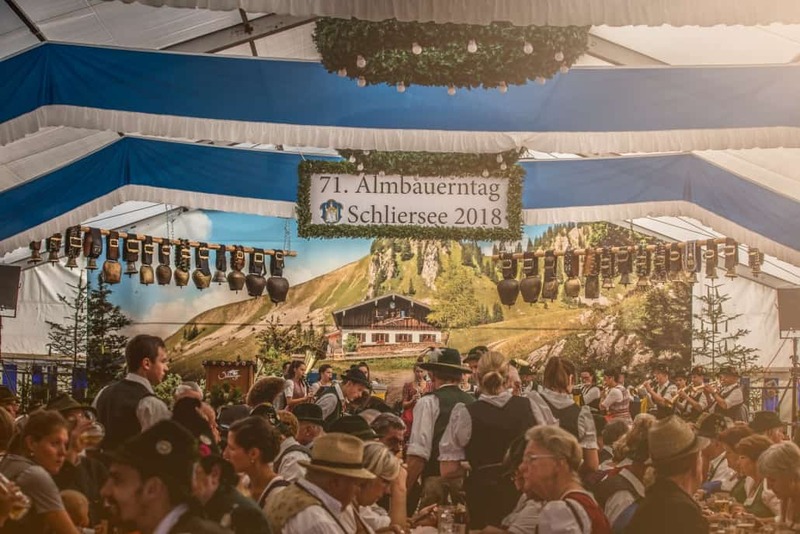 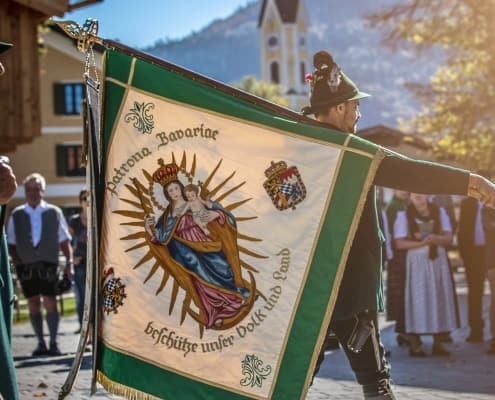 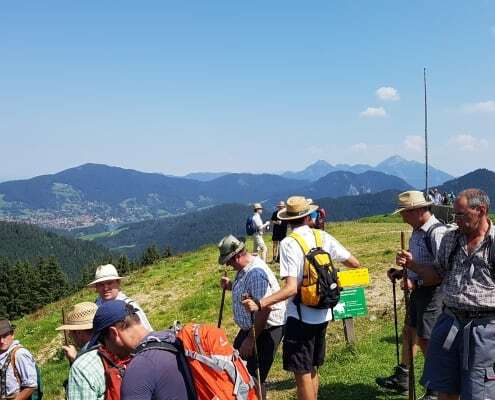 It was due to this fact that the 71st Almbauerntag for this region was happily celebrated this year here in Schliersee. 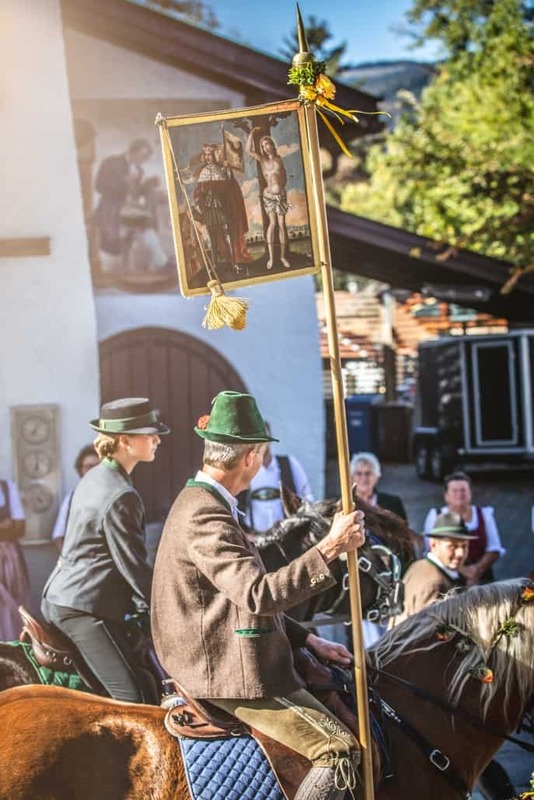 Almbauerntag is always celebrated on the second week in October two weeks following the last Almabtrieb, which is normally the 29th of September. 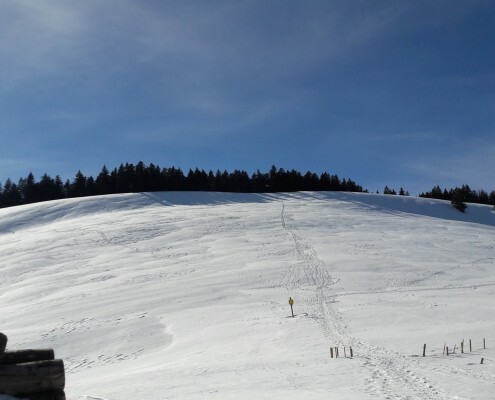 I am sure these dates have been established due to the weather, as we seem to get a light snowfall on the peeks during the first week of October. 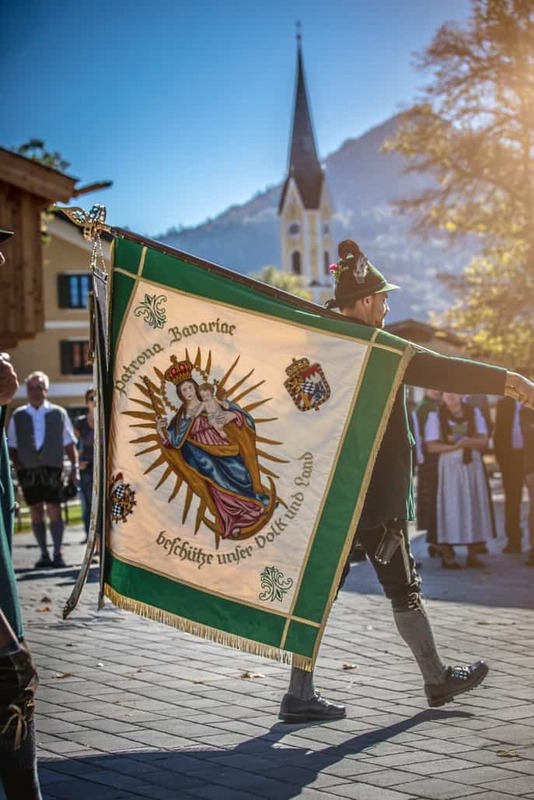 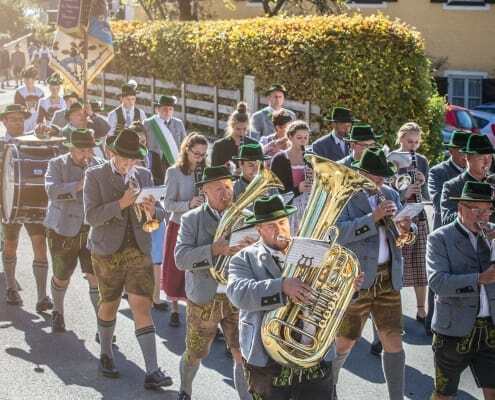 After a Sunday morning church service at St. Sixtus church in Schliersee, a procession including the local farmers, decorated animals, our local marching band, town council and the various trachten groups. 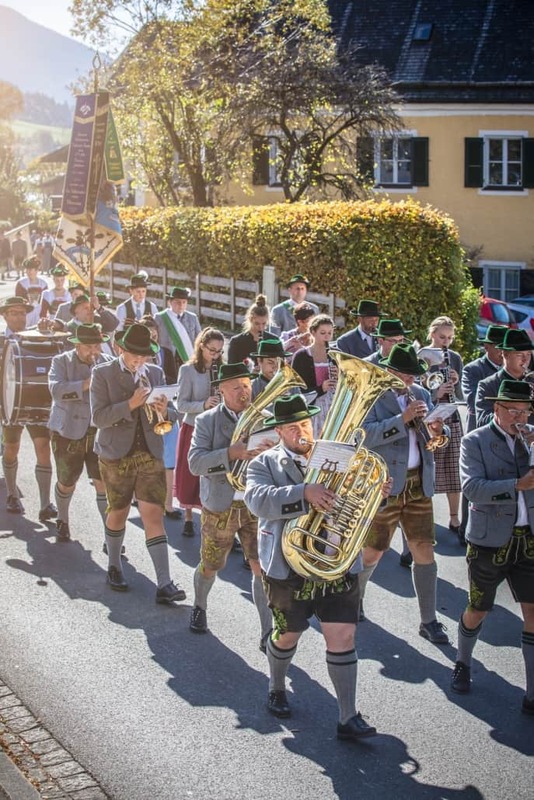 This colorful parade wound around the downtown area and ended up in an autumnal beer tent on the green near Vitalwelt. 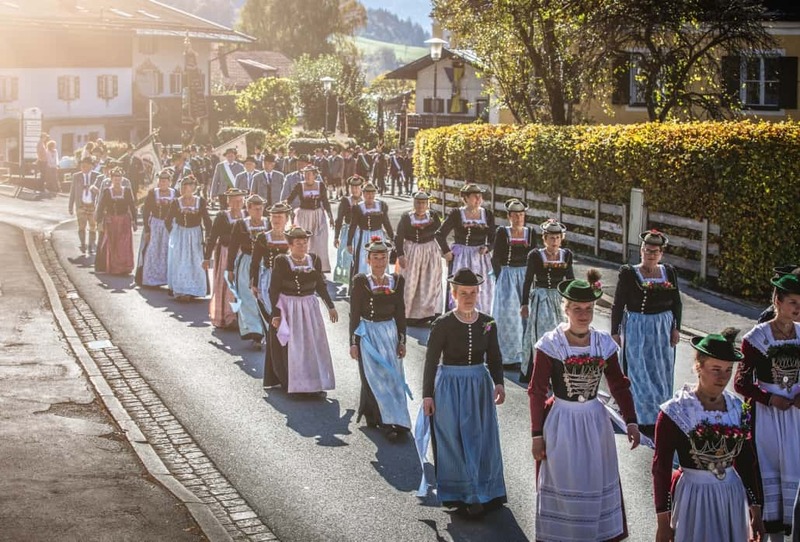 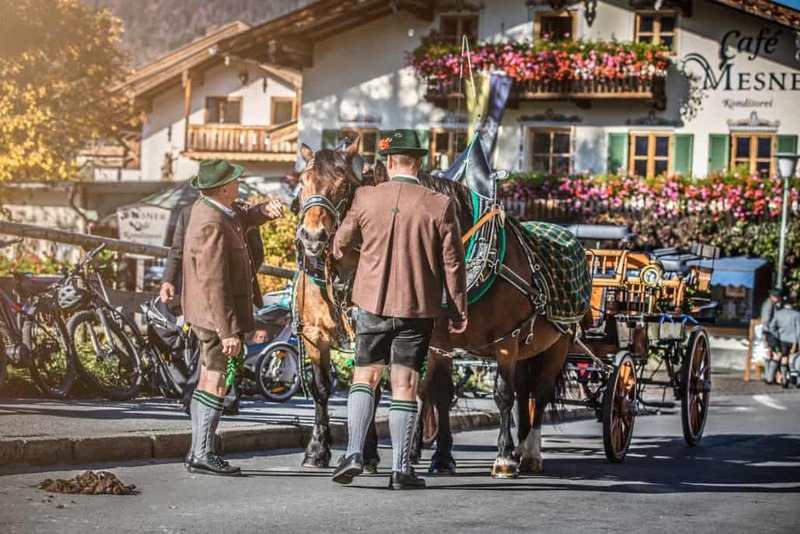 Locals and visitors alike gathered and lined the streets in colorful trachten, giving our alpine lake town a timeless appearance. 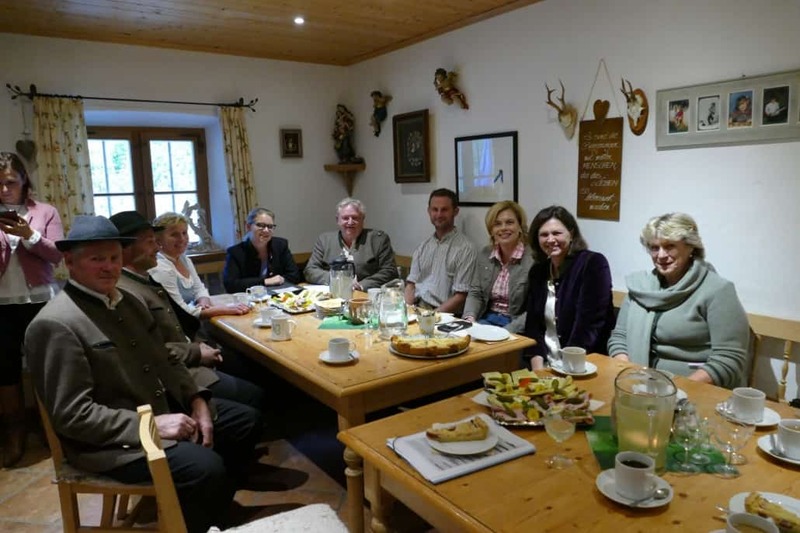 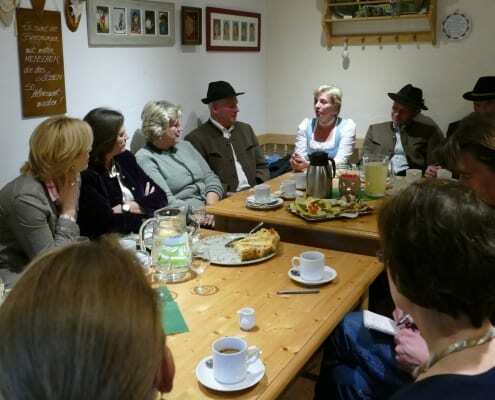 Many of our village farms including Jörgenbauer, Unterriß, Anderlbauer and Kirchbergerhof were in attendance. 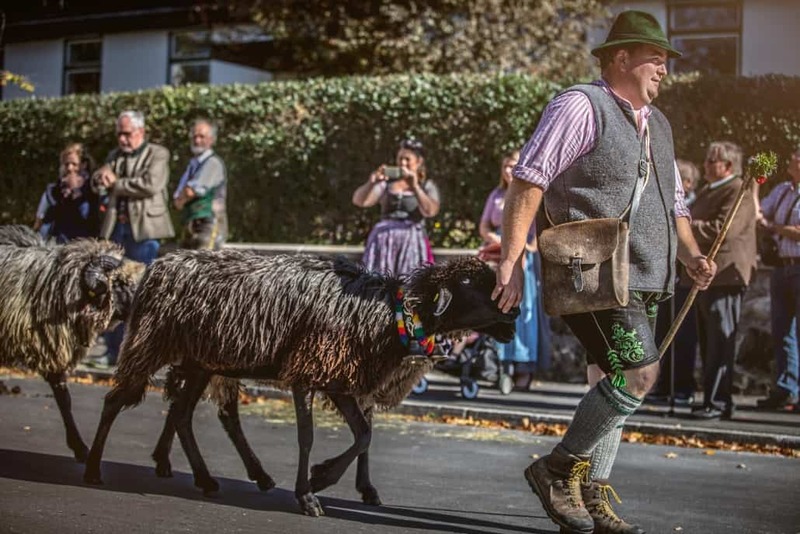 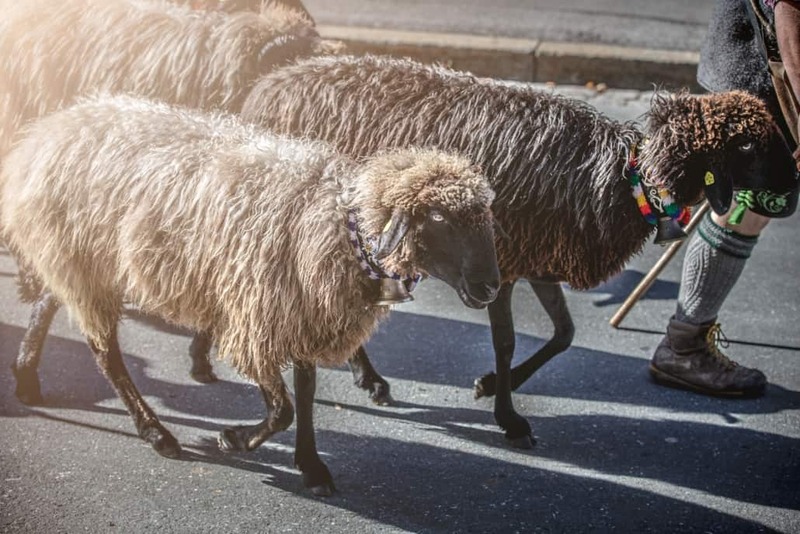 Franz Leitner of Kirchbergerhof brought along his beautiful black Bergschafe who were led through the bustling streets with only a handful of feed. 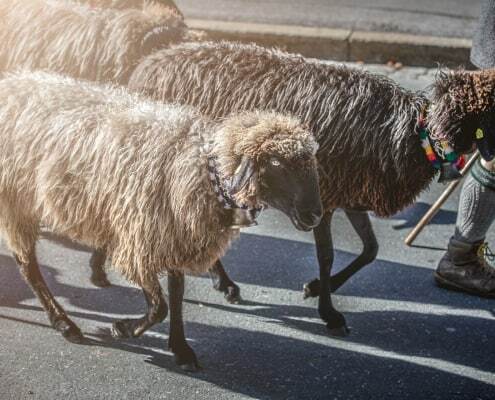 Bringing up the rear of their group where a pair of tail wagging baby lambs. 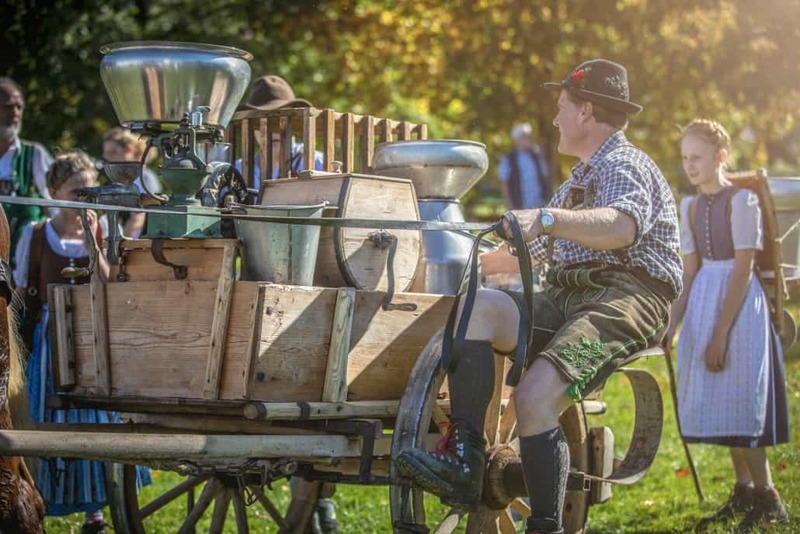 Hartl Markhauser and his children displayed several historic harvesting equipment. 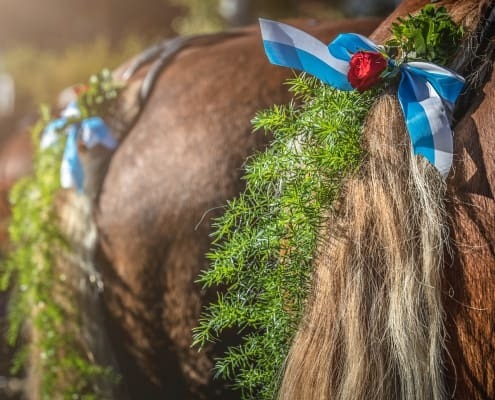 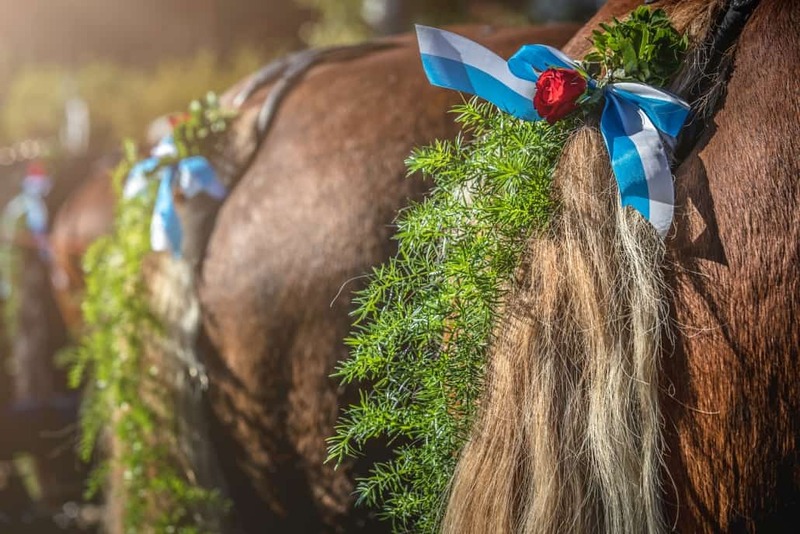 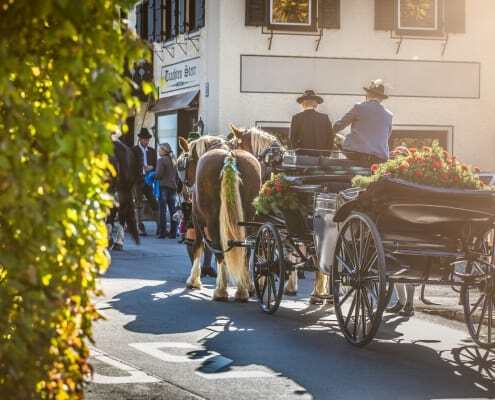 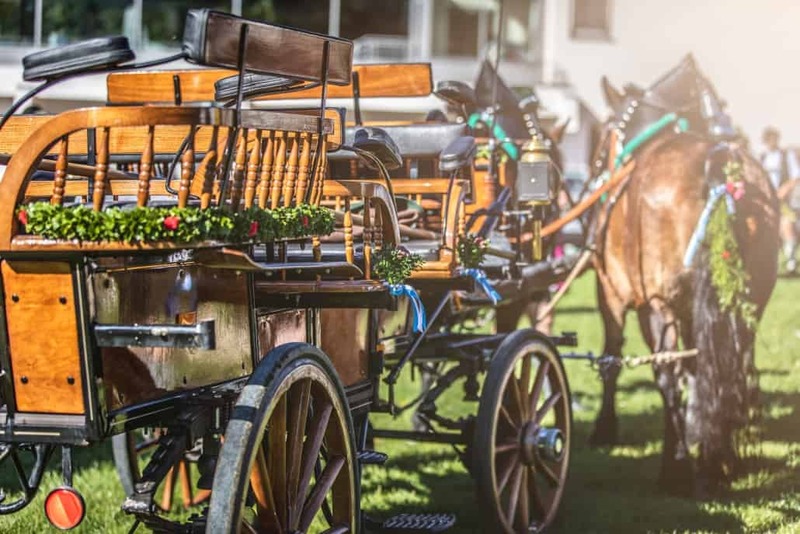 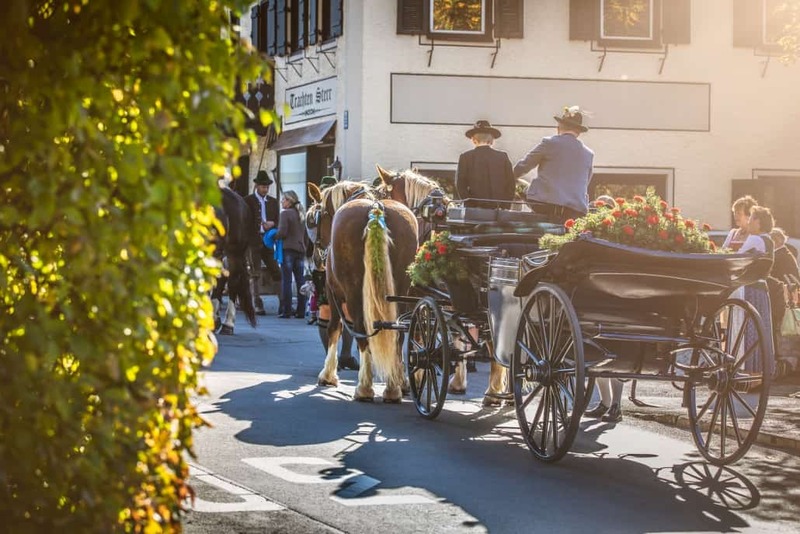 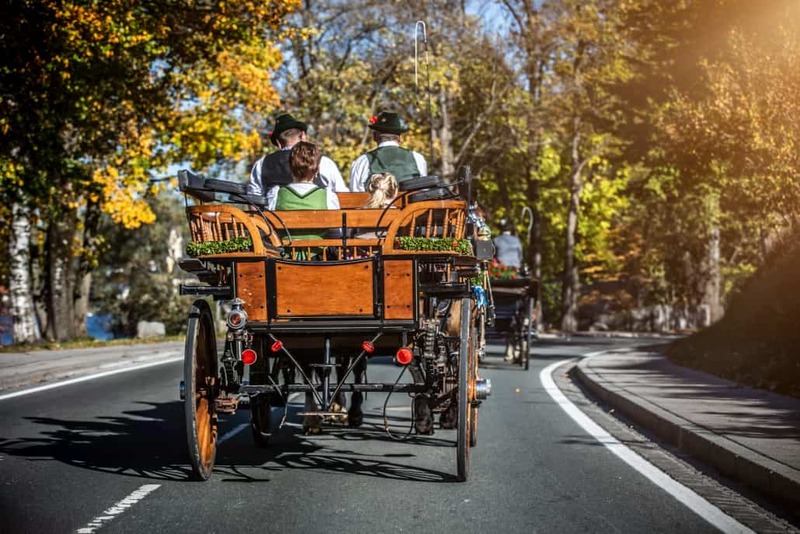 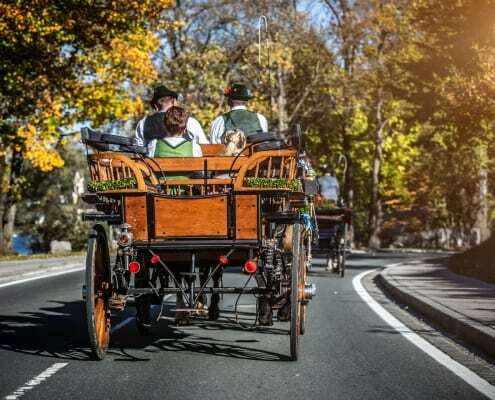 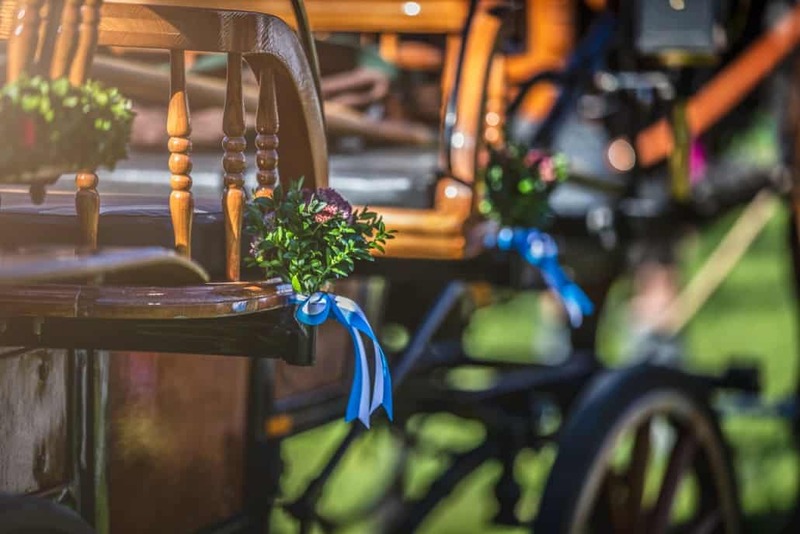 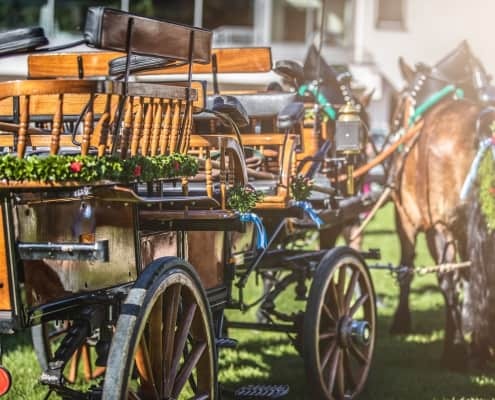 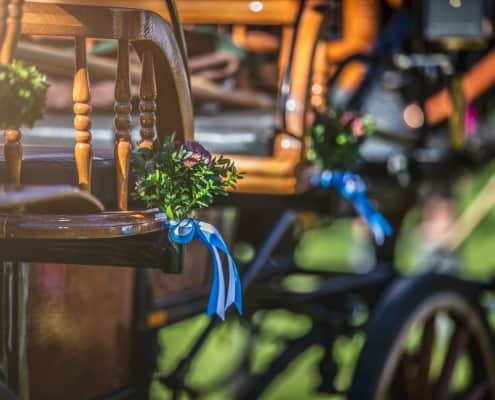 Carriages festooned with ribbons and colorful flower bouquets; impeccably groomed horses with glistening livery were all in attendance as well. 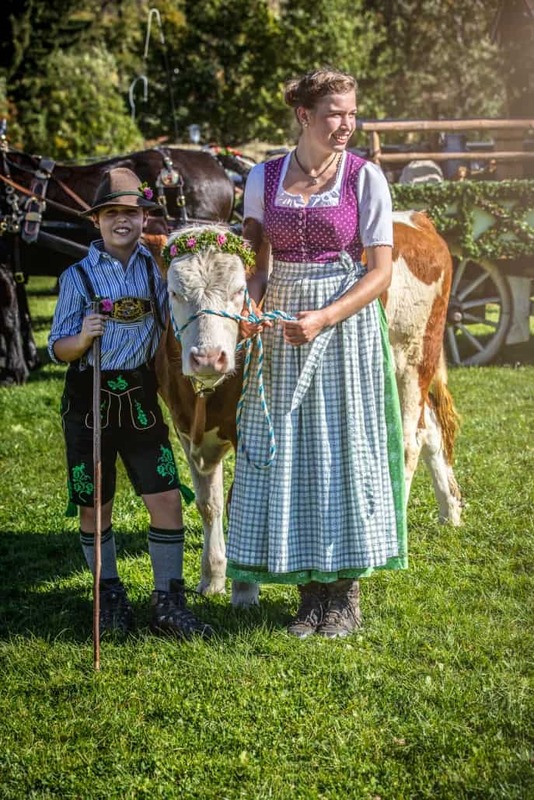 With traditional music filling the air, a small static display on the grass allowed visitors to capture plenty of photos before everyone headed into the cool shade of the tent. 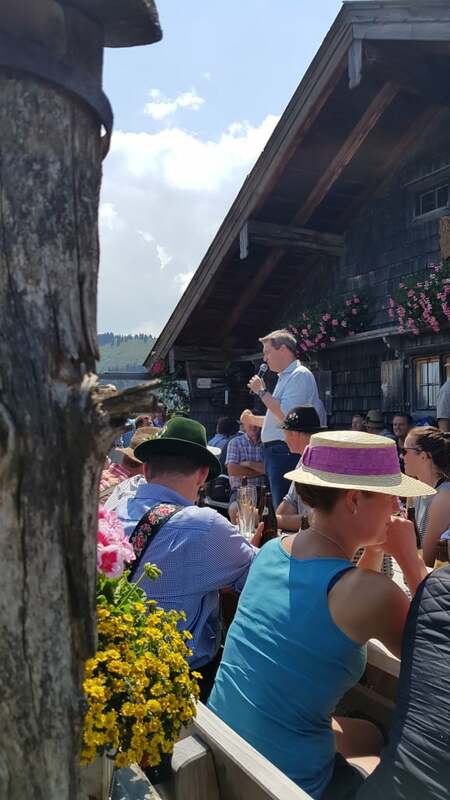 A deliciously fragrant lunch was catered with Bavarian efficiency to a packed crowd and refreshing drinks were quickly dispatched. 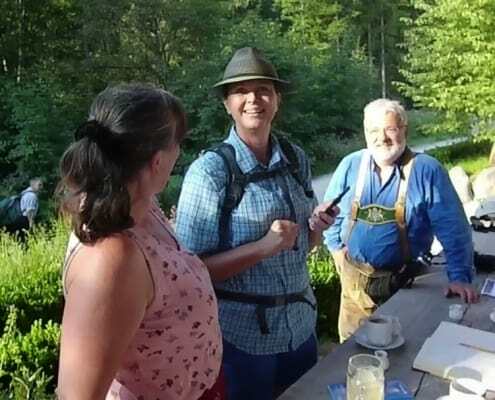 Our fellow contributor Angelika Prem from Hennererhof with the help of local Sennerin served slices of cake from a table awash in delectable deserts. 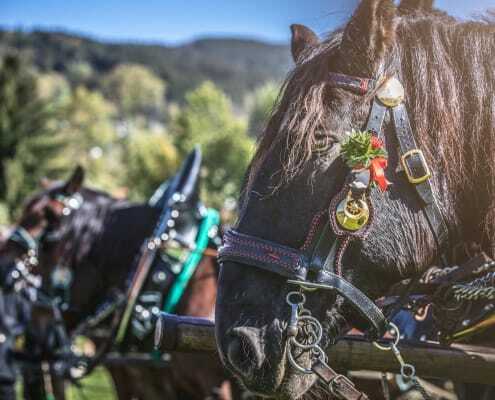 To find out more about our local farms and possibly plan your next farm friendly family holiday here are a few links from our farms. 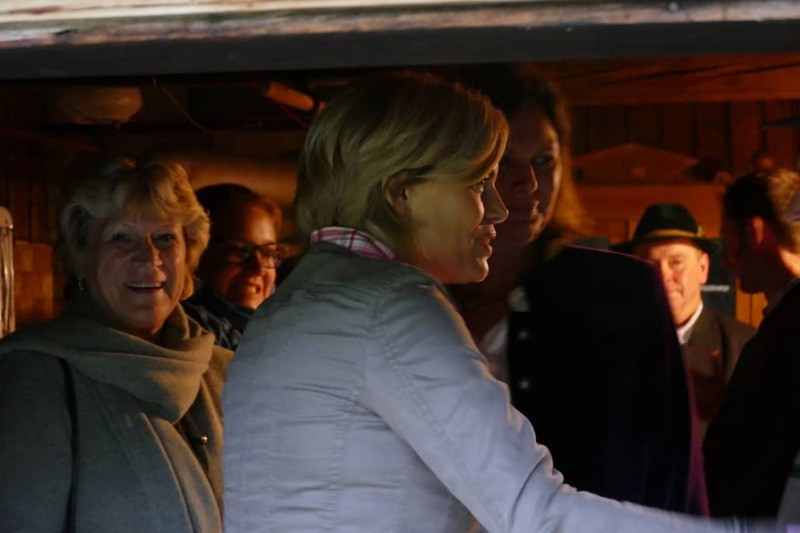 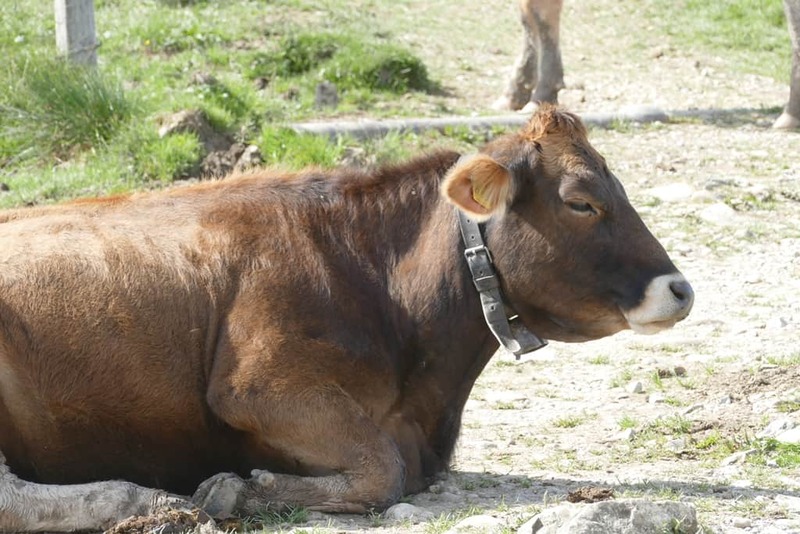 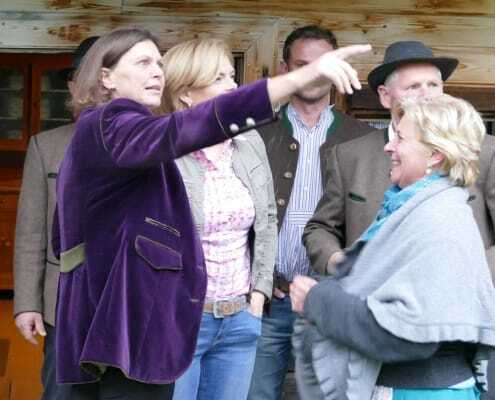 Bundeslandwirtschaftsministerin Julia Klöckner kommt mit Ilse Aigner auf Einladung des Schlierseer Almbauern Georg Kittenrainer und Kreisbäuerin Marlene Hupfauer nach Schliersee. 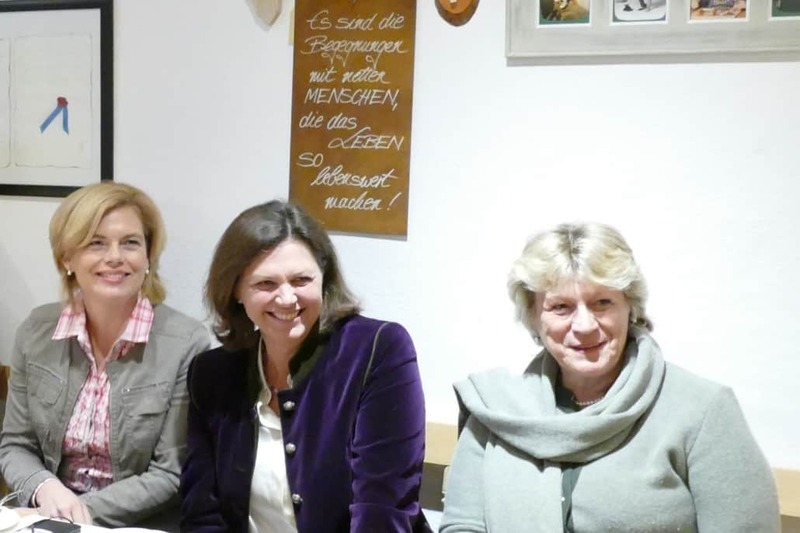 Vor Ort informierten sich Julia Klöckner und Ilse Aigner bei den Schlierseer Almbauern über ihre Arbeit und die täglichen Herausforderungen. 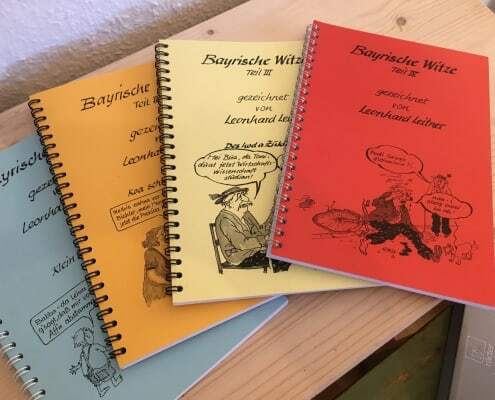 Die Almwirtschaft ist Landschafts- und Kulturgutpflege, zentral für den Schutz und Erhalt der Artenvielfalt. 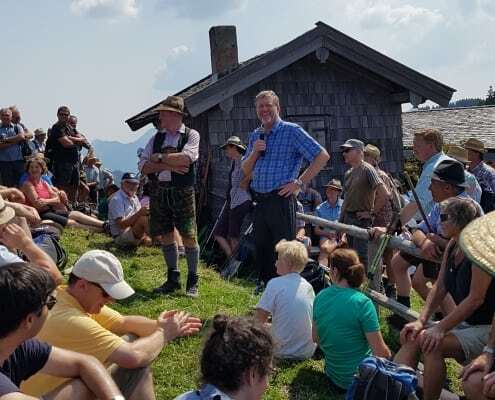 Durch die wertvolle Almbewirtschaftung ist in den Schlierseer Bergen eine sehr, sehr große Artenvielfalt anzutreffen. 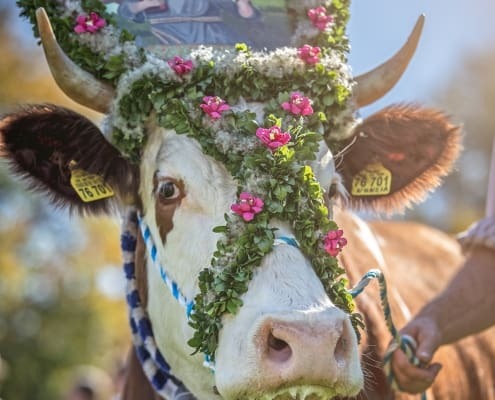 Die Pflanzen wurden vor Kurzem kartiert und dabei weit über 400 verschiedene Arten festgestellt. 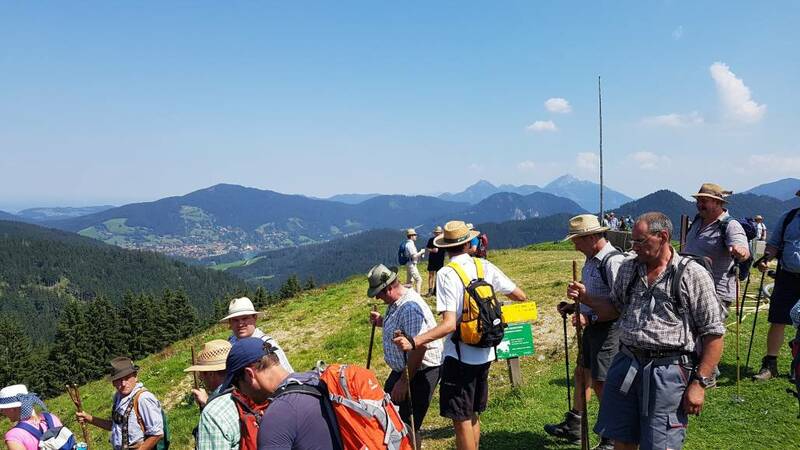 Wir versuchen durch gezielte Aufklärungsarbeit an die Politiker, Touristen, Einheimischen, Sportler und Freizeiterholungsuchenden, diese wertvolle Landschaft und Artenvielfalt auch für unsere nächsten Generationen zu erhalten. 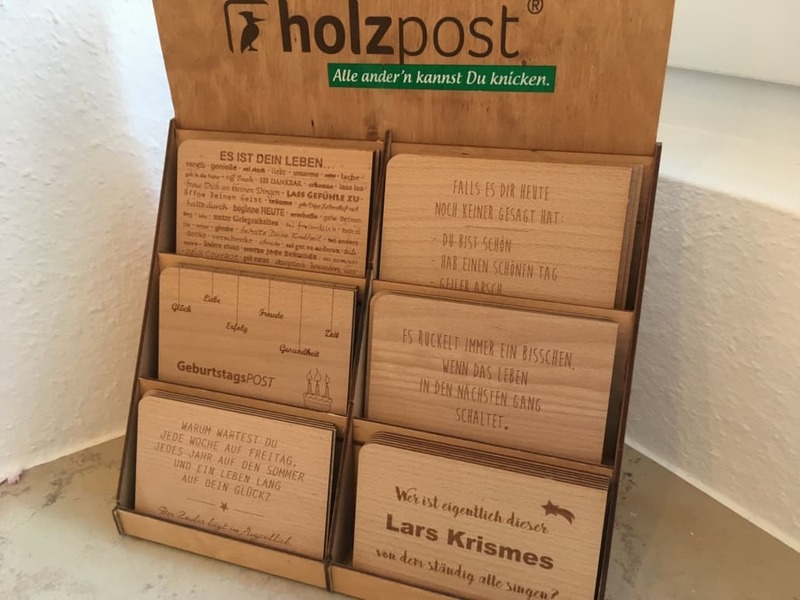 Durch ein gezieltes Management können wir erreichen, dass es auch in Zukunft ein gesundes Miteinander geben kann. 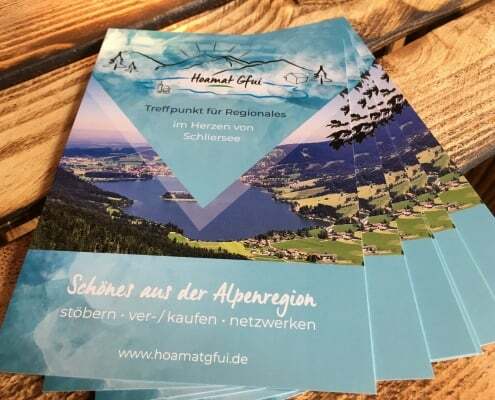 Kooperationspartner der Almbauern wie die Bayerischen Staatsforsten, Gemeinden, Touristikverbände, deutscher Sportbund, Naturschutzverbände etc. 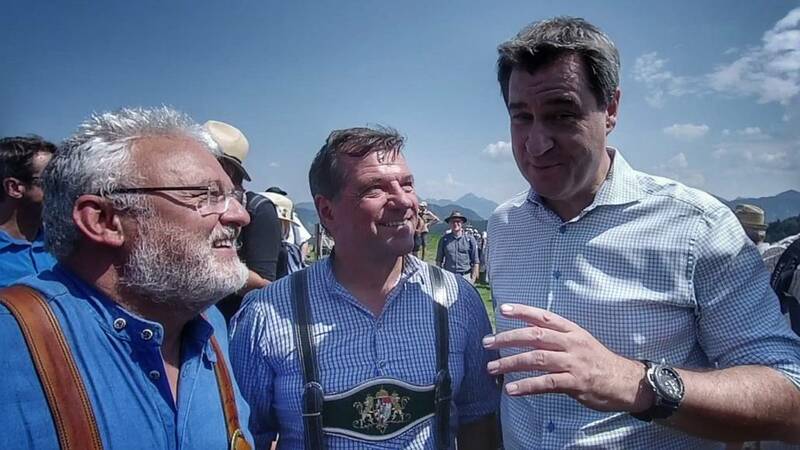 können dazu beitragen, dass dies durch Rücksicht von allen Seiten möglich ist. 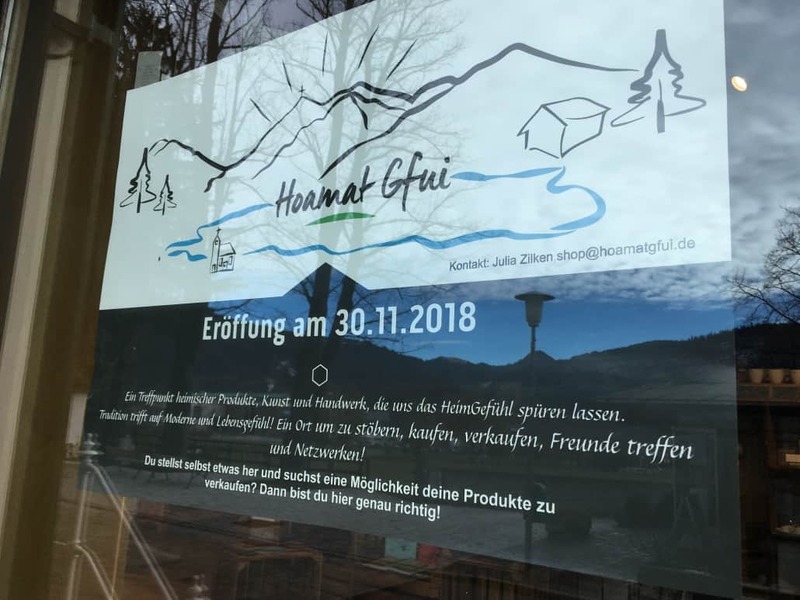 Dabei darf der Schutz von Eigentum nicht ins Hintertreffen geraten. 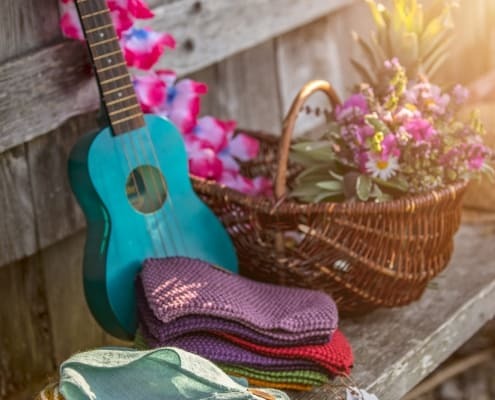 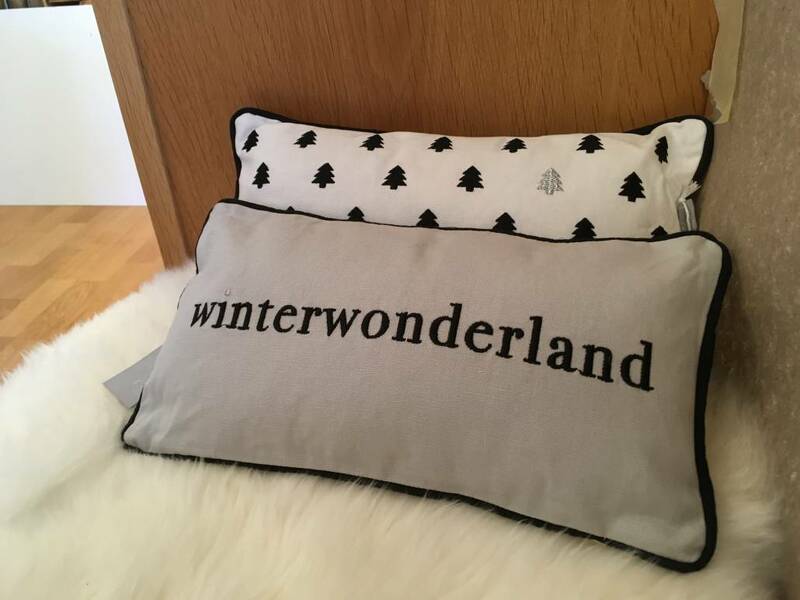 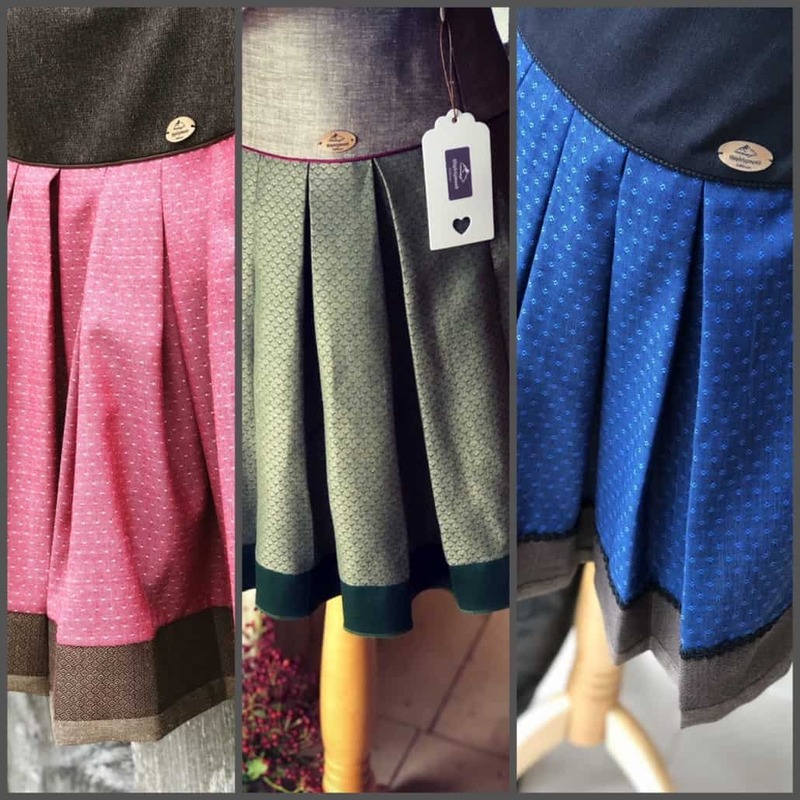 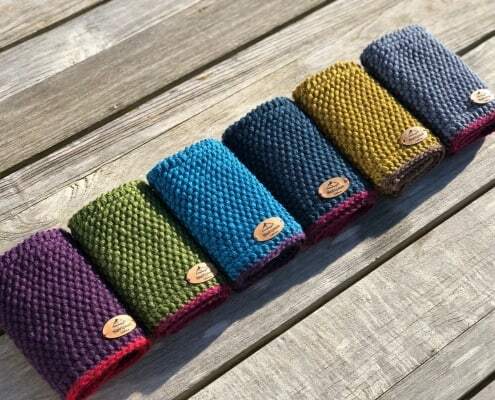 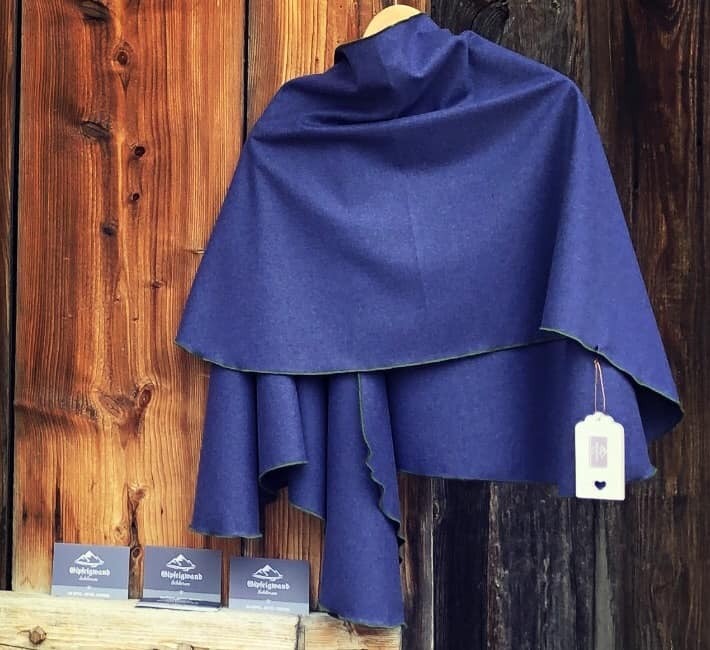 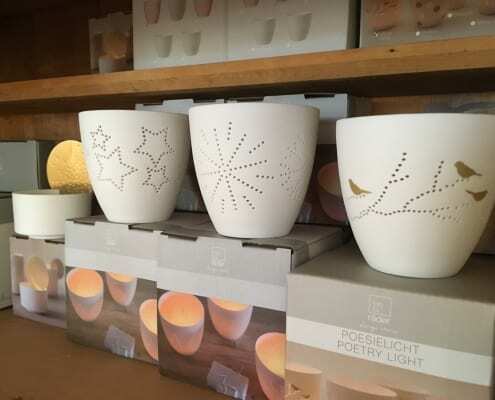 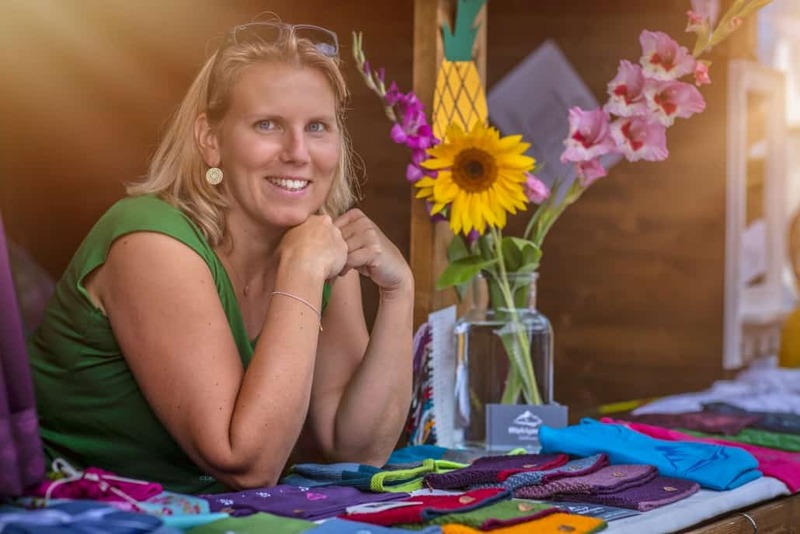 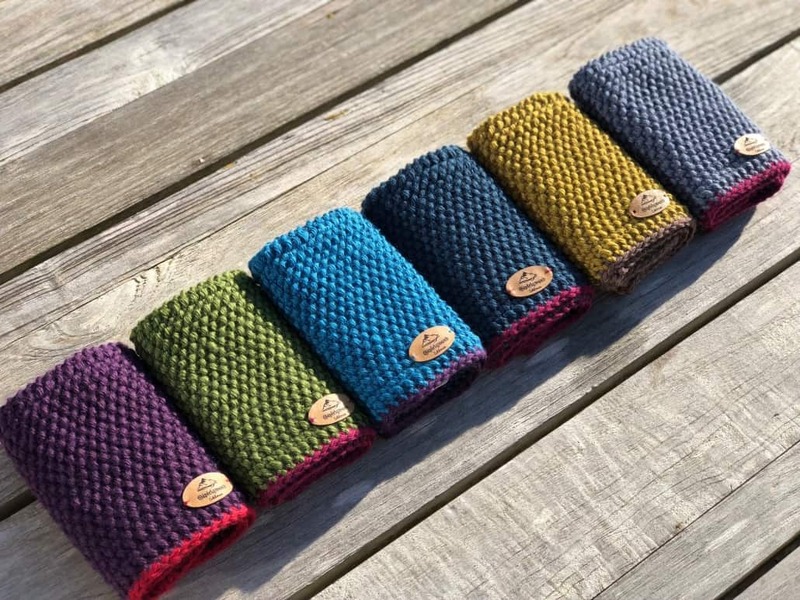 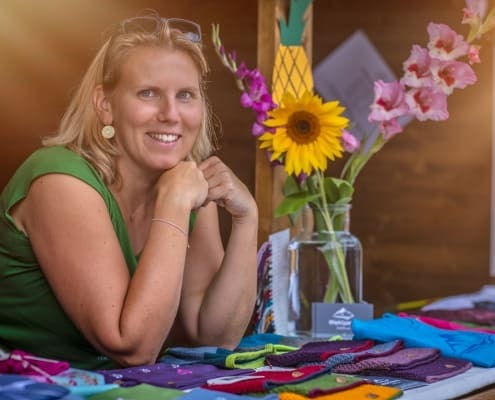 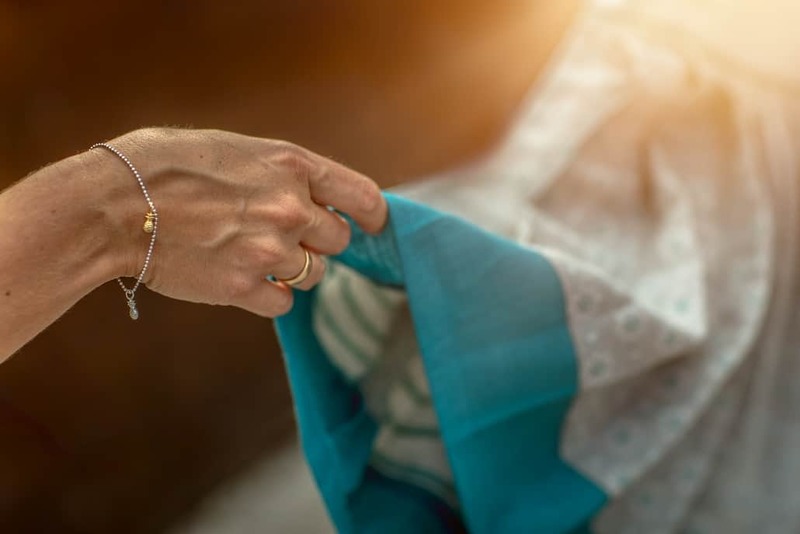 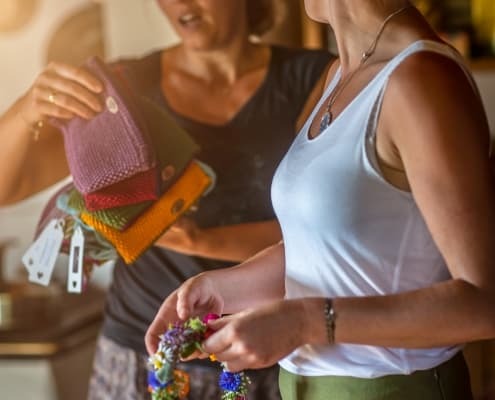 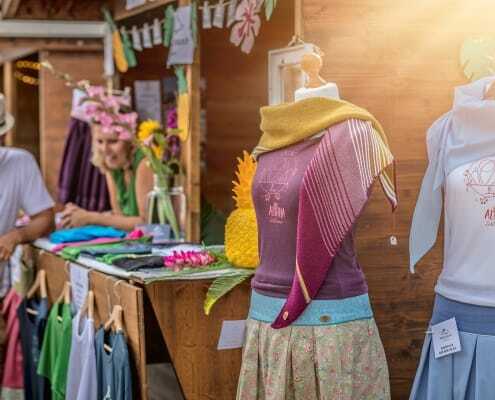 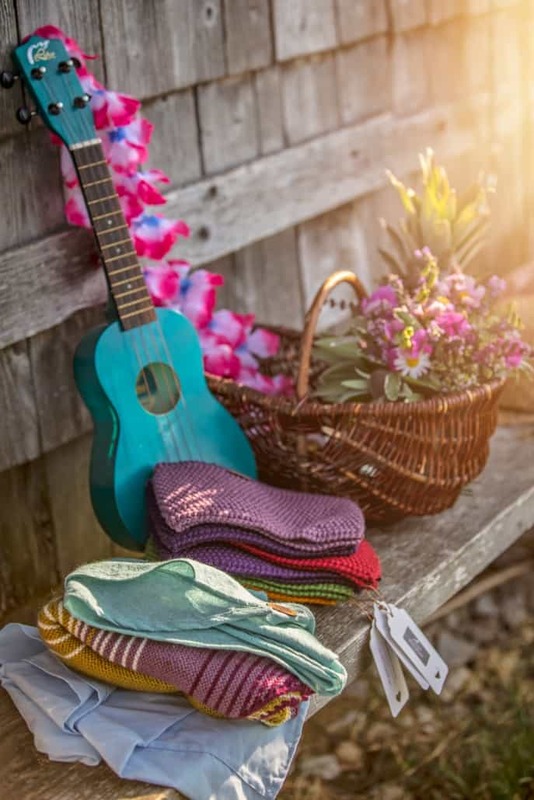 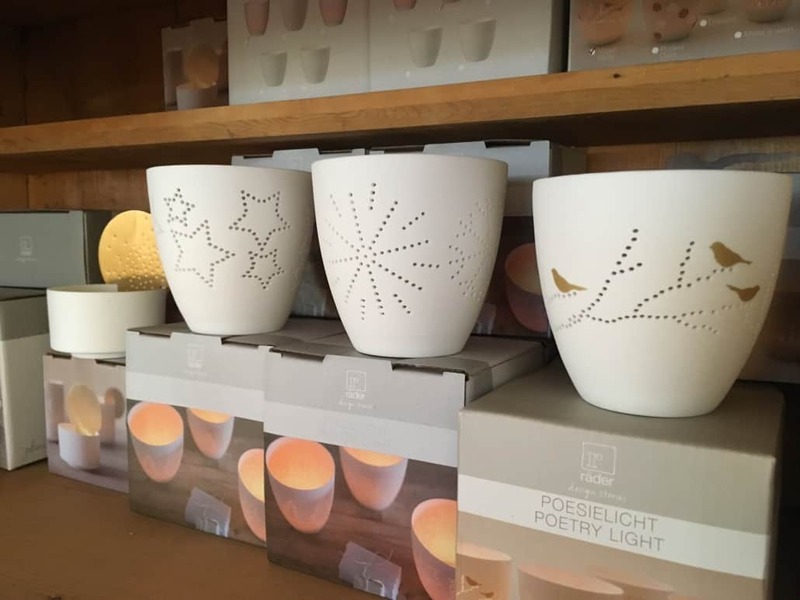 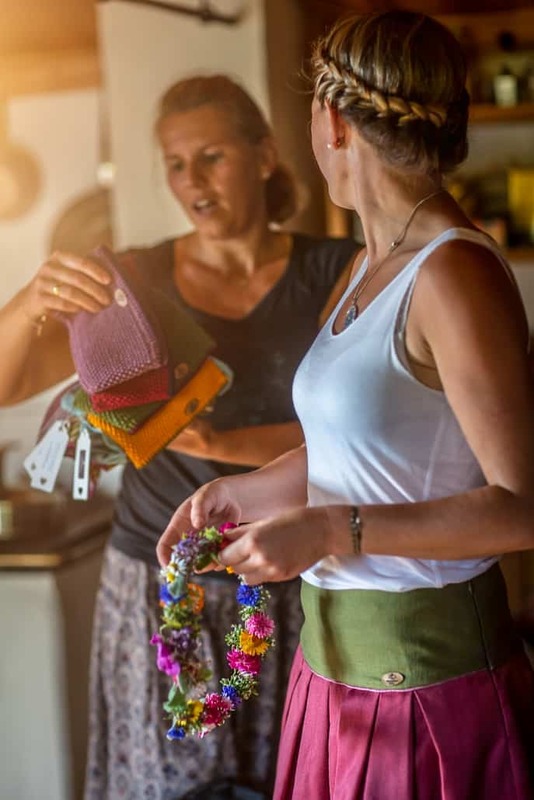 I have been a true fan of the many beautiful handmade products that Corinna Hofmann is selling through her company, Gipfelgwand Schliersee, for a couple years. 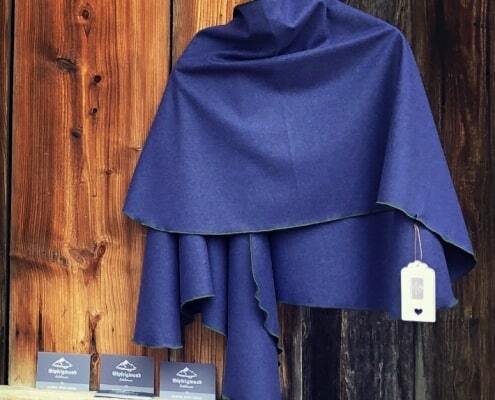 So, imagine my surprise when she approached me to help her bring her vision for her latest collection to light. 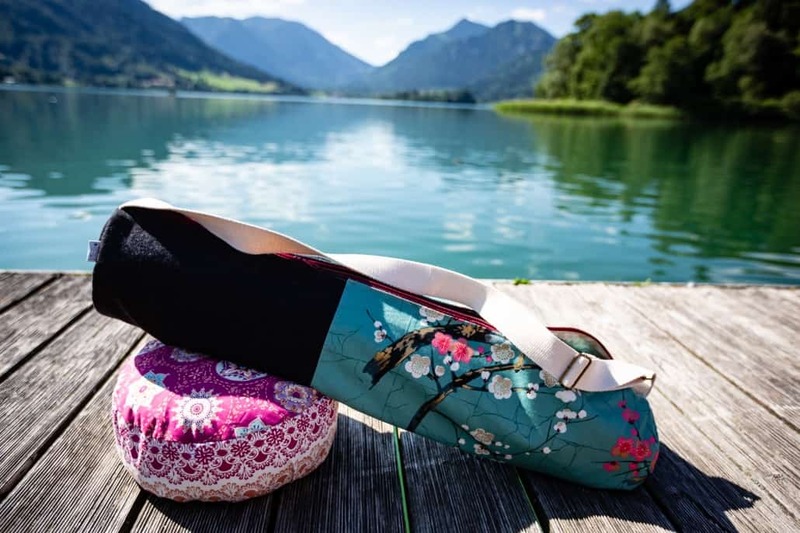 Aloha Schliersee is inspired by sunny summer’s days spent at the local Strandbad, the cool tranquil turquoise waters of our lake as well as the flowing landscape. 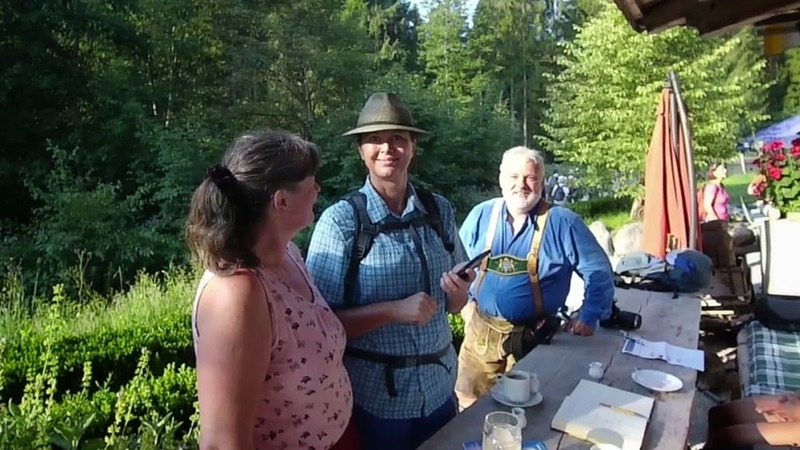 When I met Corinna she explained to me that Gipfelgwand was a dream 10 years in the making. 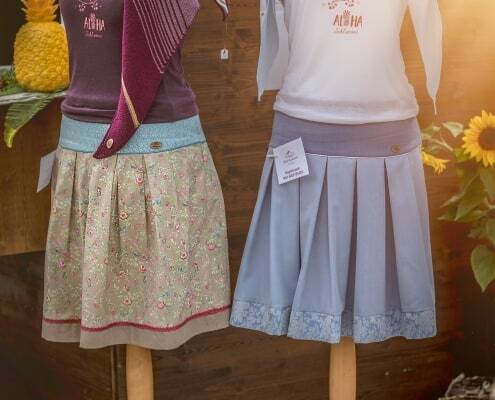 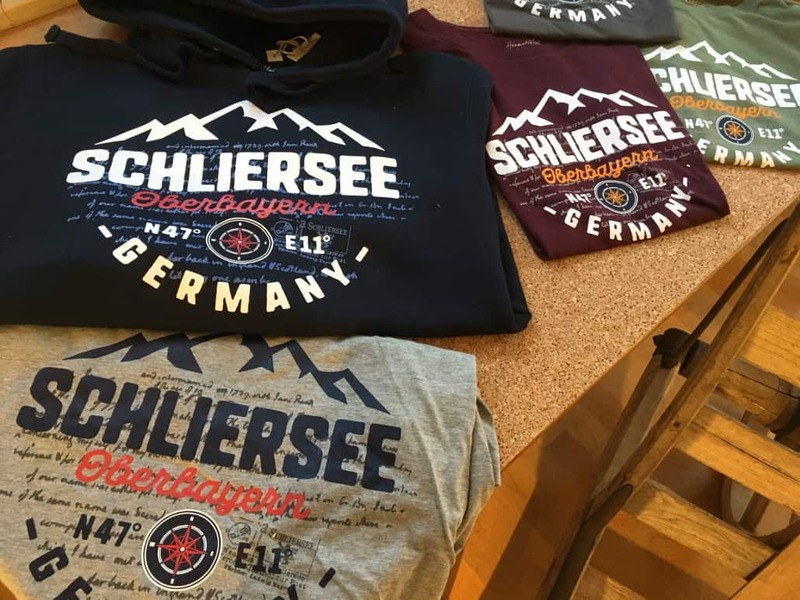 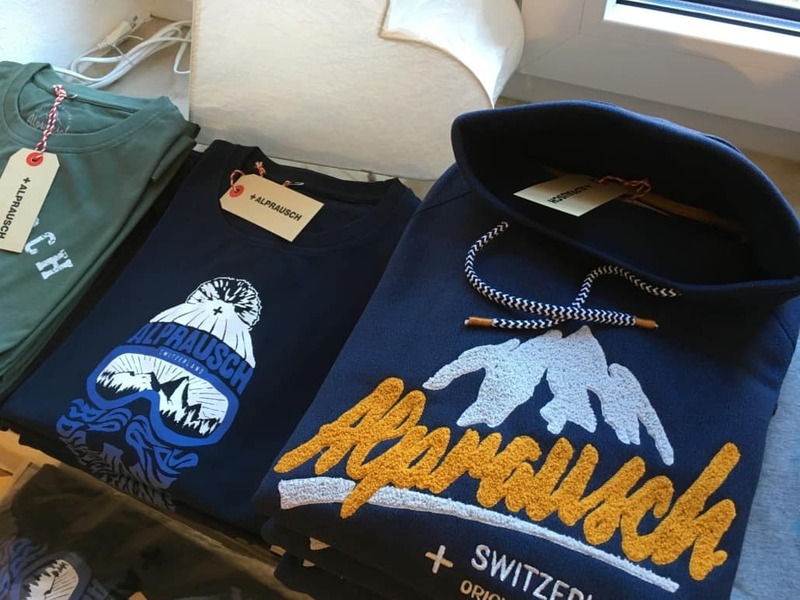 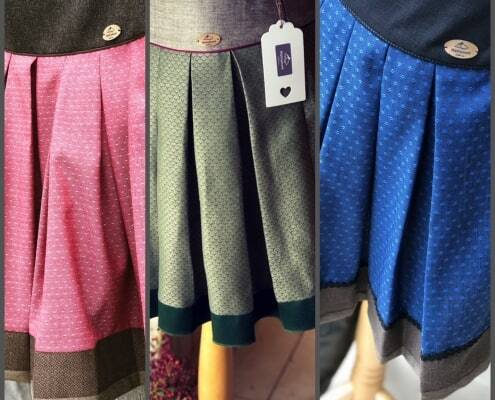 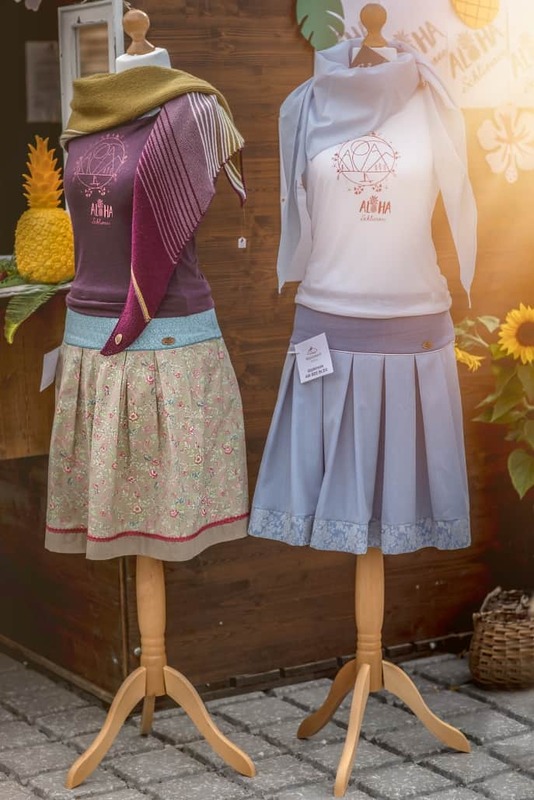 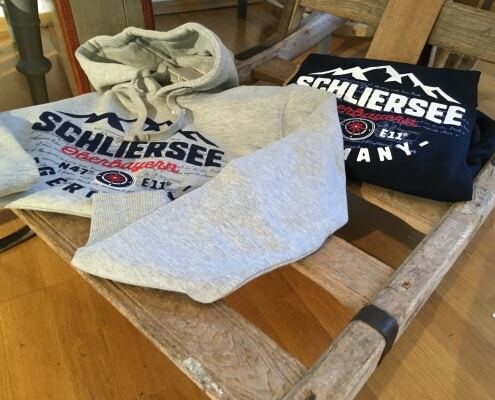 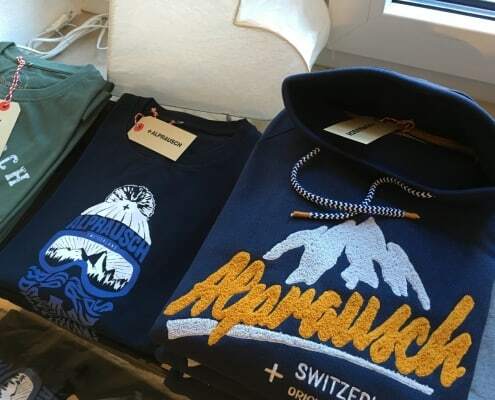 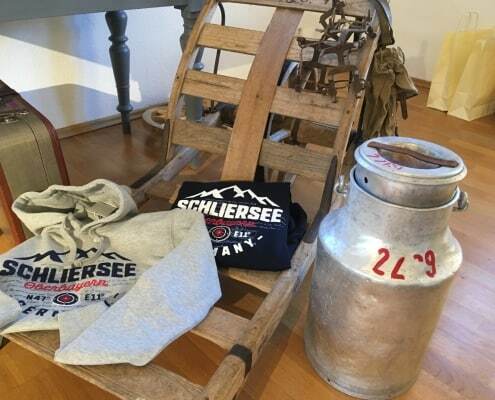 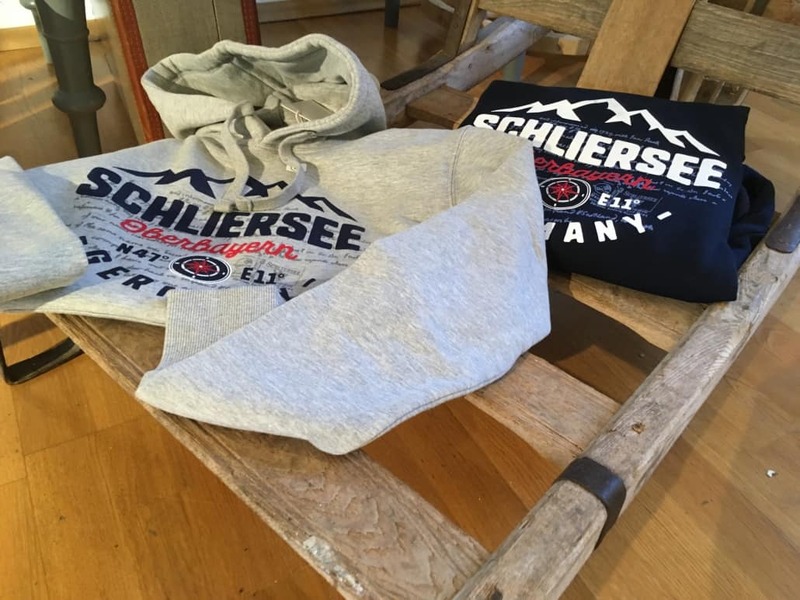 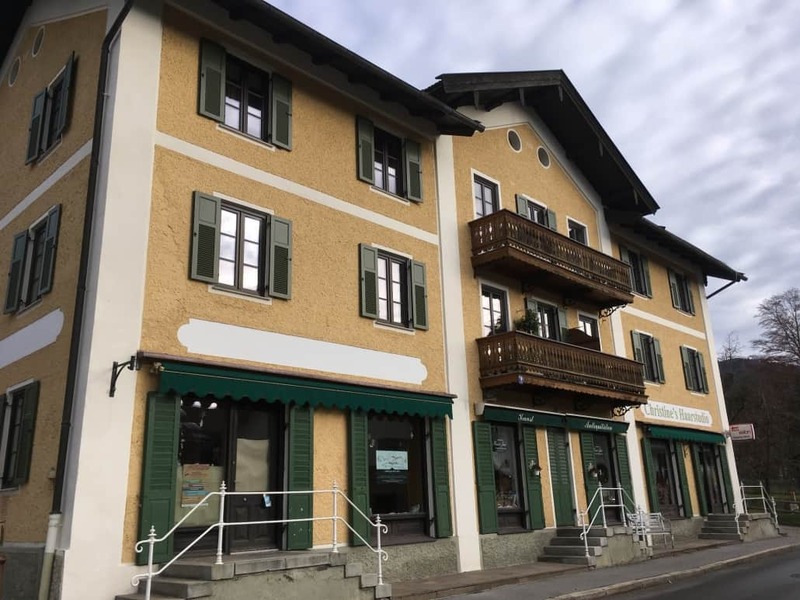 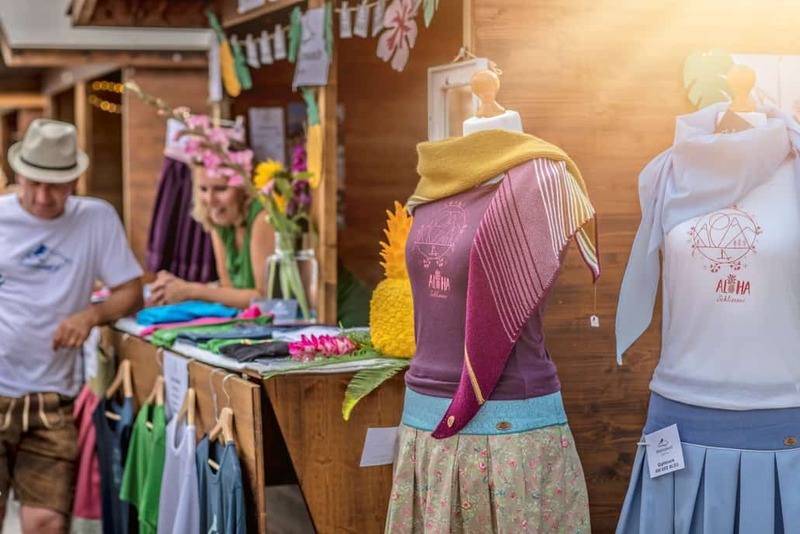 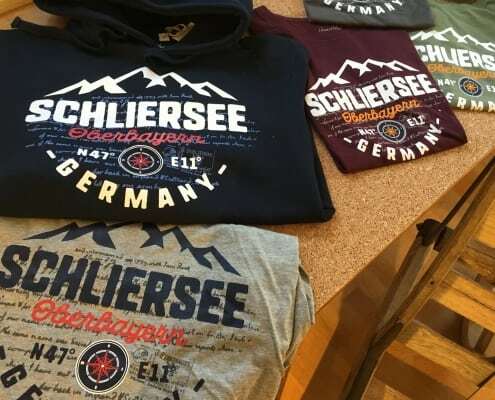 Aloha Schliersee breathes new life into the traditional styling and clothing of this area. 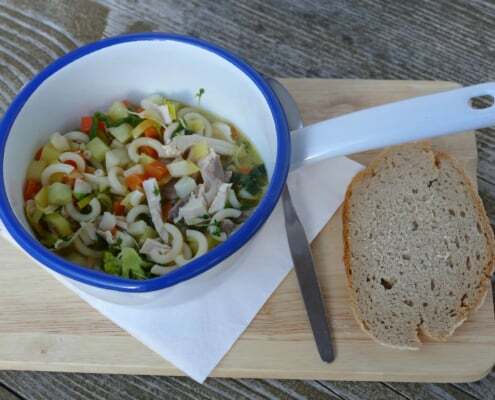 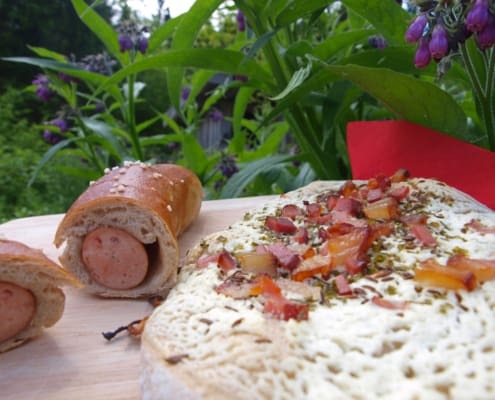 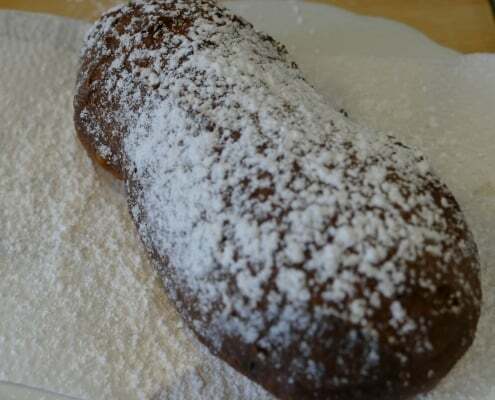 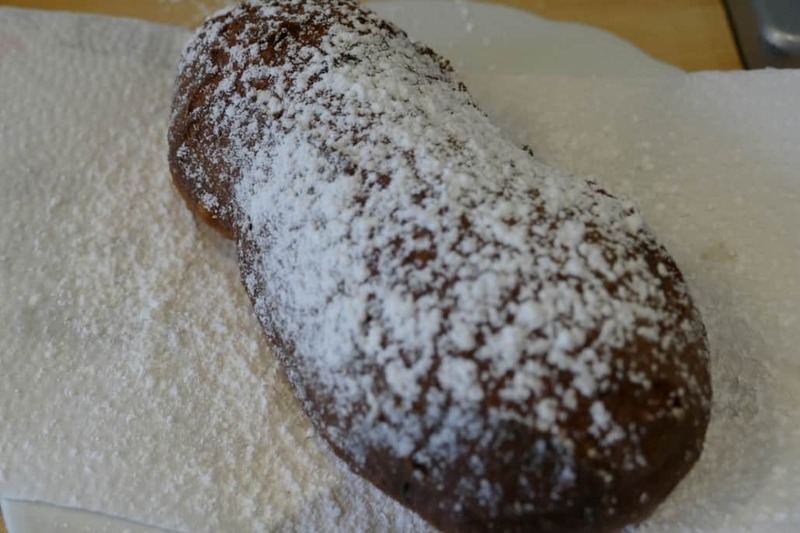 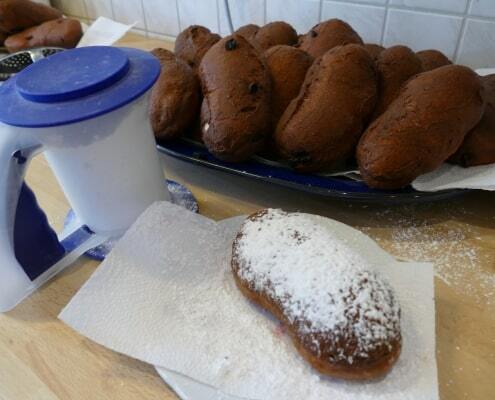 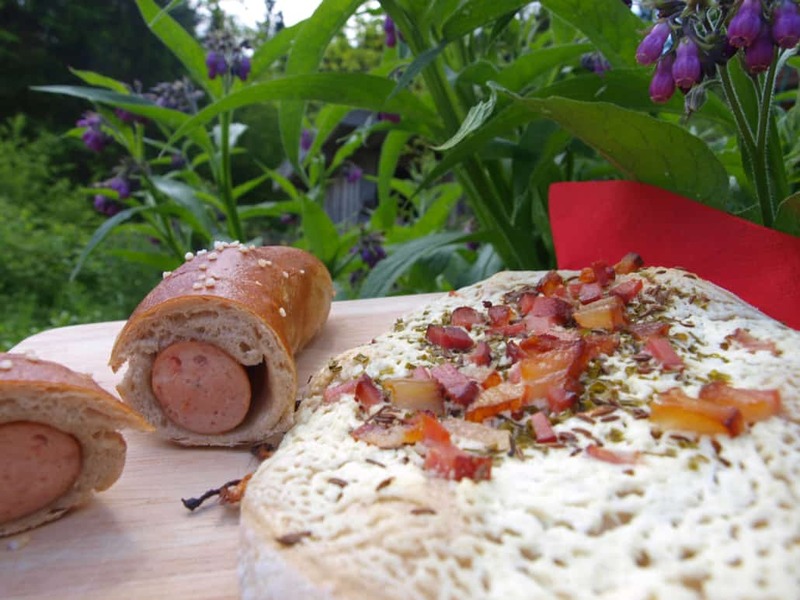 It is a fun and funky, Bavarian Bohemian Treat. 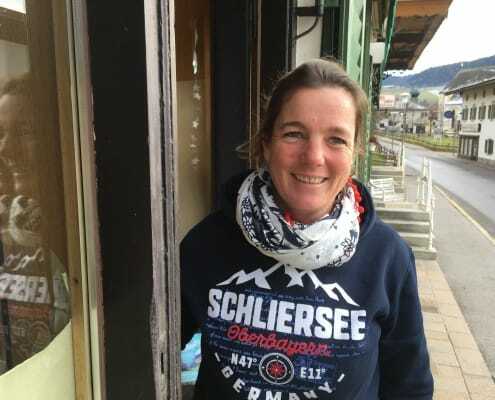 Corinna came from the Bodensee area about 3 years ago and she brings a sort of German version of the California surfer girl feel to the designs. 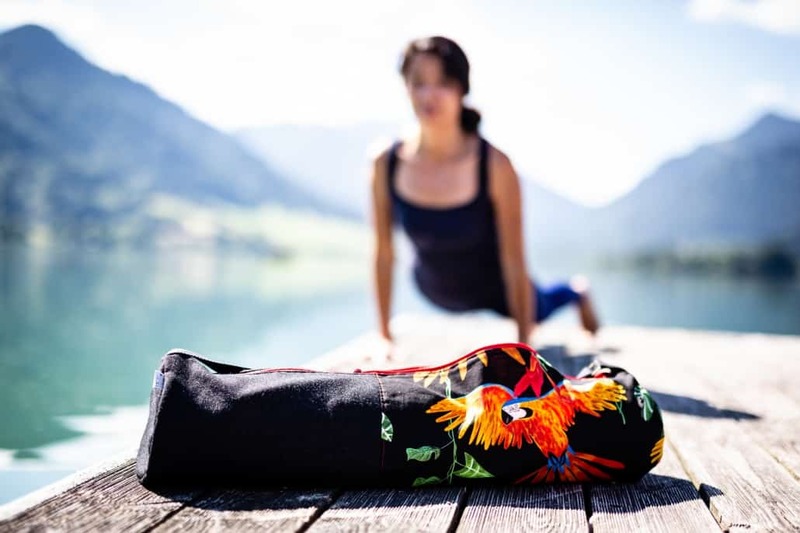 Yoga, Stand Up Paddle and the outdoors all blended together in a powerful yet feminine charm. 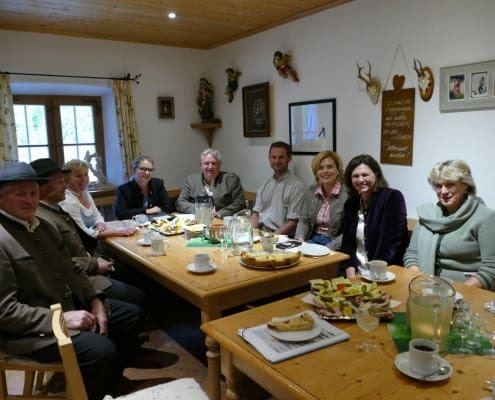 Last Friday afternoon, we met at Hennererhof in the Westenhofen district of Schliersee. 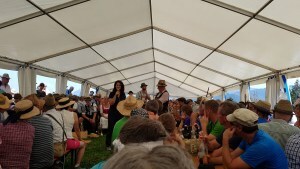 This was the culmination of a lot of networking and friend making. 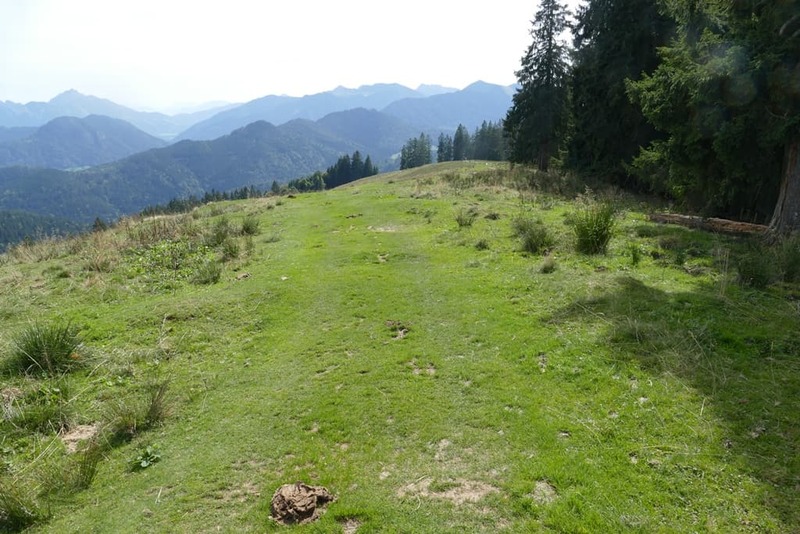 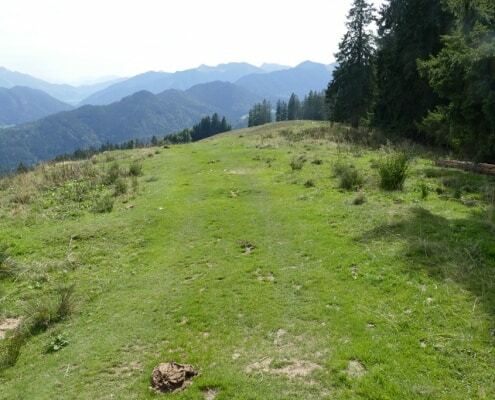 As a small group we embarked upon the steep journey up a path that was nothing more than a deer trail to the famous Baumgartenschneid. 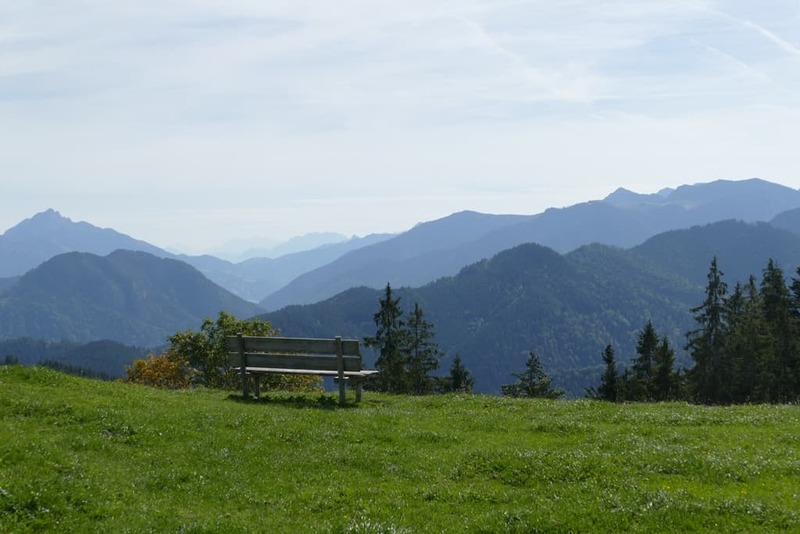 This location is truly magnificent and very much worth schlepping up camera gear and props to obtain the view. 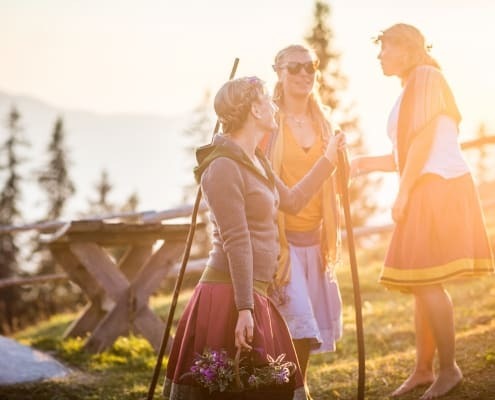 Waiting for us at the tipity top was a troop of mountain goddesses. 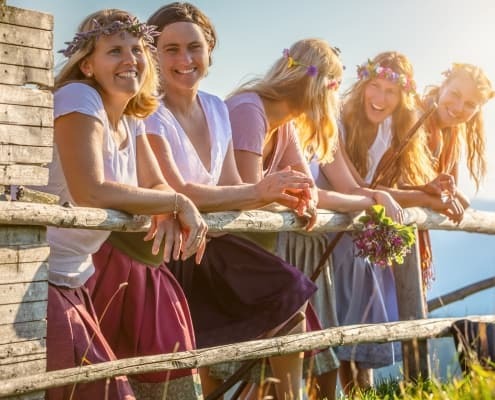 There really is no other way to describe the collection of woman gathered for this shoot. 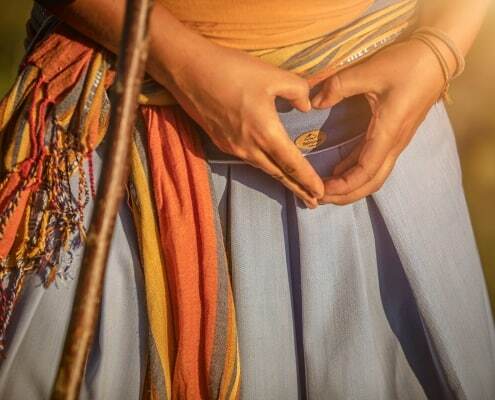 Each one bringing their own particular strength and beauty. 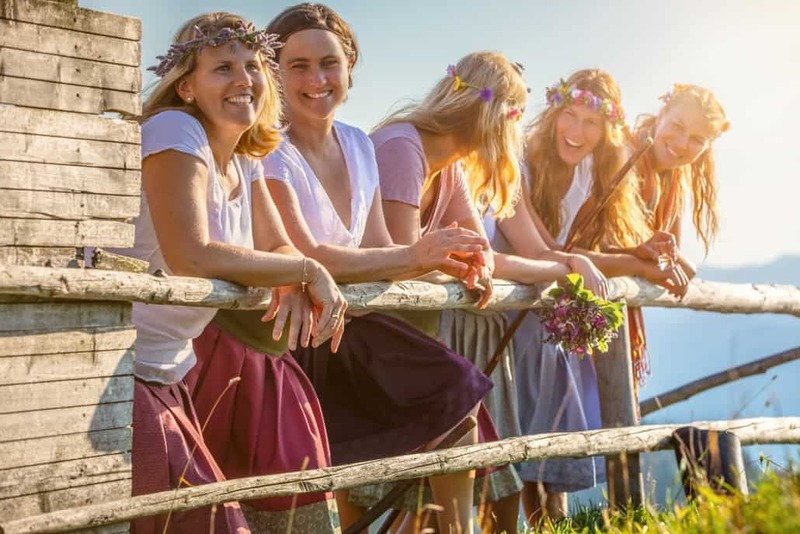 From Sports model and Bergwacht members to florist and Yoga instructors. 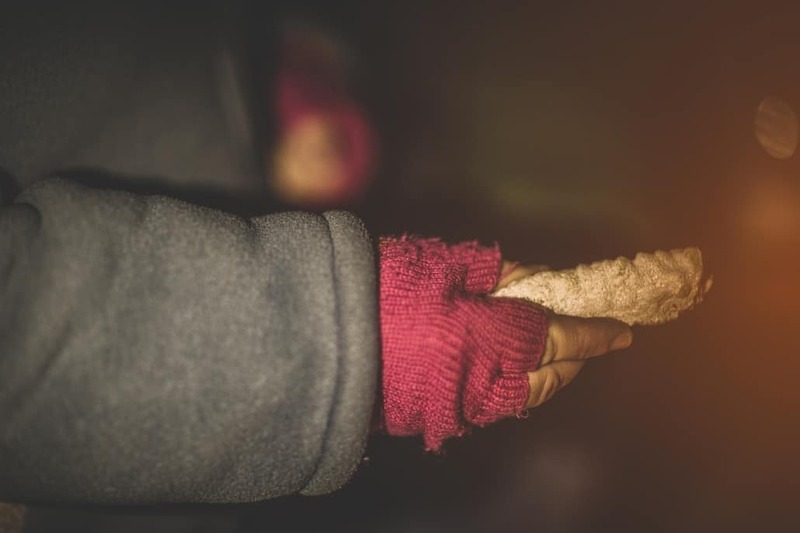 The power and the softness combined. 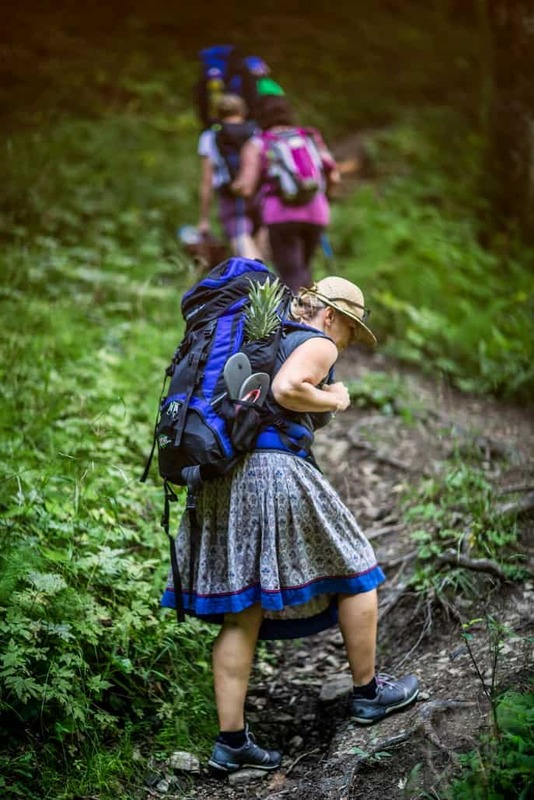 Pure inspiration and we were blessed to have such a company of women. 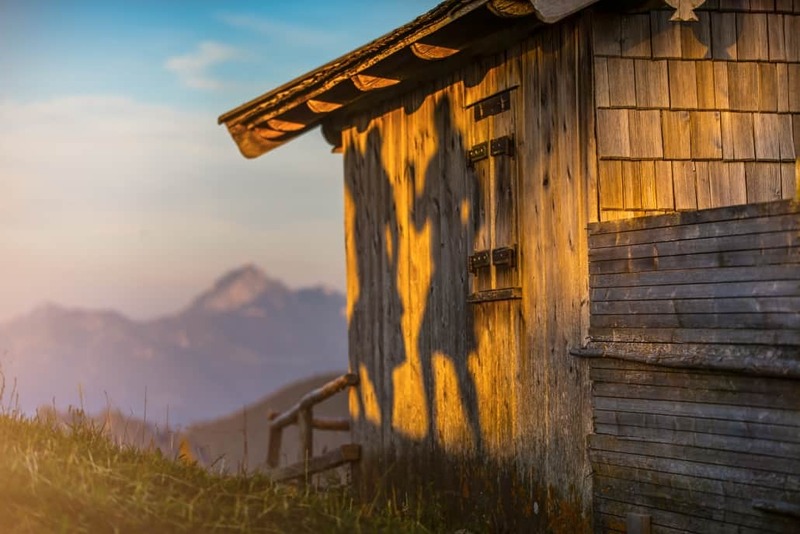 Working quickly so as not to loose a moment of the magnificent light we quickly shared our vision for the shoot and prepared the simple, natural styling. 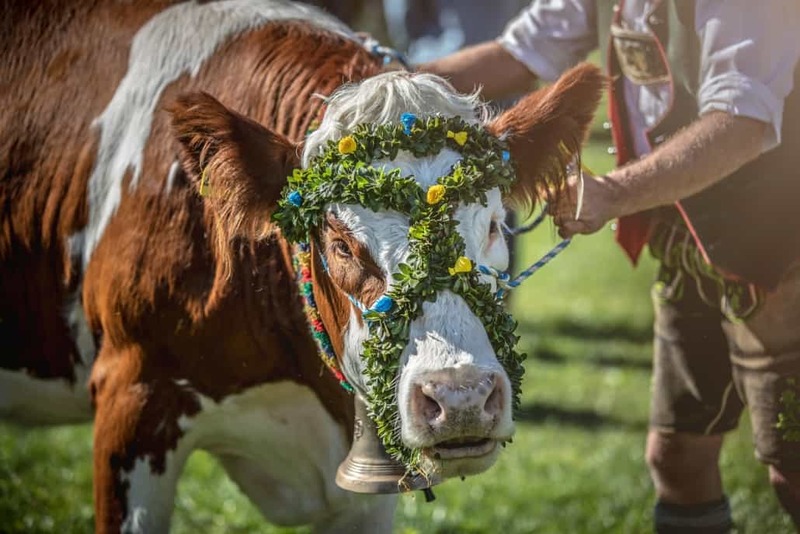 Flowers were festooned in braided hair and the iconic Gipfelrock were presented to many smiling faces. 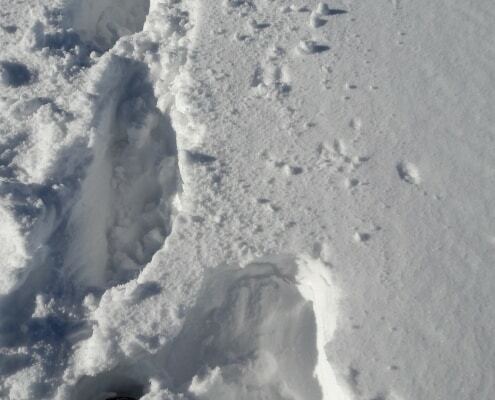 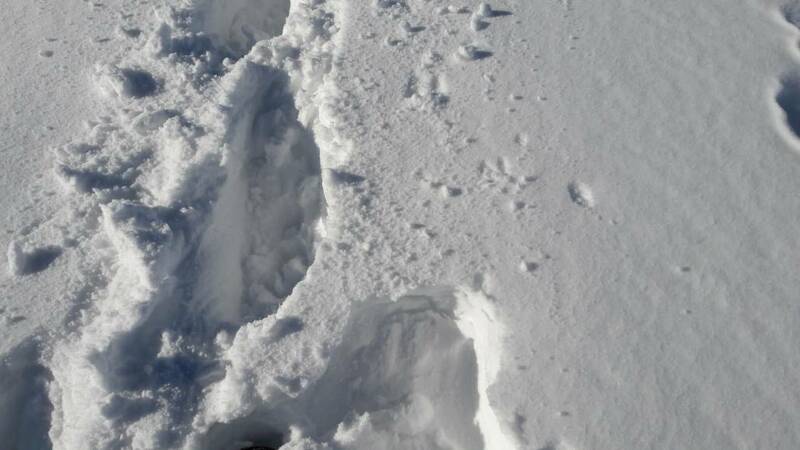 Shoes were optional and quickly forgotten. 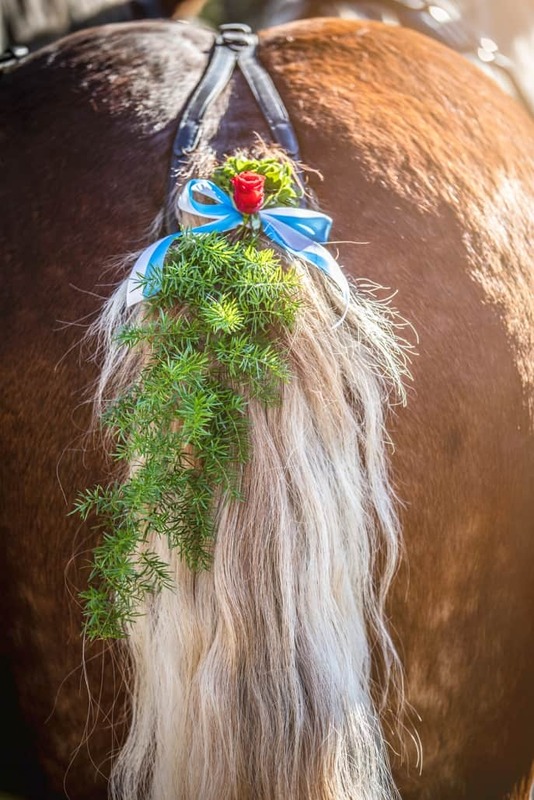 This was the culmination of Corinna’s vision and planning. 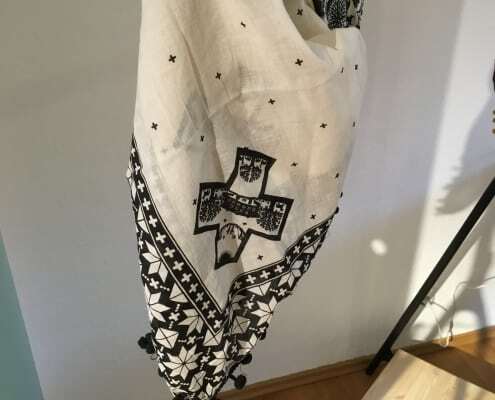 The even was a designers dream. 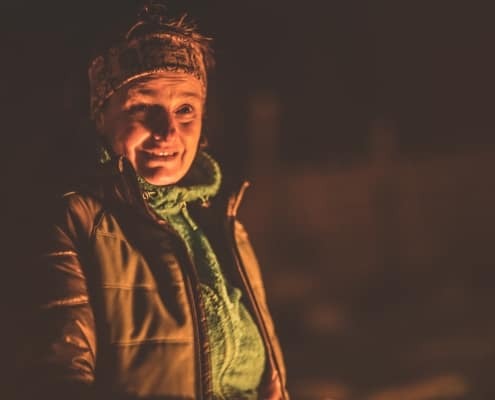 It was pretty special to this photographer as well. 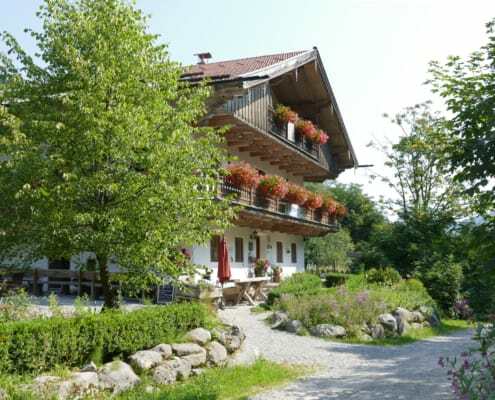 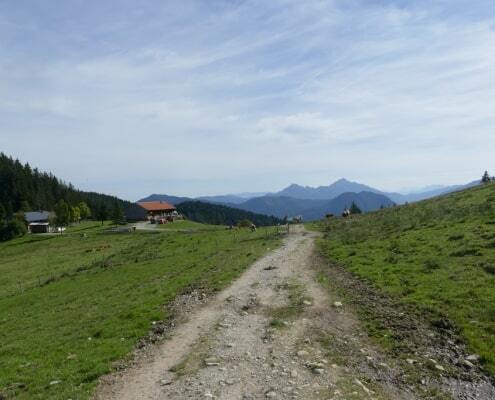 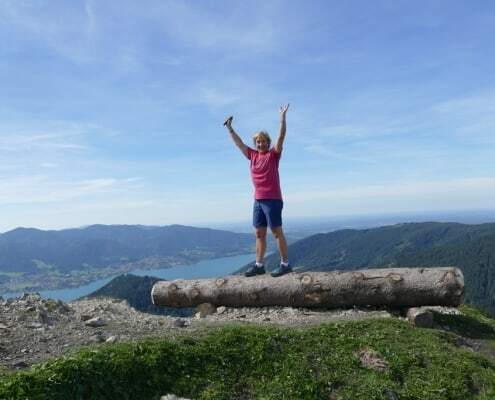 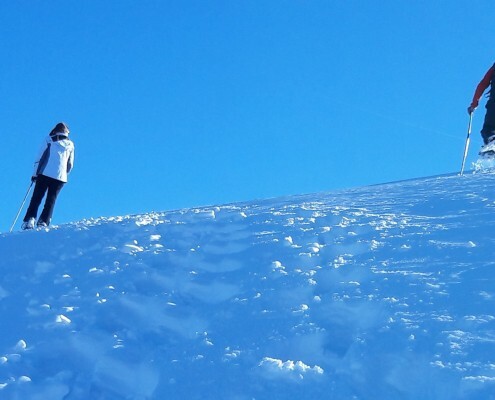 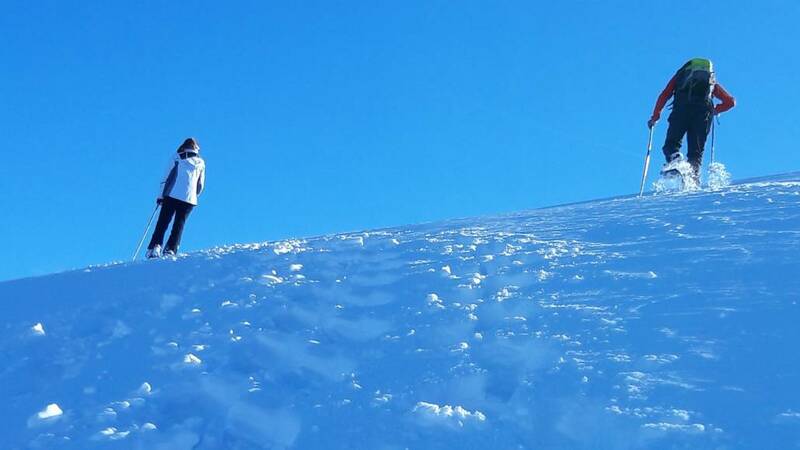 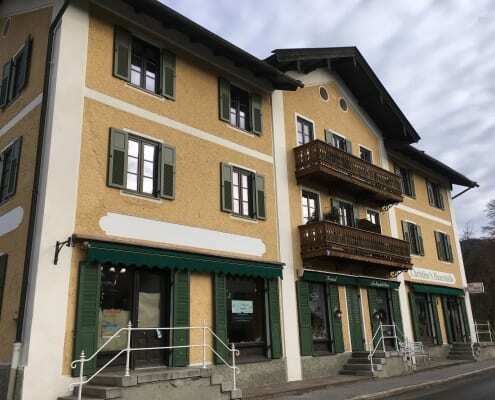 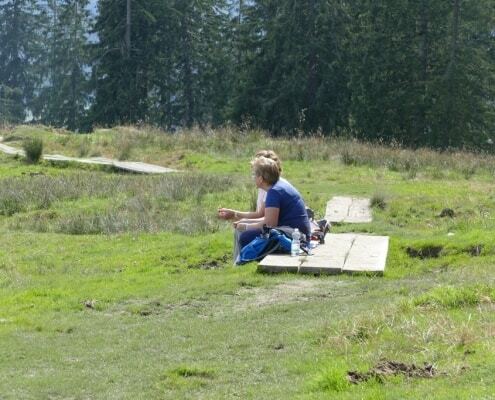 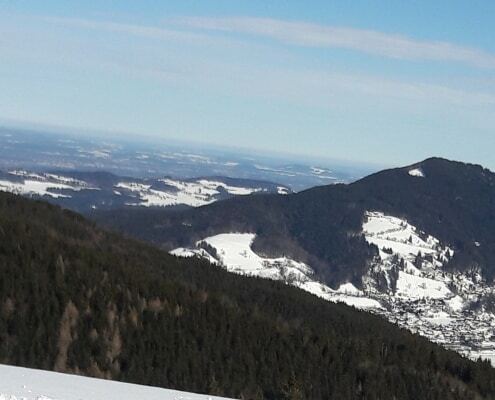 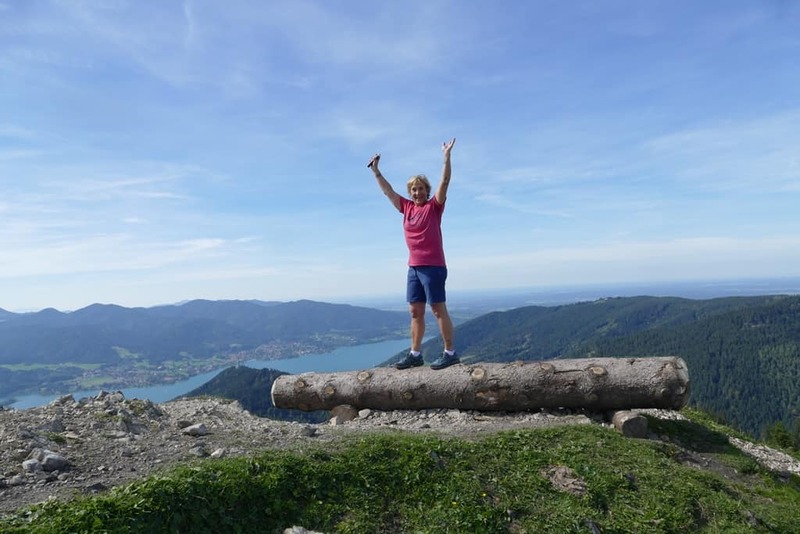 It is incredible what she has been able to achieve in such a short time living in Schliersee. 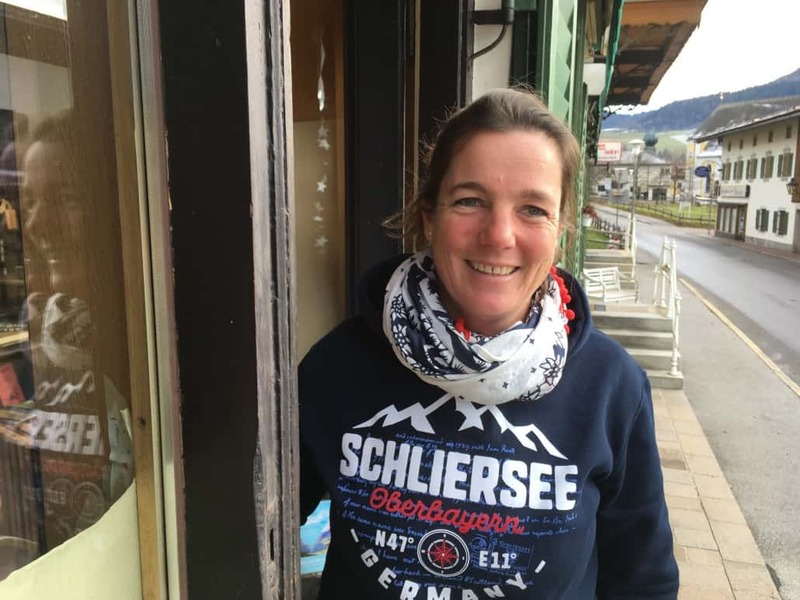 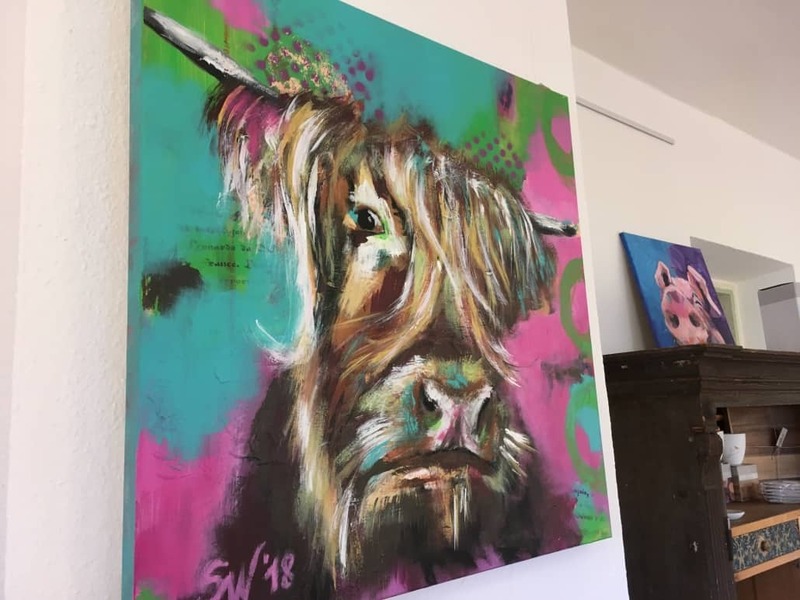 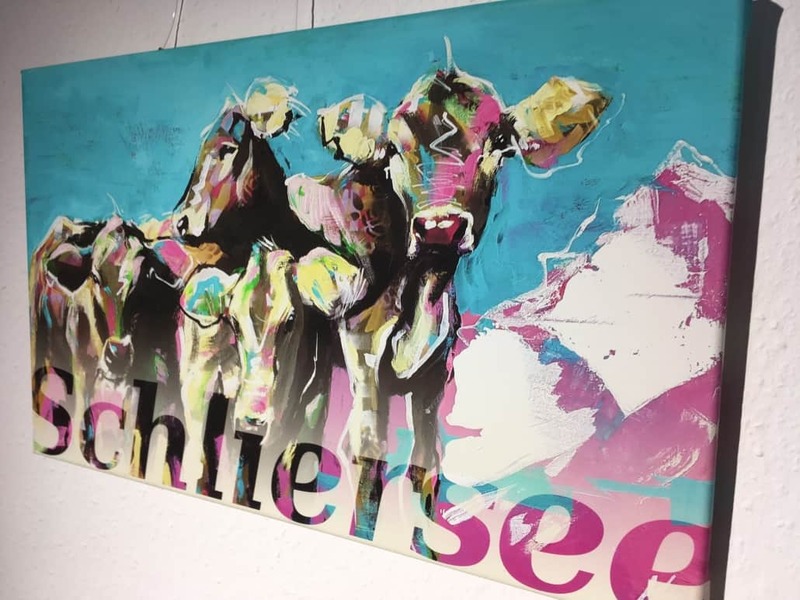 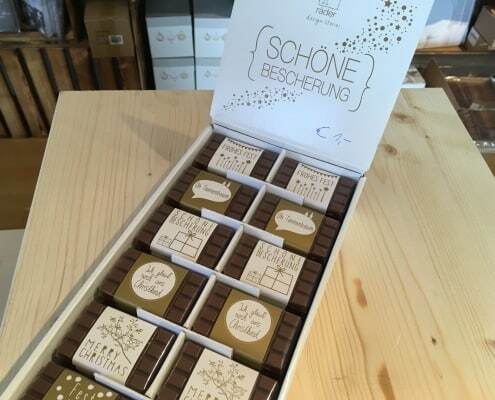 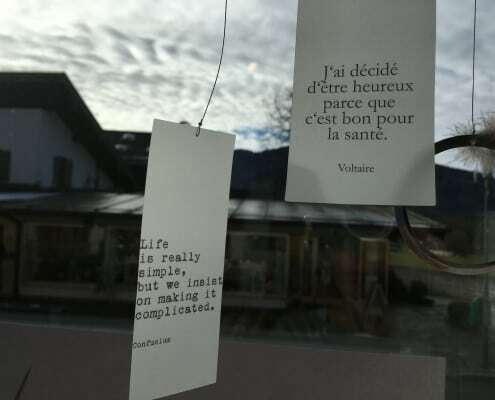 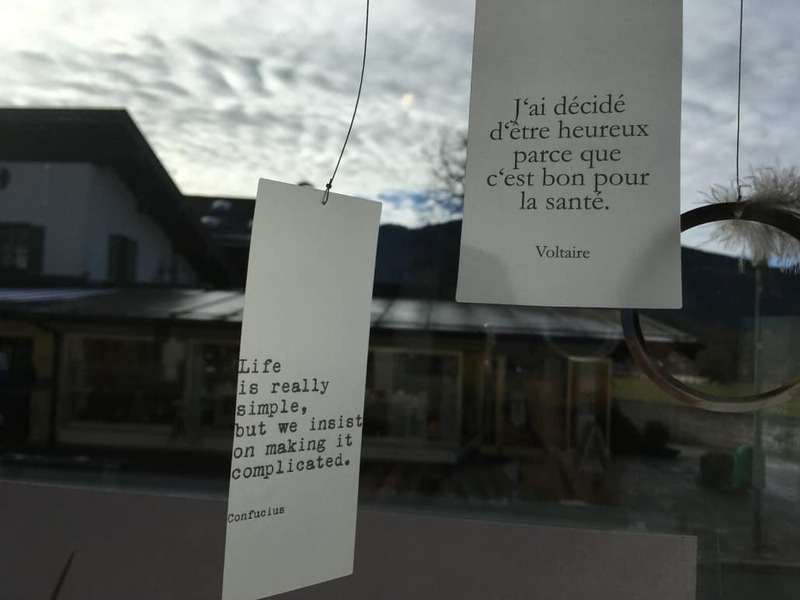 I was so impressed by the support and encouragement she has received from other female entrepreneurs in and around Schliersee. 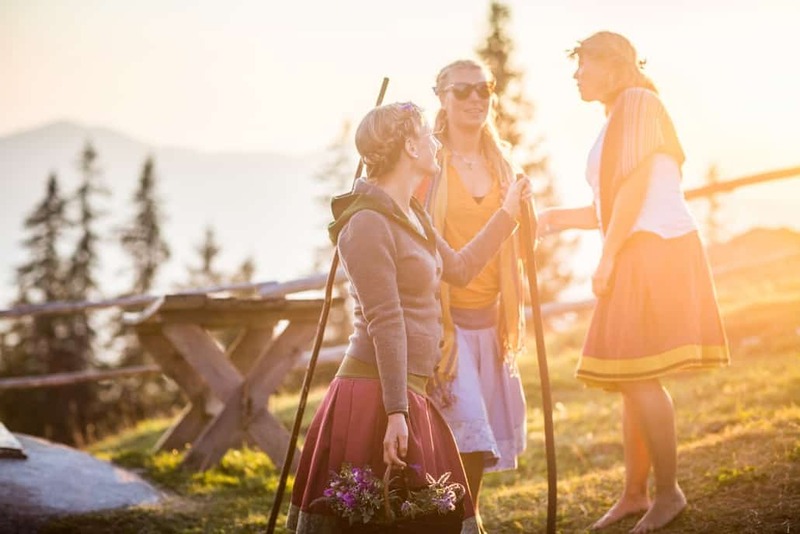 Powerful and empowered creative women all coming together to bring to life another woman’s vision was absolutely inspiring. 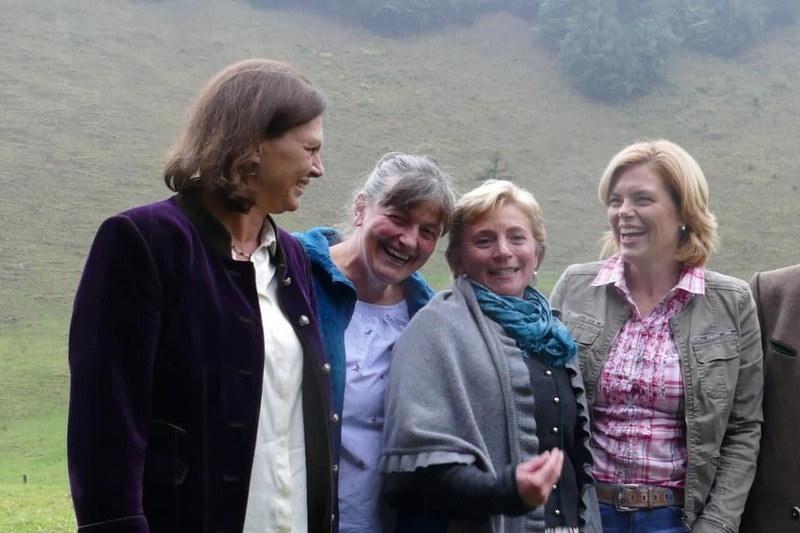 The women in these photos have all met through the Female Mountain Power Summit and their names are, Sabrina Tamara Regina Steinberger Irmi Baumann Miriam Stannecker Anna-Maria Wimmer. 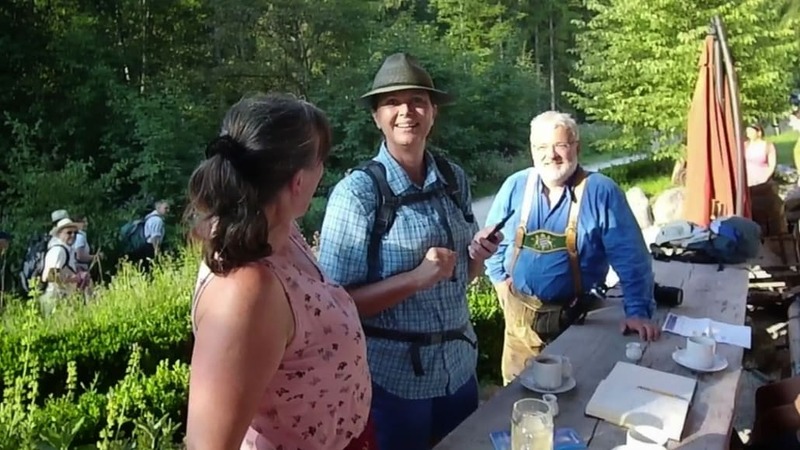 Die Hauptalmbegehung hat eine bereits 70-jährige Geschichte und fand dieses Jahr das zweite Mal im Gemeindegebiet Schliersee statt. 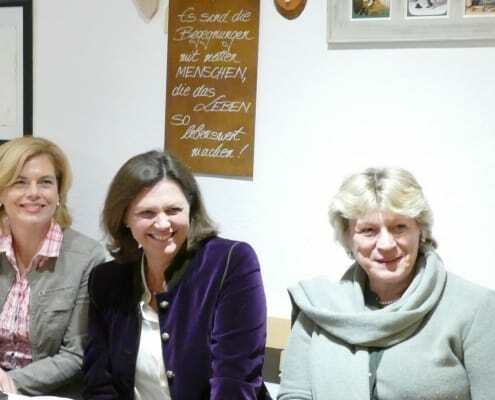 Zuletzt 1979 im Rotwandgebiet. 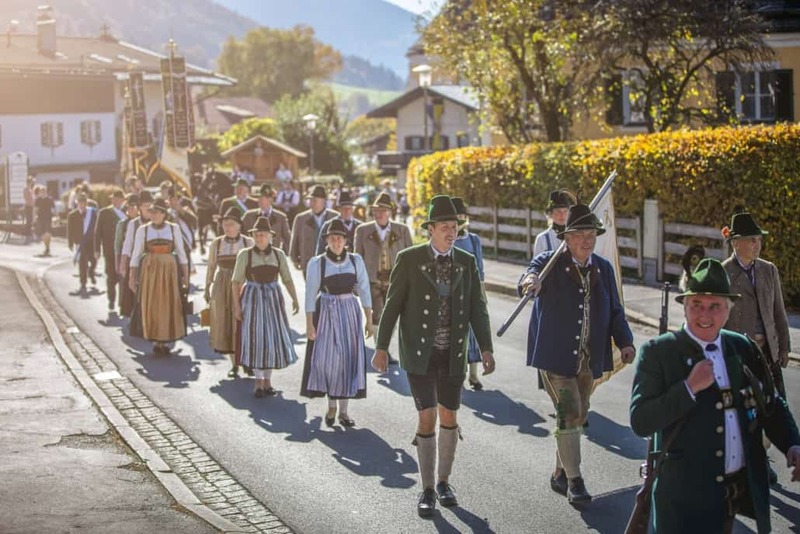 Im Gemeindegebiet Schliersee liegen 27 Almen, von denen dieses Jahr vier besucht wurden. 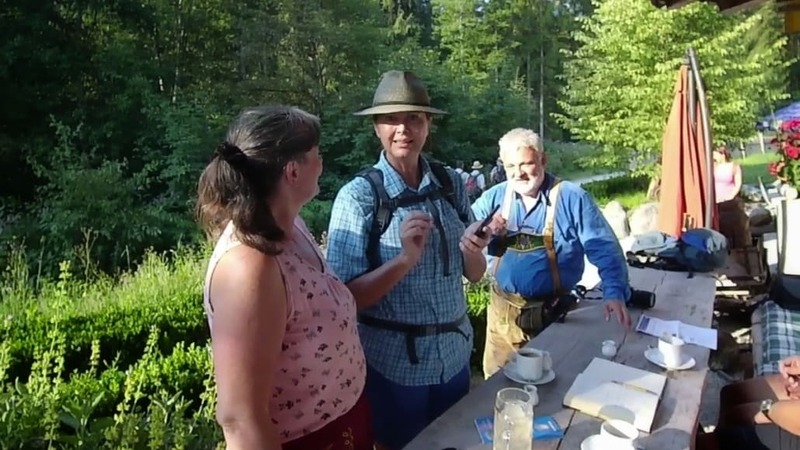 Bei schönstem Sommerwetter wanderten ca. 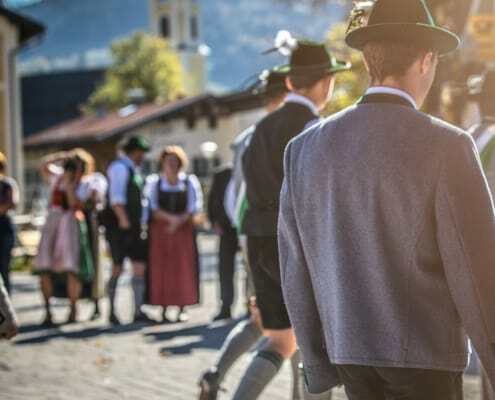 850 bayerische Almbauern und Almbäuerinnen, Almpersonal und Freunde der Almwirtschaften die ca. 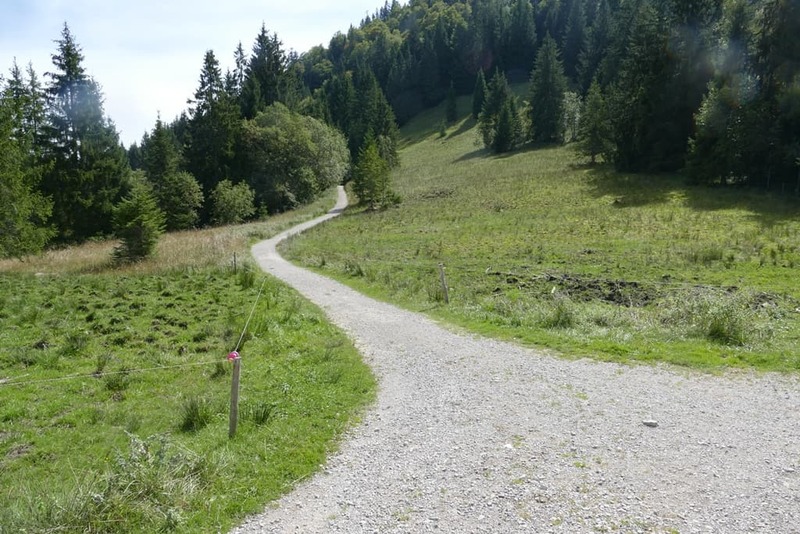 11 km lange Runde. 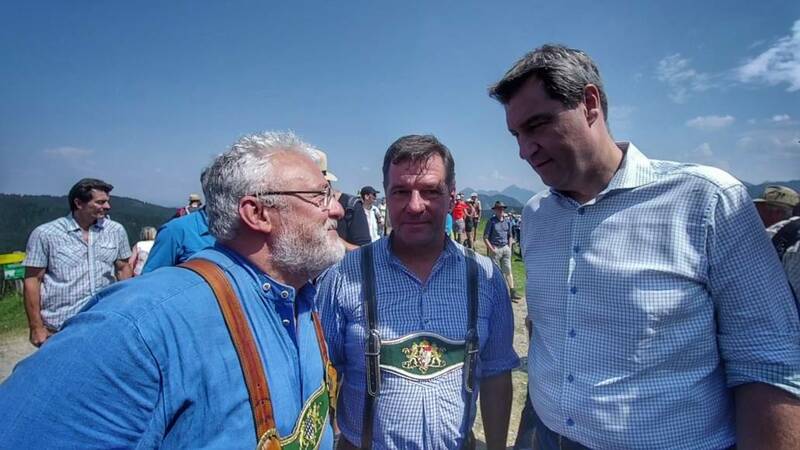 Unter den Wanderern waren auch einige Minister der Bayerischen Staatsregierung und Landräte vertreten. 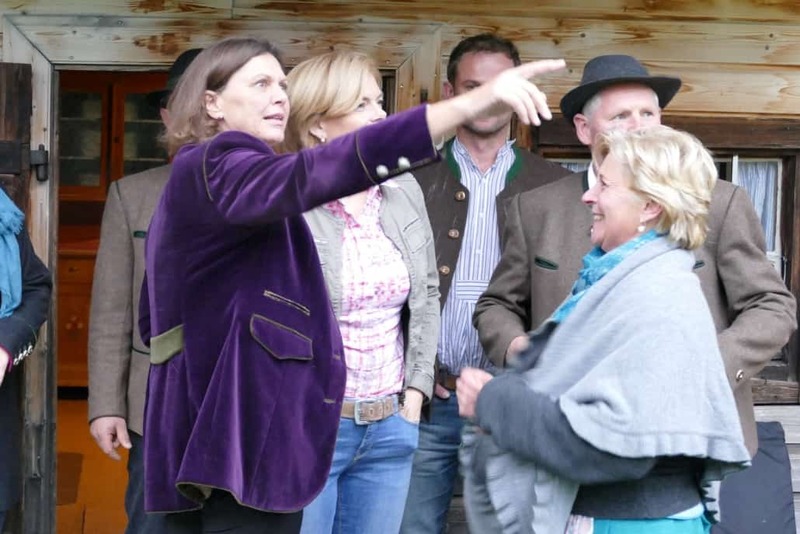 Geparkt und gestartet wurde beim Hennerer, wo sich zur großen Freude von Angelika Prem (Hennererhof) Ilse Aigner ins Gästebuch eingetragen hat. 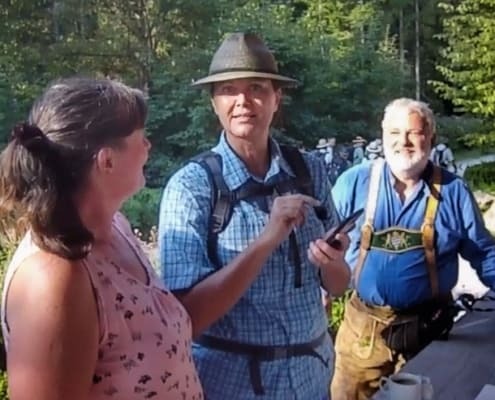 Nach knapp einer Stunde Gehzeit versammelten sich alle um 9:00 Uhr zur Begrüßung auf der Oberen Krainsbergalm. 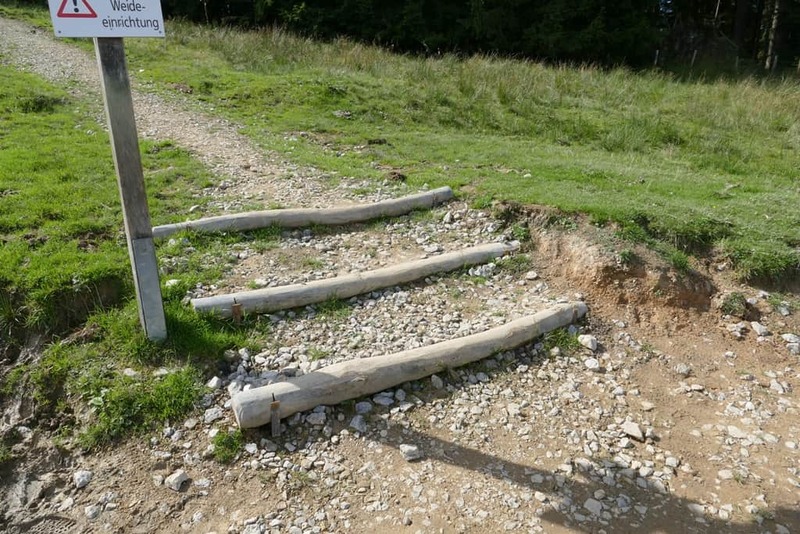 Kein Gastbetrieb! 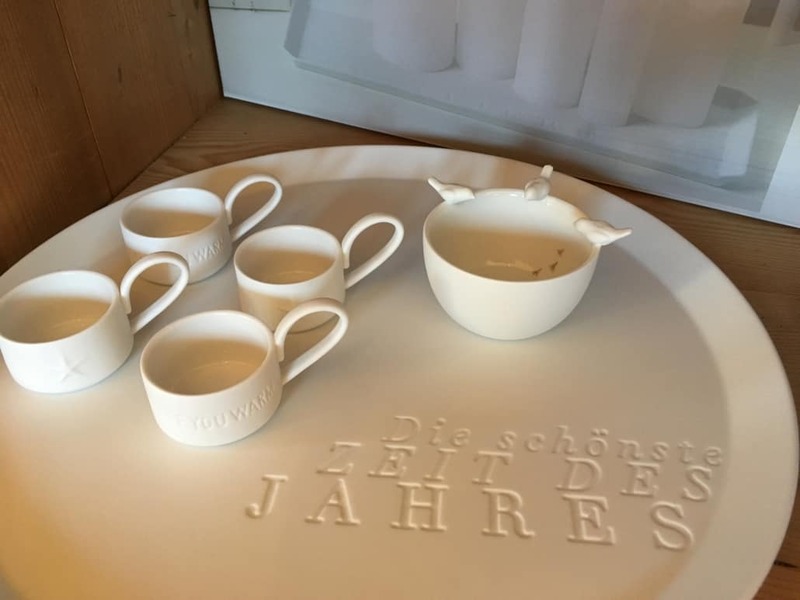 An diesem Tag war für ausreichend Verpflegung und Getränke gesorgt. 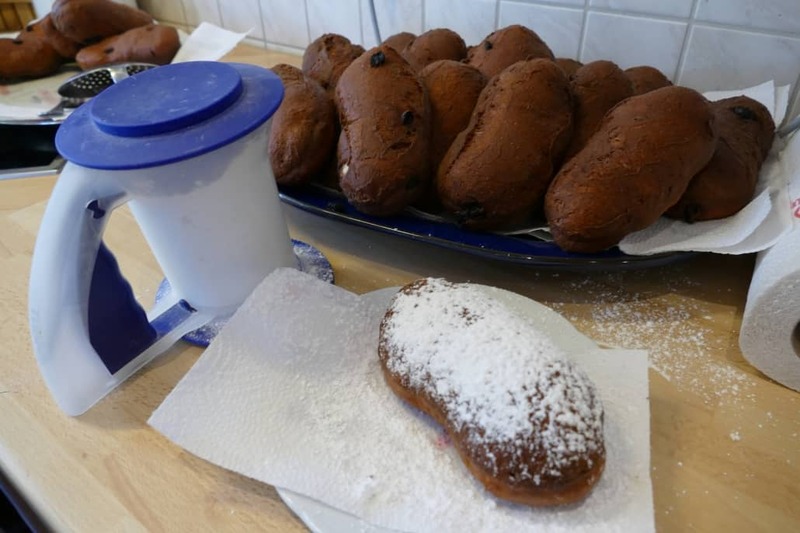 Die frisch gebackenen Kuchen, Strizl, Auszogenen und Nussecken waren hervorragend. 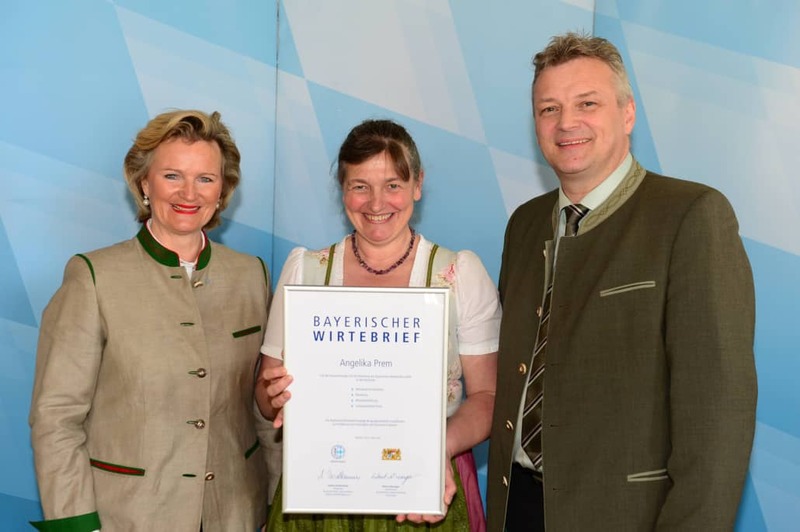 Georg Mair, der Vorsitzenden des Almwirtschaftlichen Vereins Oberbayern (AVO), unser Schlierseer Bürgermeister Franz Schnitzenbaumer und Ilse Aigner begrüßen die zahlreichen Wanderer. 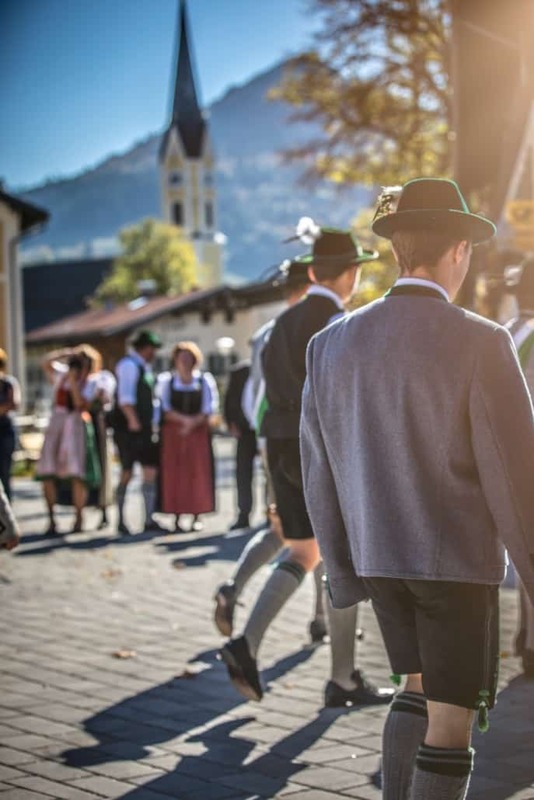 Im Anschluss stellten sich die Almbauern und ihre Almen, die umliegenden Almen, die Obere und Untere Krainsalm sowie die vordere und hintere Gschwandbachalm vor ‒ wie groß, wie viel Vieh und die Besonderheiten oder auch besonderen Schwierigkeiten während der Almzeit. 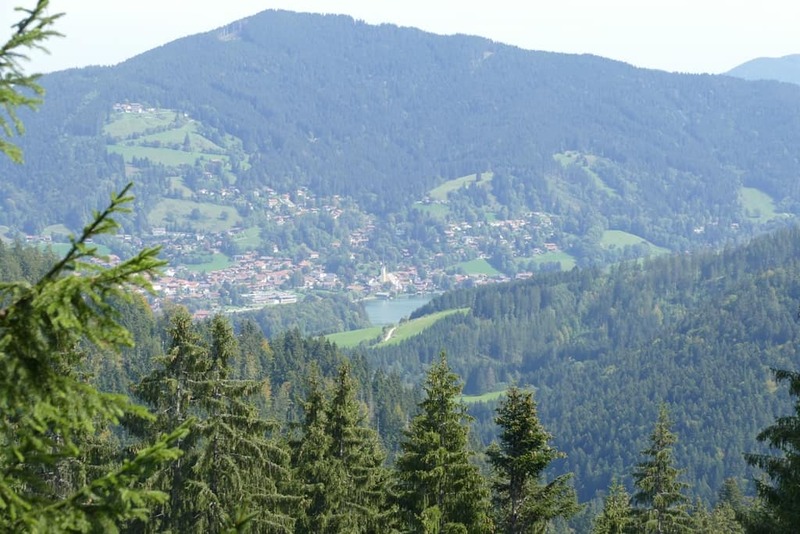 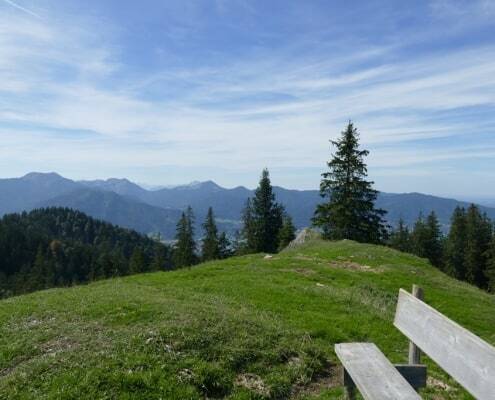 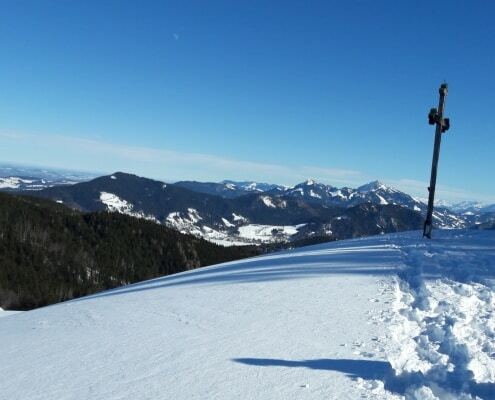 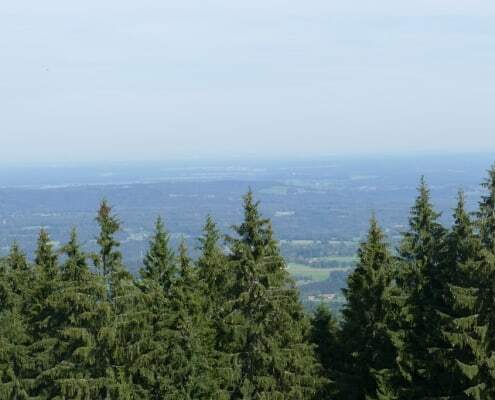 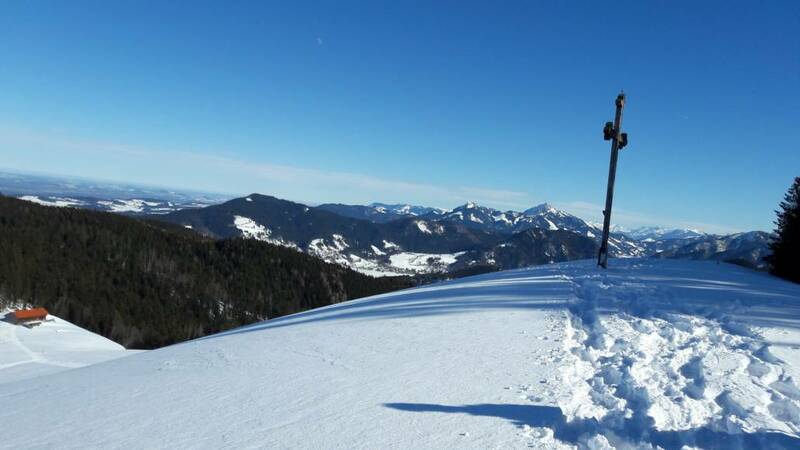 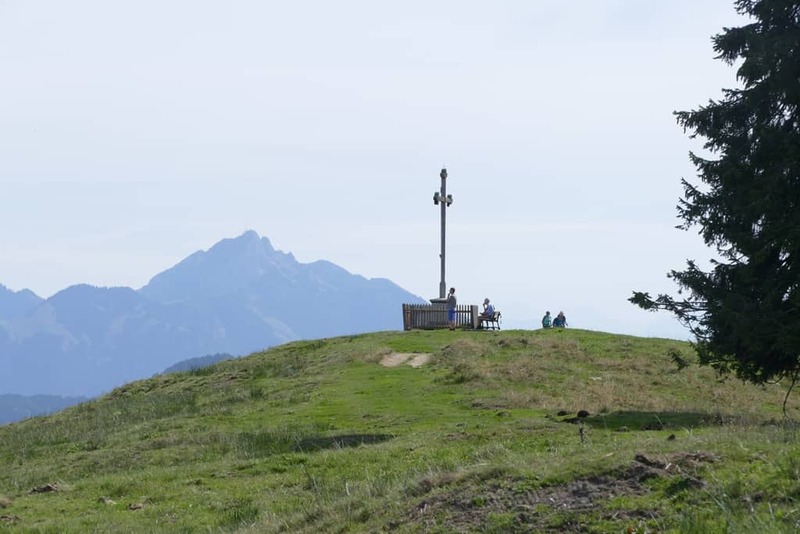 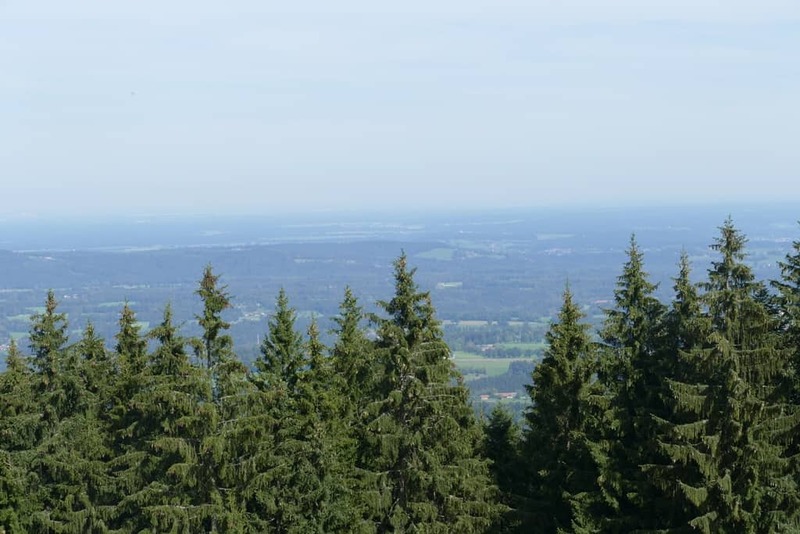 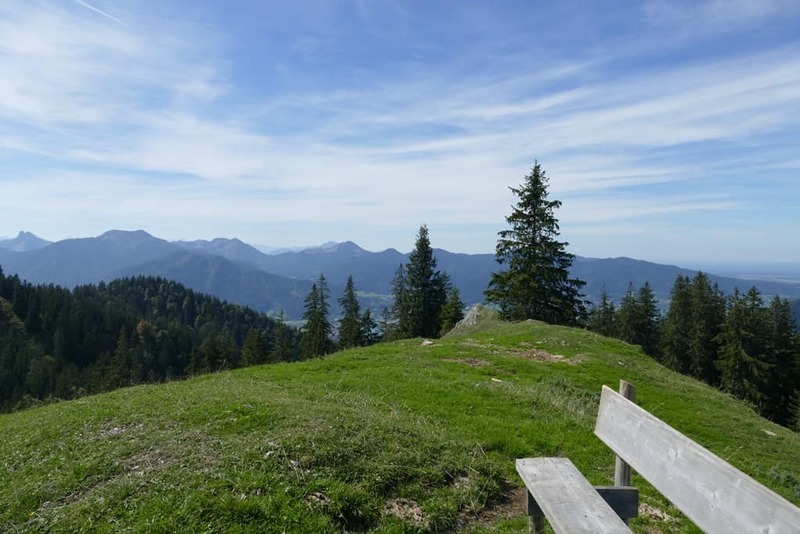 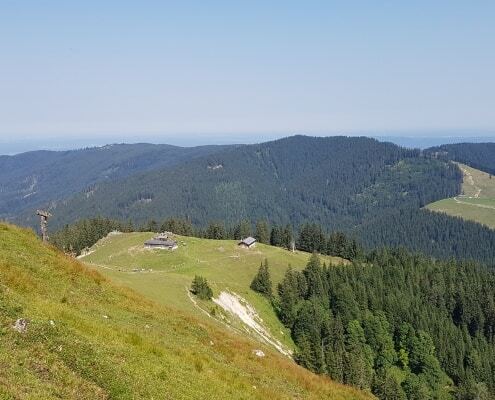 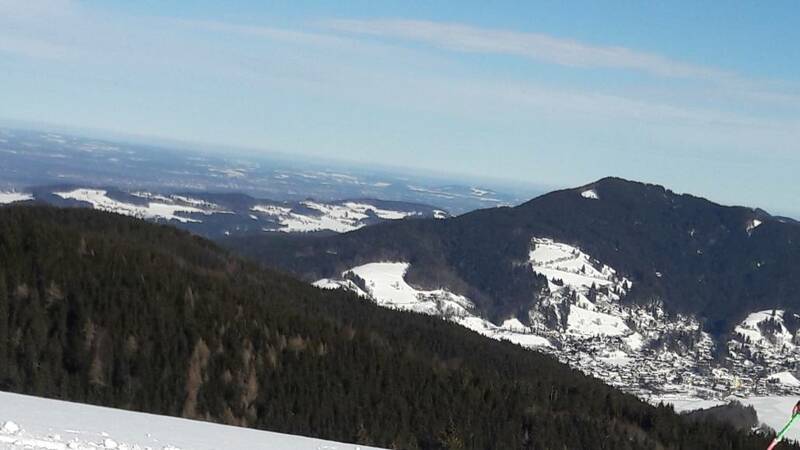 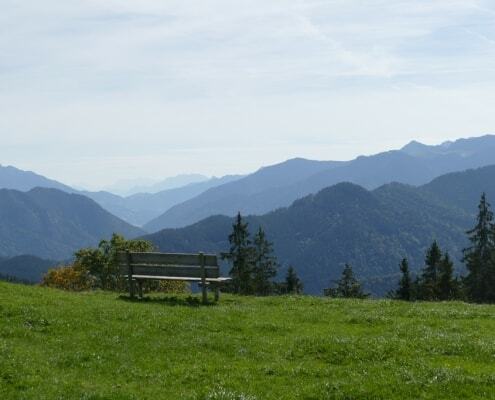 Weiter führte der Weg jetzt über einen schönen Wald- und Almsteig hinauf auf die Baumgartenschneid, den höchsten Punkt der Wanderung mit 1.444 m. Von hier haben wir eine tolle Aussicht auf den Tegernsee und den Schliersee. 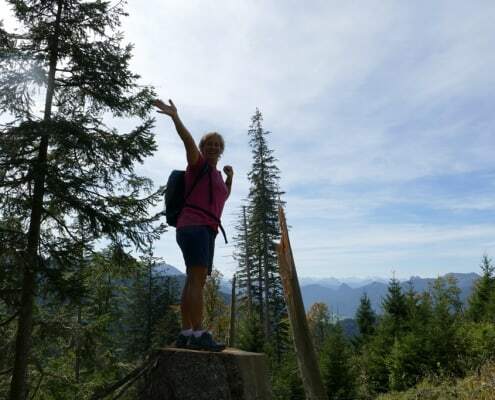 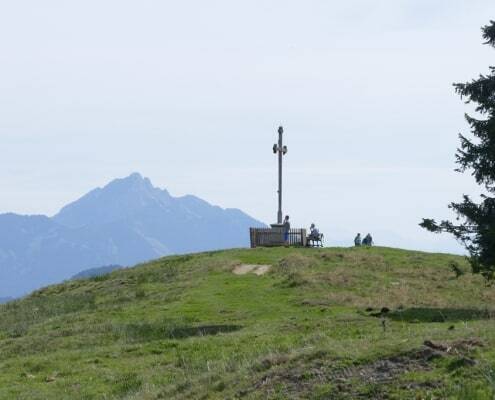 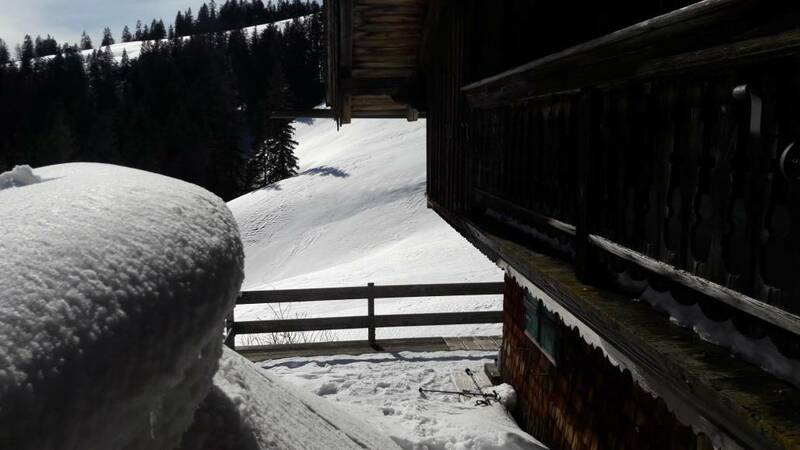 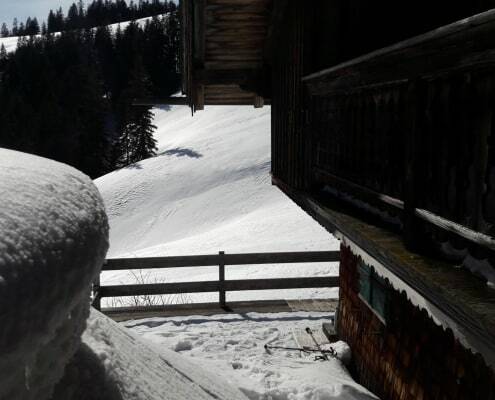 Etwas unterhalb des Gipfels liegt unser nächstes Ziel, die Baumgartenalm. 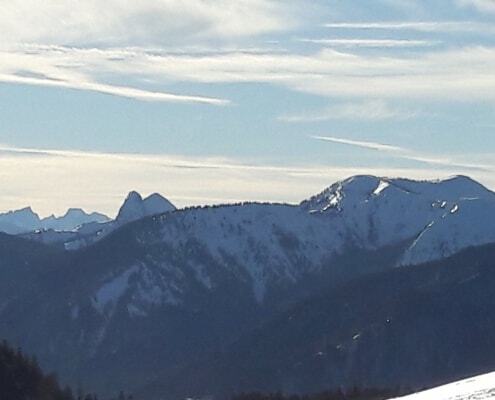 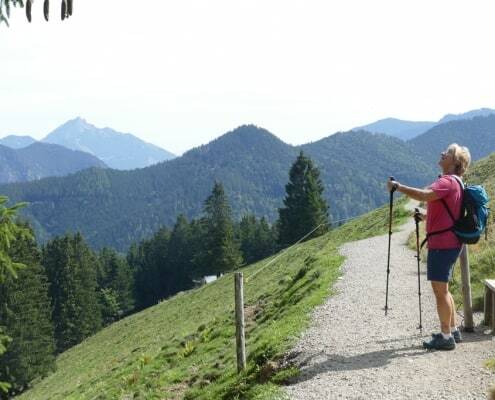 Josef Eham stellte sich, seine Familie und die Alm vor. 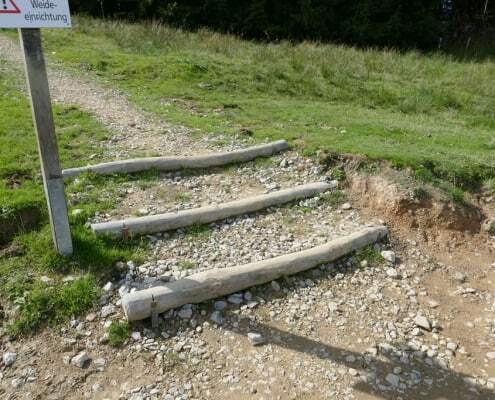 Diese Alm ist durch keinen Fahrweg erschlossen und muss sich vollständig zu Fuß versorgen ‒ und es gibt keinen Gastbetrieb! 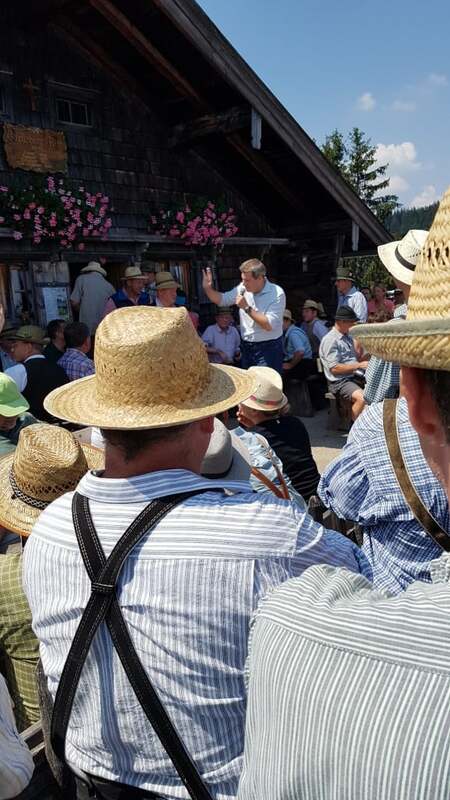 Marcel Huber richtete einige Worte an die Almbauern. 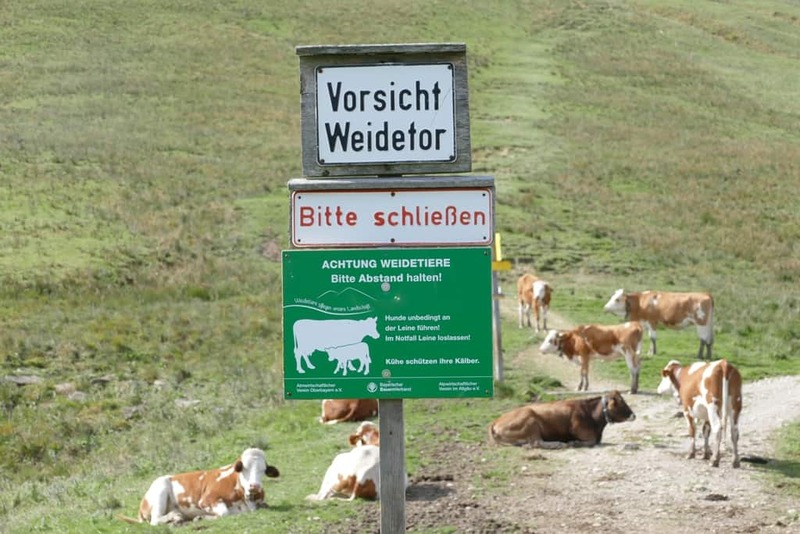 Er würdigte die harte Arbeit der Almbauern, die mit ihrer Bewirtschaftung der Almen auch eine wichtige Aufgaben für den Erhalt unserer Berglandschaft beitragen und sicherte ihnen auch weiterhin staatliche Unterstützung zu. 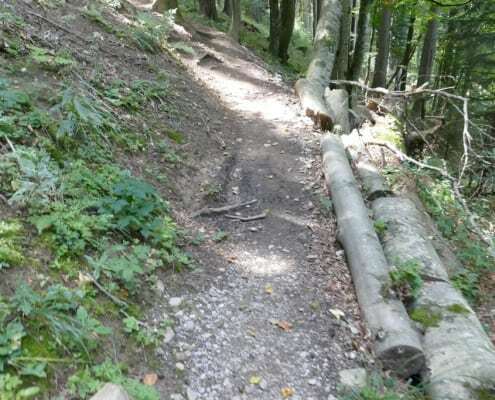 Über einen schönen im Wald gelegenen Steig führt der Weg uns bergab und auch wieder etwas bergauf, bis wir zu den Almwiesen der Kreuzbergalm kommen. 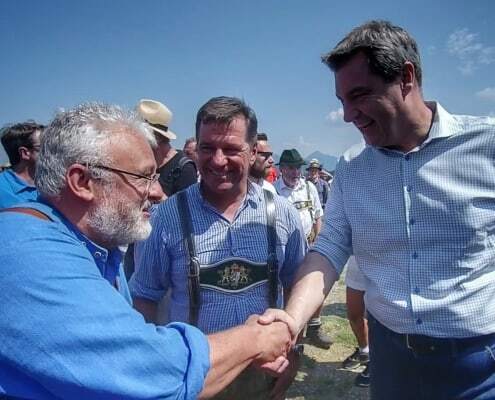 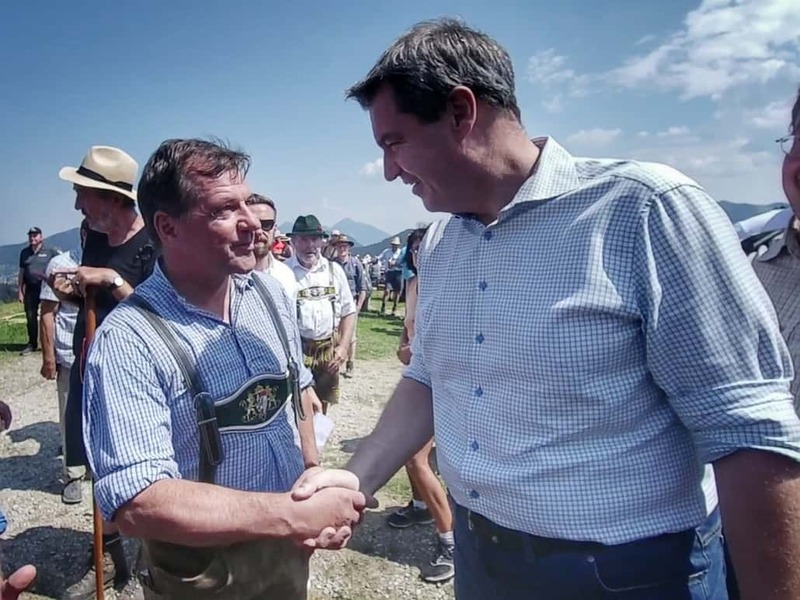 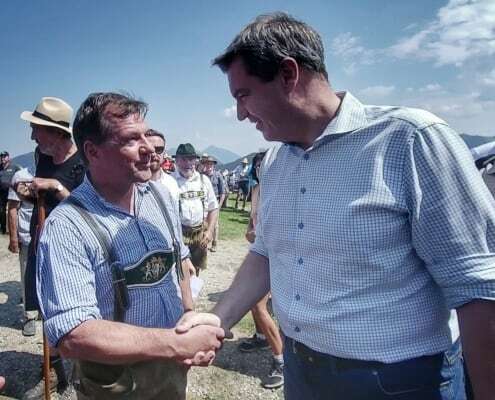 Hohe Prominenz erwartet uns schon ‒ Ministerpräsident Dr. Markus Söder. 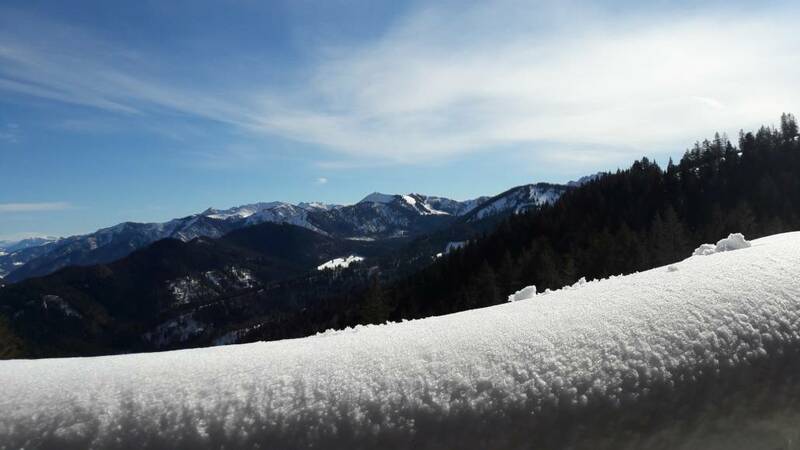 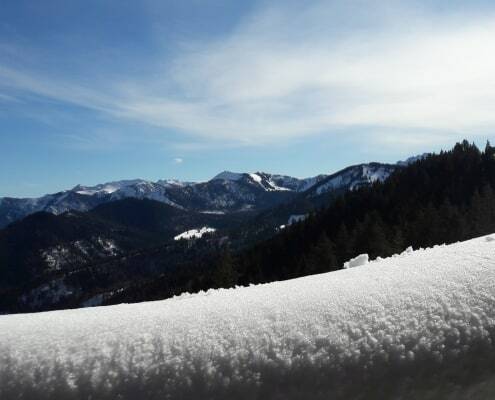 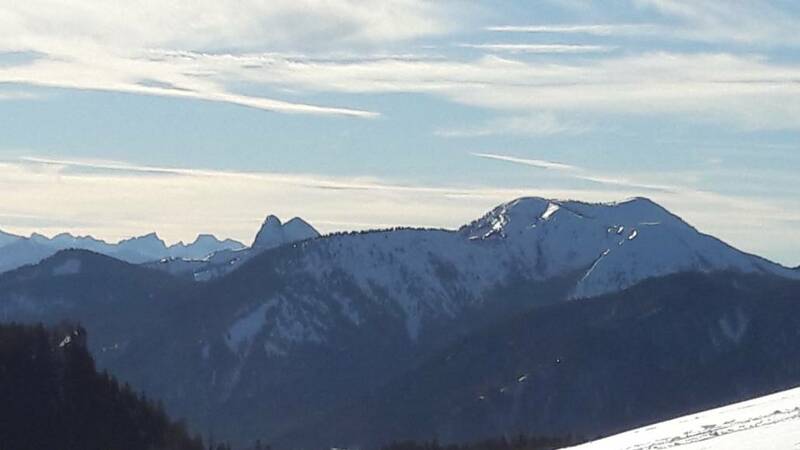 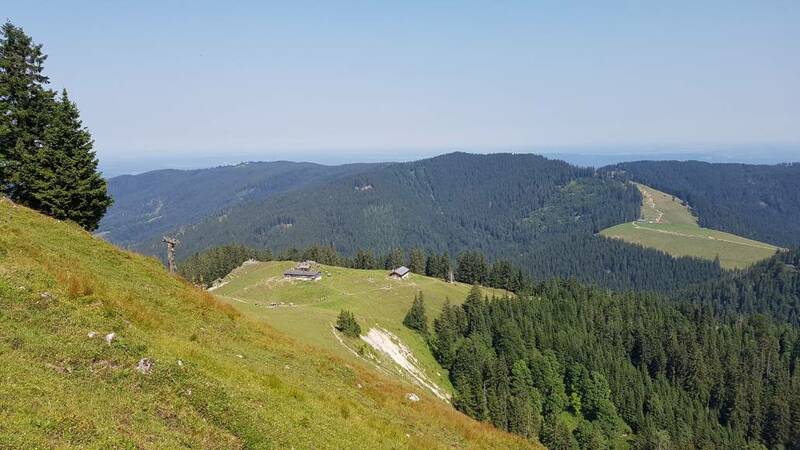 Auch er richtet sein Wort und seinen Dank an die zahlreichen Almbauern und Almbäuerinnen, die Bayern, unsere Alpen- und Almregionen so einzigartig in Deutschland machen, und dass es in jeglicher Hinsicht wichtig ist, die Almen in ihrer ursprünglichen Art zu erhalten. 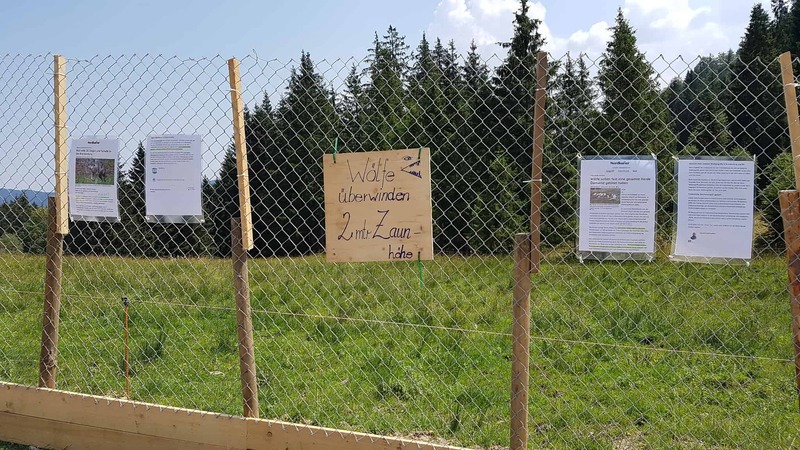 Beim Thema Wolf ist er der Meinung, dass es sicher von Bedeutung ist, die Wölfe zu schützen, dass es aber wichtiger ist, die Bevölkerung sowie die Land- und Almwirtschaft zu schützen und zu unterstützen. 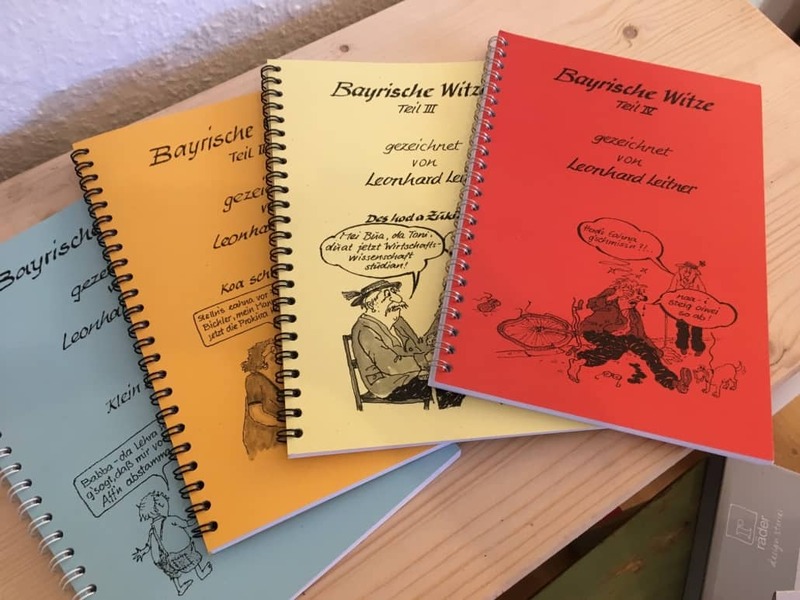 Weiter geht es zur Gindlalm. 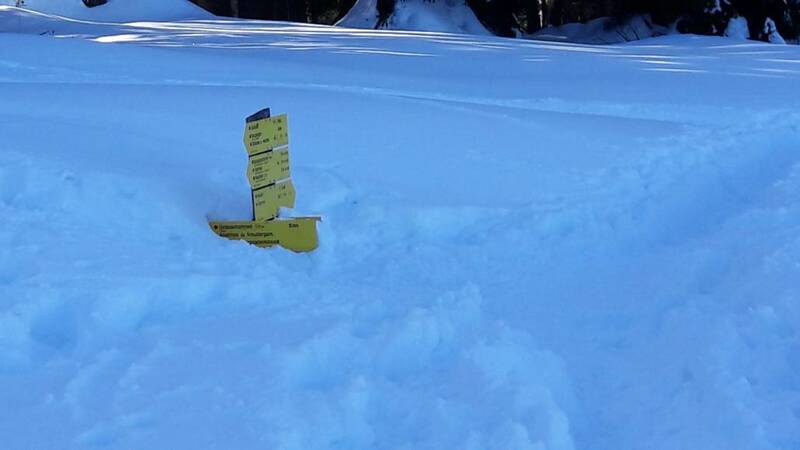 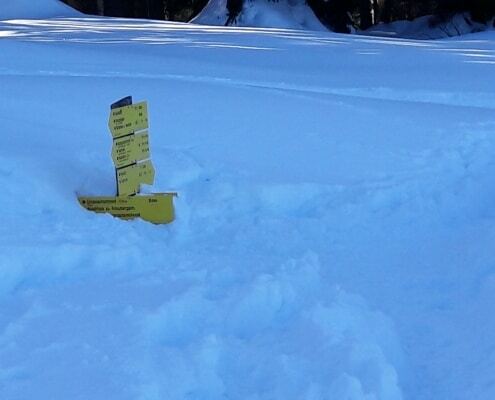 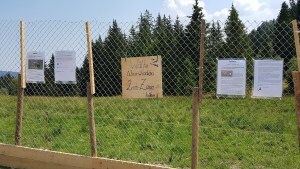 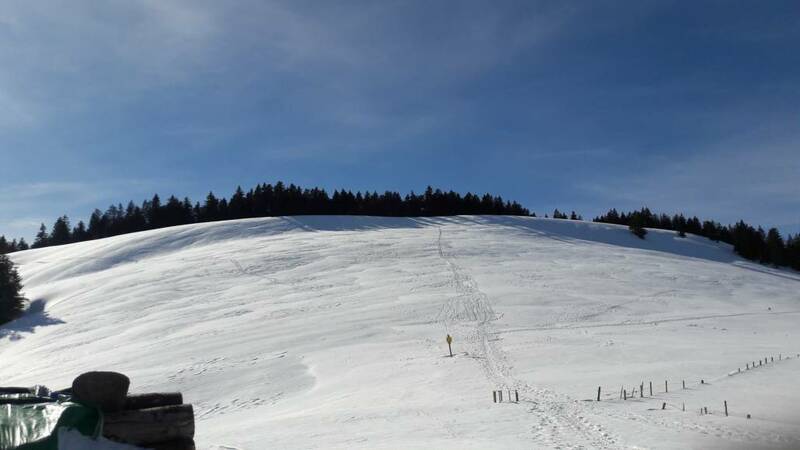 Oben auf der Gindlalmschneid wurde demonstrativ der Weg so eingezäunt, wie er in etwa sein müsste ‒ als Schutzzaun. 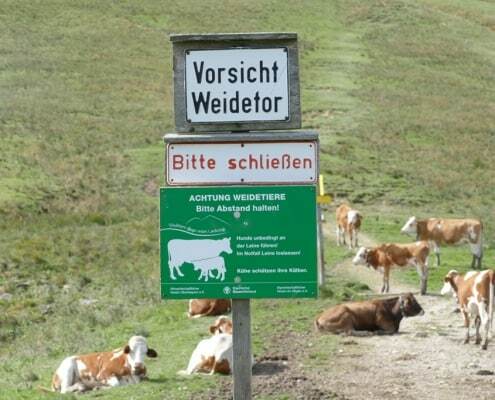 Eine schreckliche Vorstellung, dass durch unsere schöne Landschaft zwei Meter hohe Zäune verlaufen. 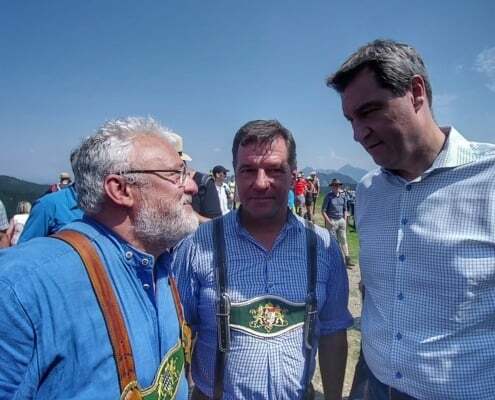 Auf der Gindlalm wurde ein Zelt aufgestellt, das den Wanderern wieder etwas Schatten verschaffte. 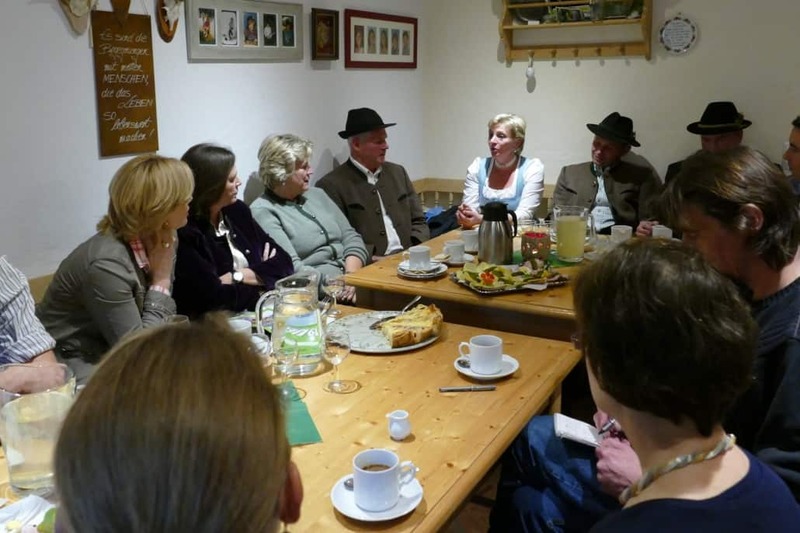 Auch fürs leibliche Wohl wurde wieder sehr gut gesorgt, und unsere Ministerin für Landwirtschaft, Forst und Ernährung, Michaela Kaniber, richtete ebenfalls noch ein paar schöne Worte an die Almbauern. 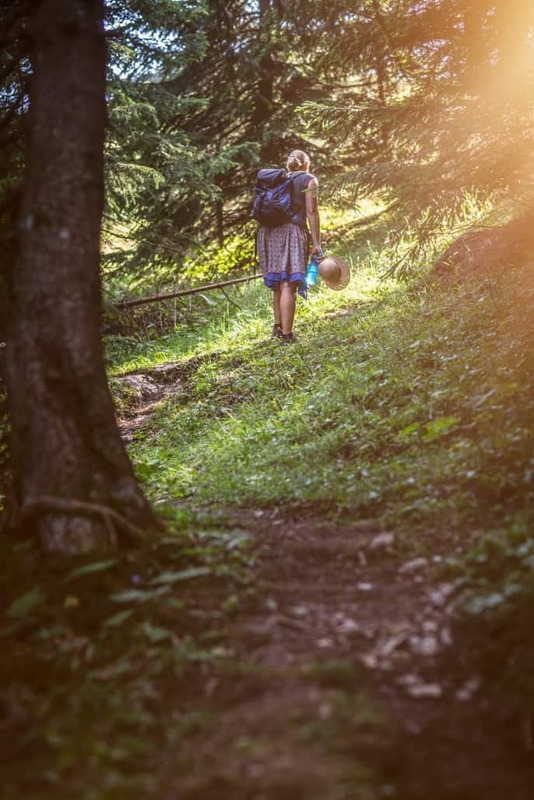 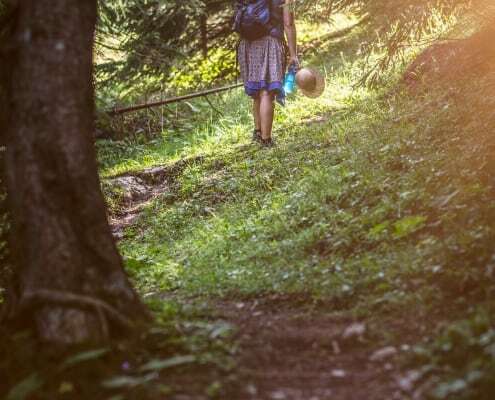 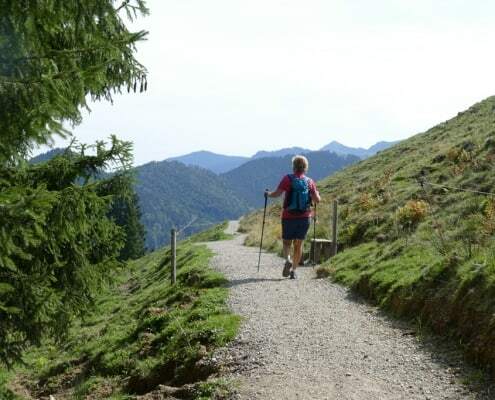 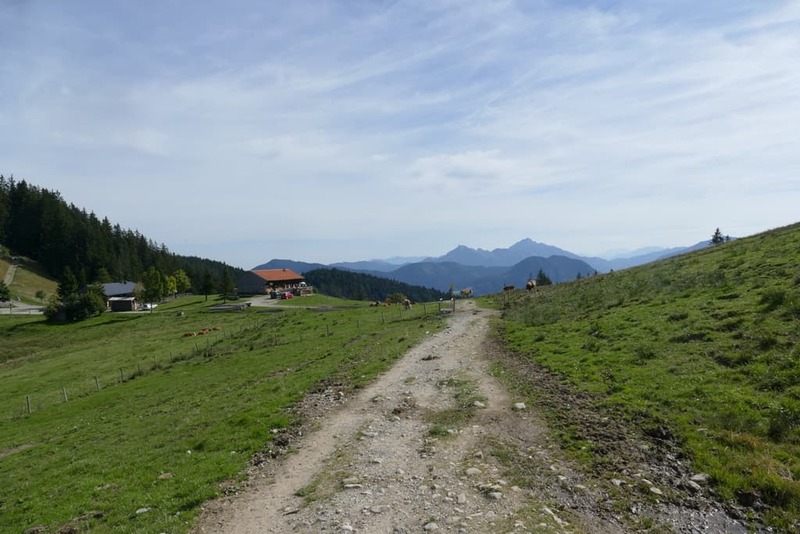 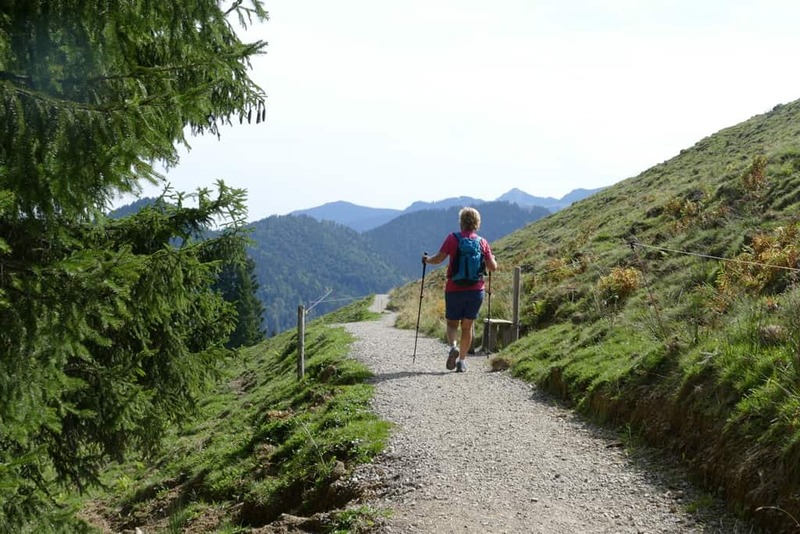 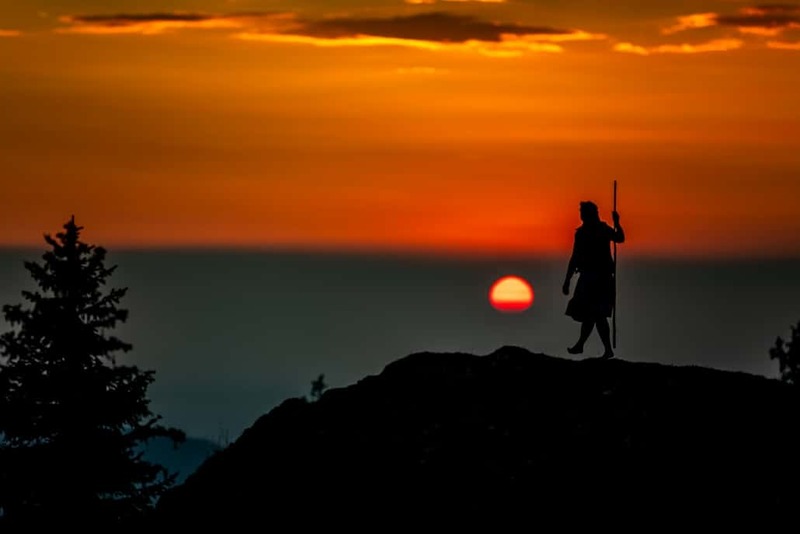 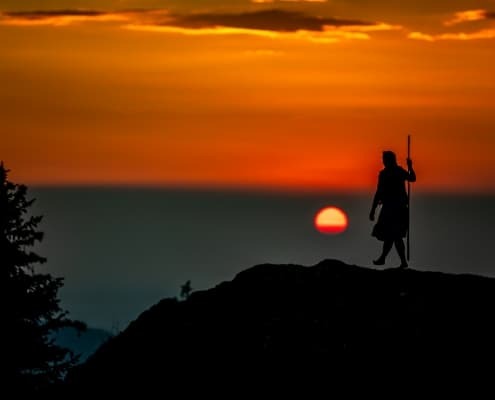 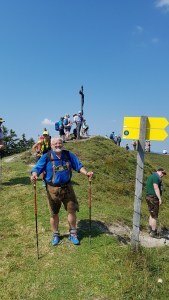 Ihr ist eine enge Zusammenarbeit mit dem Almbauerverband wichtig, und sie fand es sehr schön, bei einer Wanderung in dem lockeren Rahmen mal entspannte Gespräche zu führen. 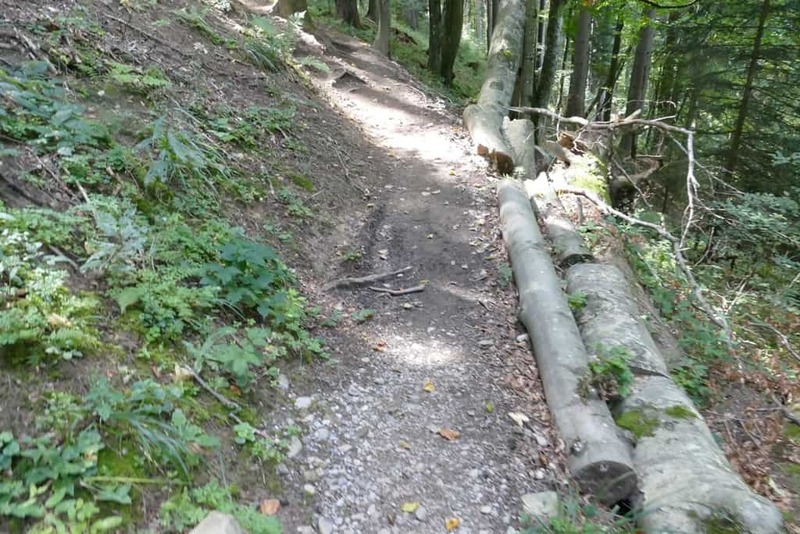 Sie wurde mehrfach auf das Verhalten von achtlosen Wanderern und Mountainbikern hingewiesen und möchte dazu auf jeden Fall eine Kampagne starten. 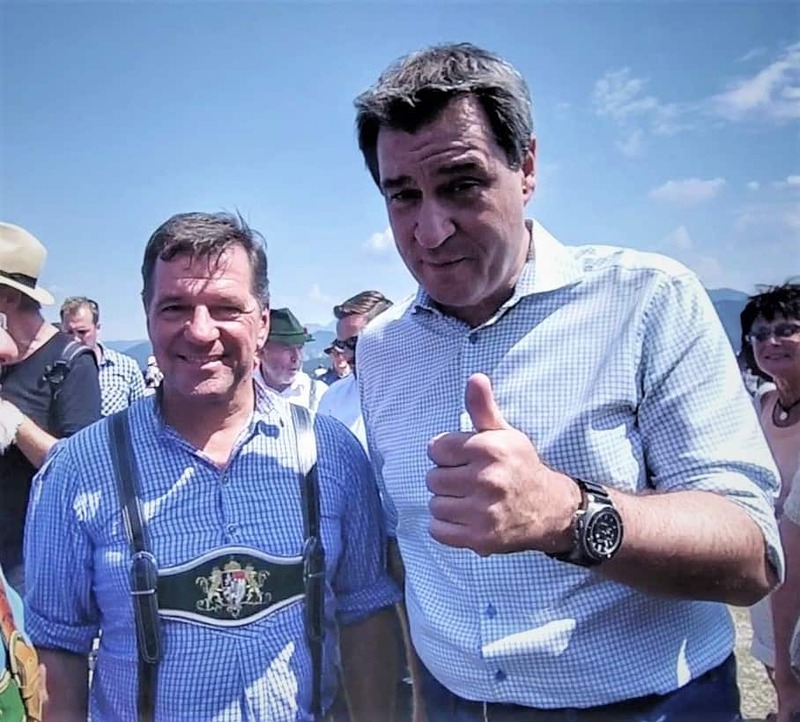 Das finde ich auch eine gute Sache, dass wir alle wieder achtsamer und mit Respekt miteinander umgehen und uns entsprechend wie Gäste verhalten. 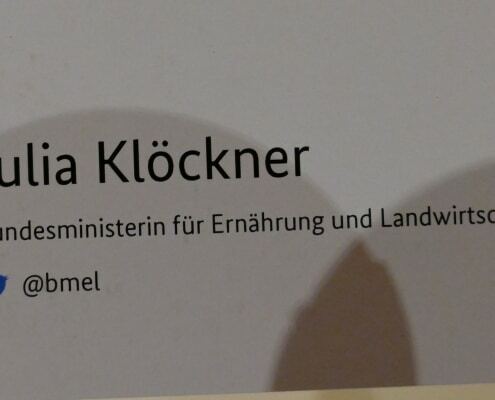 Wir haben es geschafft, Frau Kaniber vor unsere Kamera zu bekommen. 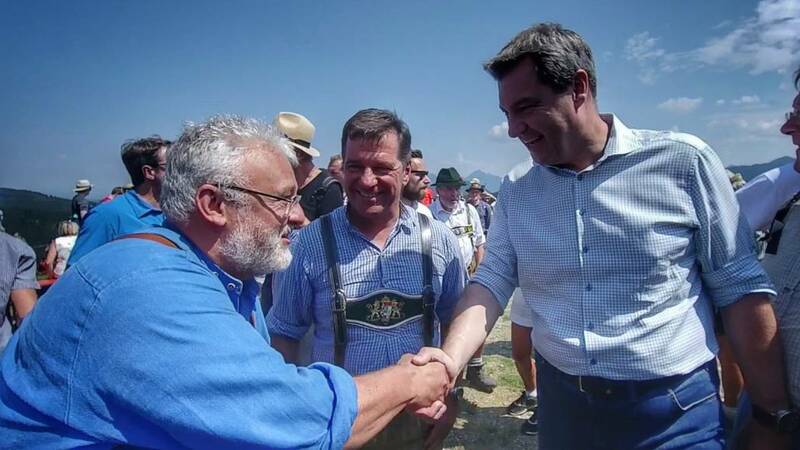 Zwei Landräte haben wir dann auch noch befragt, wie es ihnen gefallen hat. 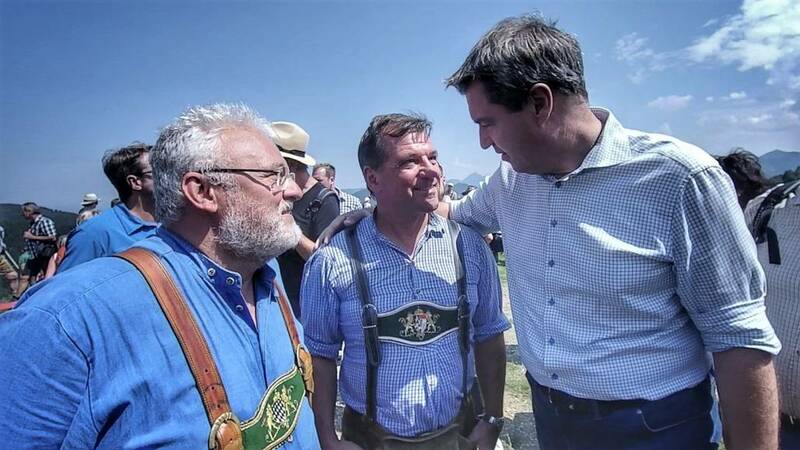 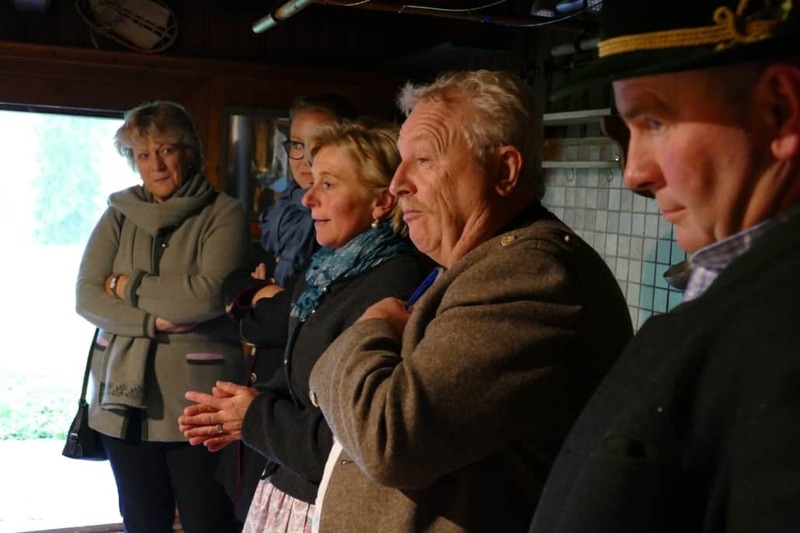 Die Landräte Josef Niedermaier aus Bad Tölz und Anton Speer aus Garmisch-Patenkirchen waren auch ganz begeistert, was der AVO (Almwirtschaftliche Verein Oberbayern) auf die Beine stellt, und befürworten diese Veranstaltung absolut. 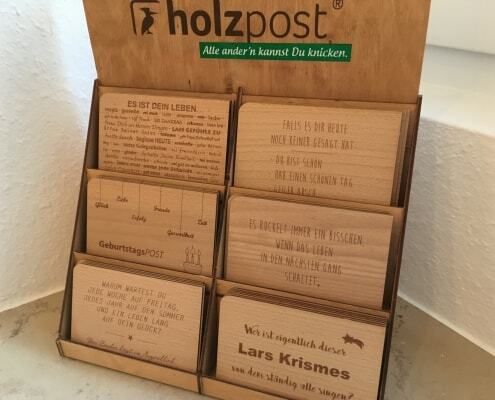 Eine tolle Sache! 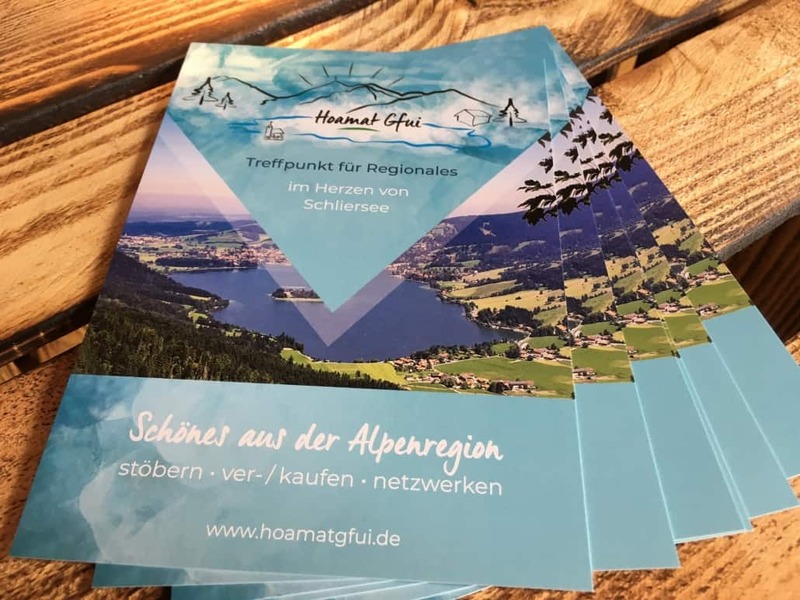 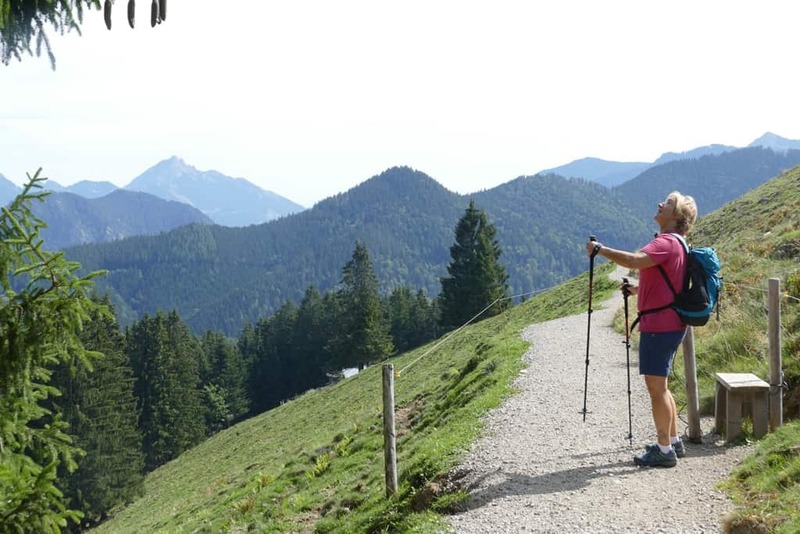 Auf unserem Rückweg von der Gindlalm wieder nach Schliersee hatten Mathias Schrön und ich das Gefühl, dass die Hauptalmbegehung ein rundum gelungener Tag für die Almbauern und Almbäuerinnen sowie ihre Almhelfer und Freunde war. 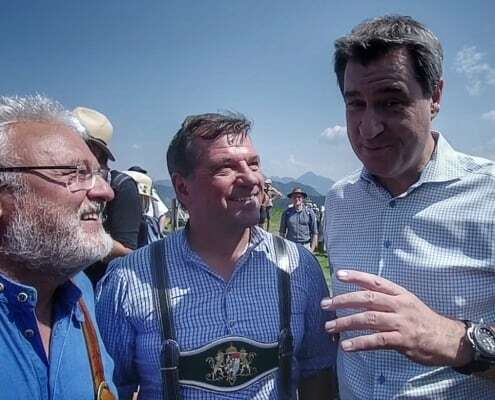 Die Stimmung war sehr gut! 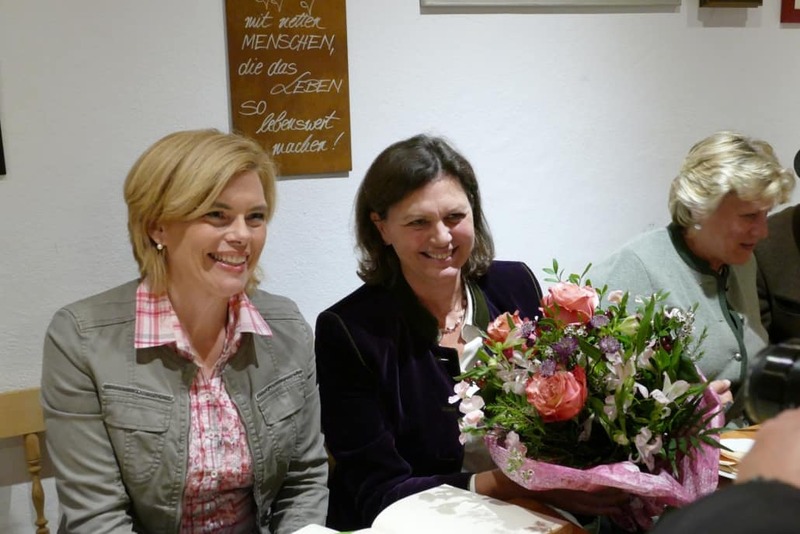 Wer jetzt auch gerne dabei gewesen wäre, sollte sich schon mal den Almbauerntag am 14. 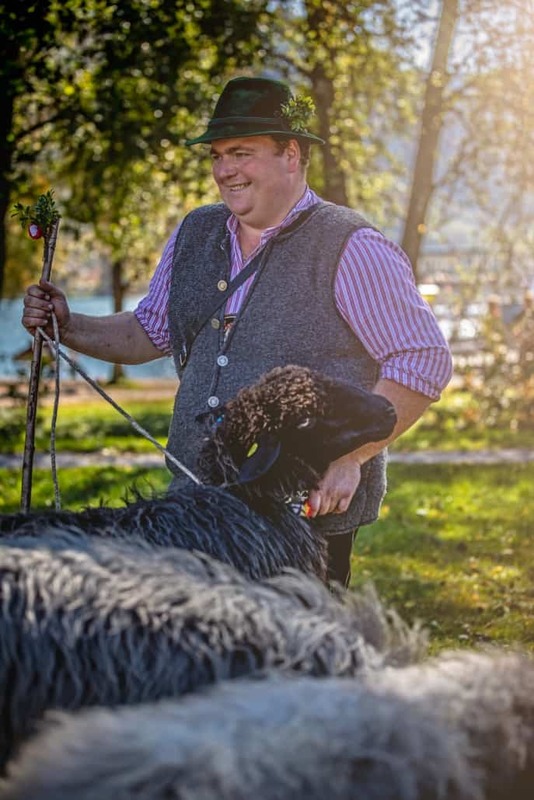 Oktober in Schliersee vormerken.